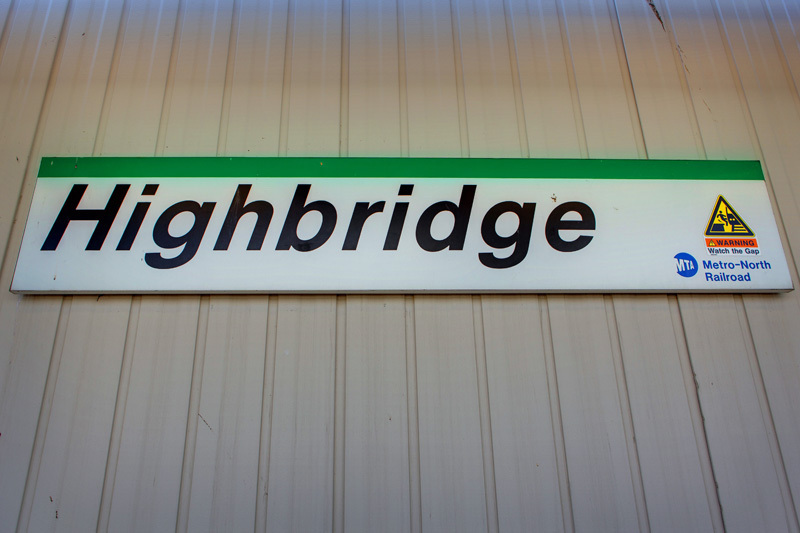 If there was one station that missed in our three year long tour of Metro-North’s system, it would likely be Highbridge. 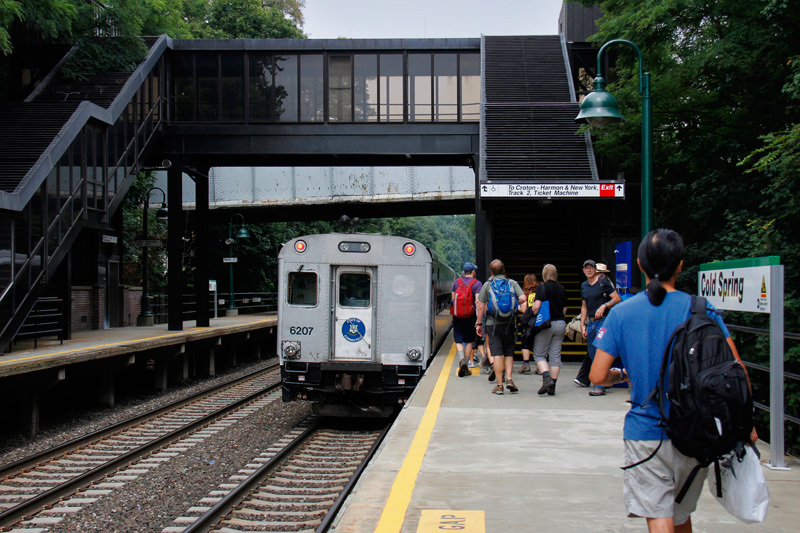 Although in the past it was a station open to public access, today it is an employee-only station, complete with a small platform and overpass, and many of the same amenities one would expect from a regular Metro-North station. 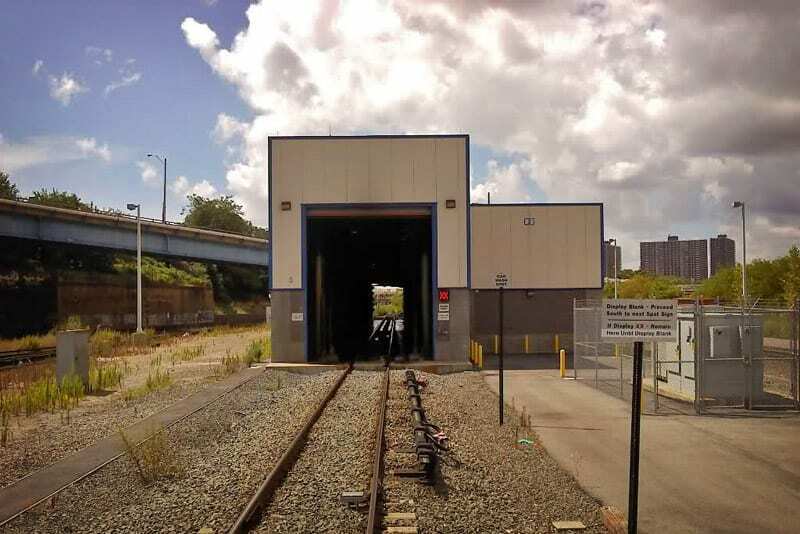 I figured today might be a good day to check out this station that is normally off limits to the public, especially since High Bridge has been in the news recently. 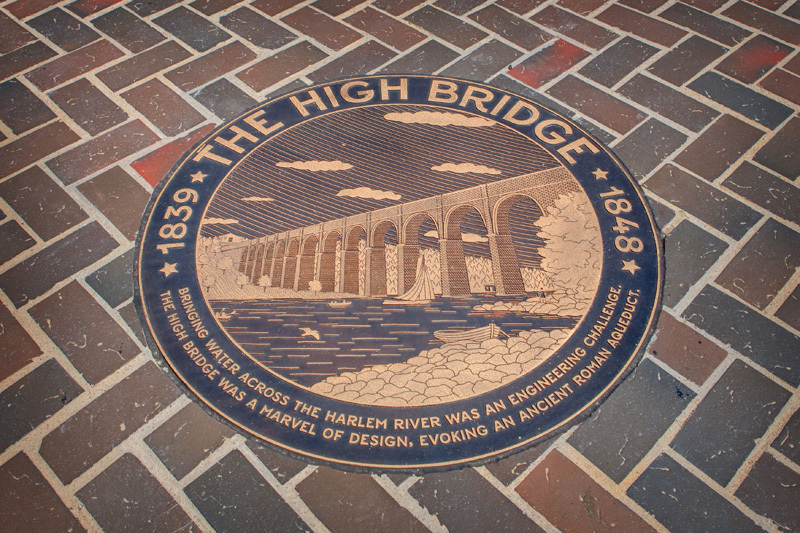 The famous High Bridge, New York City’s oldest bridge. 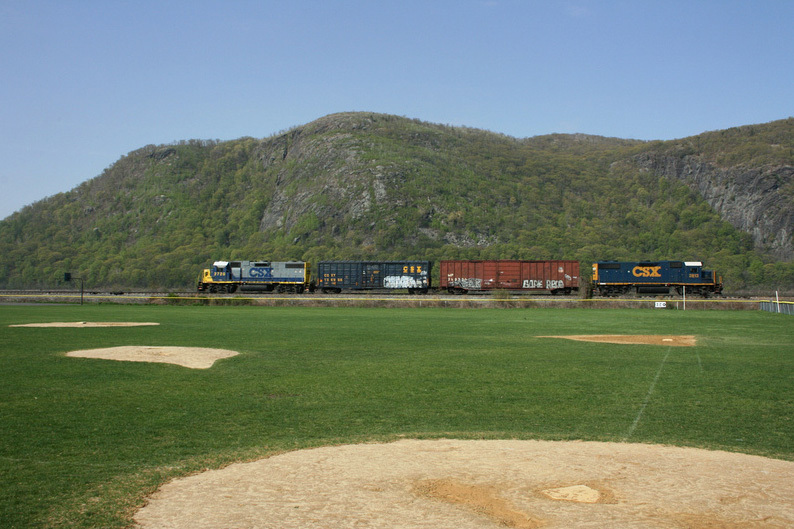 The facility here is, of course, named after the Aqueduct Bridge, or better known as High Bridge. 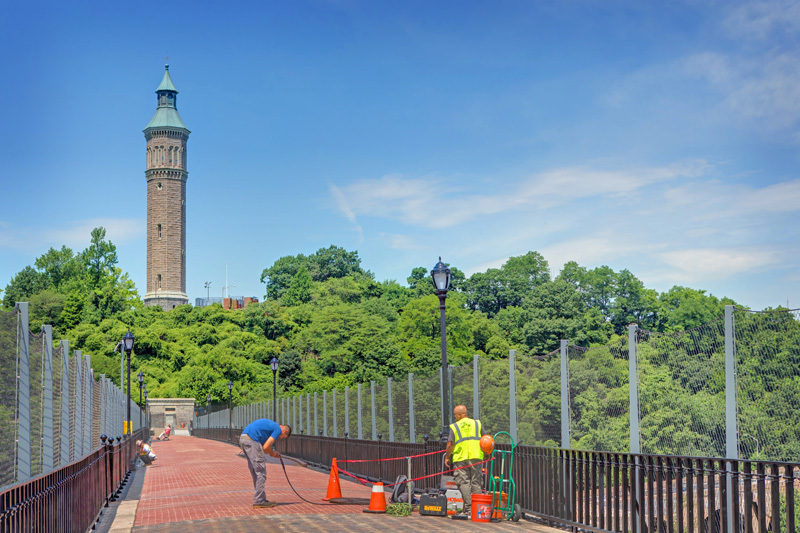 The bridge’s roots stretch all the way back to 1848, making it the oldest bridge in New York City. As one would gather from its original name, the bridge was an important part of the Croton Aqueduct, supplying New York City with fresh water. 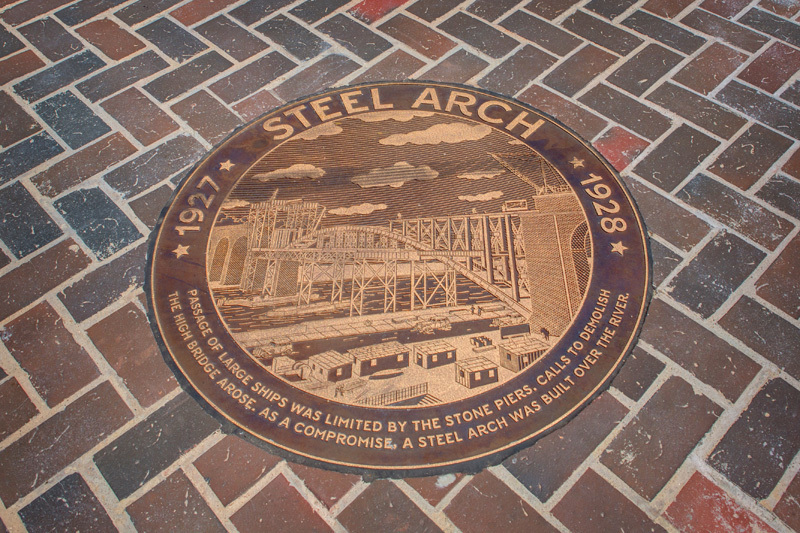 Originally a stone arch bridge, five of the arches were replaced with one steel arch in 1928 to allow easier water navigation under the bridge. 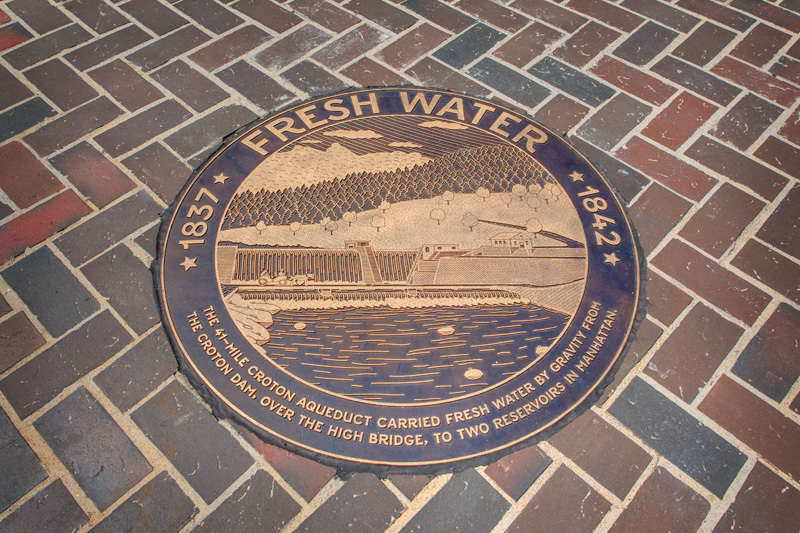 By this time the bridge was largely obsolete, and no longer carrying water – however it did serve a secondary purpose as a pedestrian crossing. 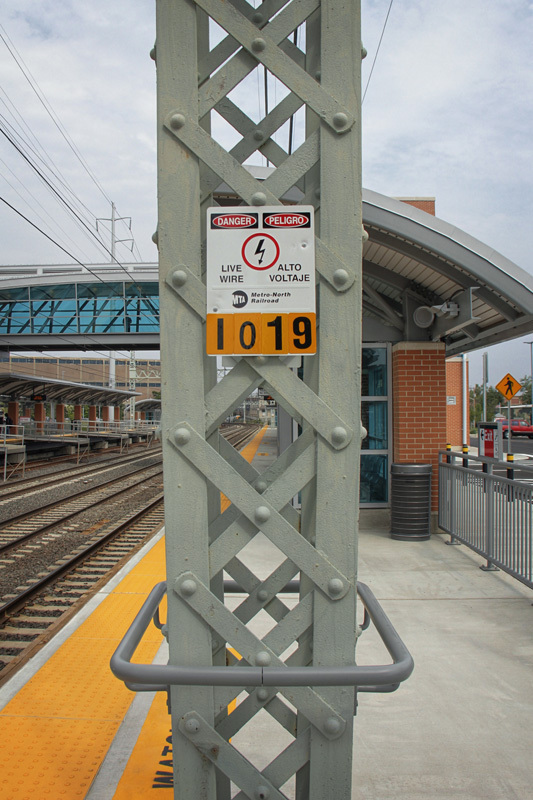 That crossing was closed in the 1970s, until it was recently reopened last month after many years of restoration. 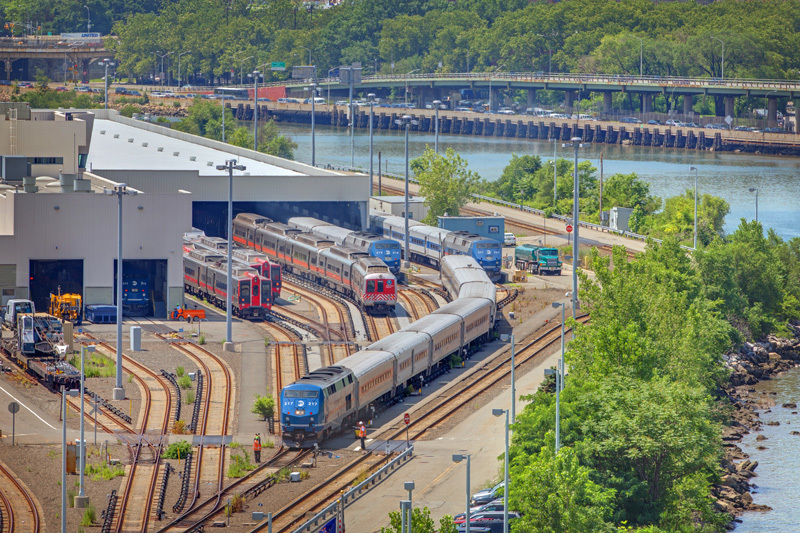 From the newly reopened pedestrian crossing, one can get quite a good view of what is now a Metro-North railroad facility below. 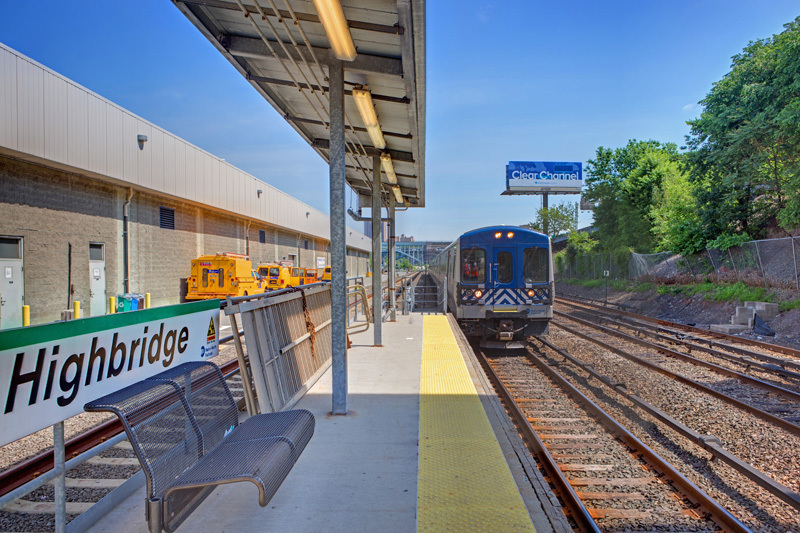 Today, Highbridge is where you will find Metro-North’s Car Appearance Facility, where both interior and exteriors of train cars are cleaned. 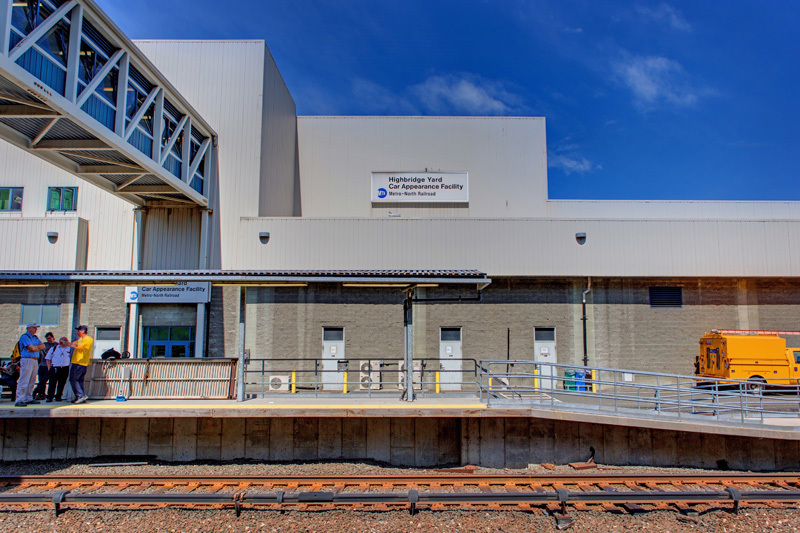 Highbridge is one of three Metro-North washing facilities, and it possesses state-of-the-art brushes and sprayers that use 280 gallons of water per minute – 200 gallons of which are recycled, making it more environmentally friendly. 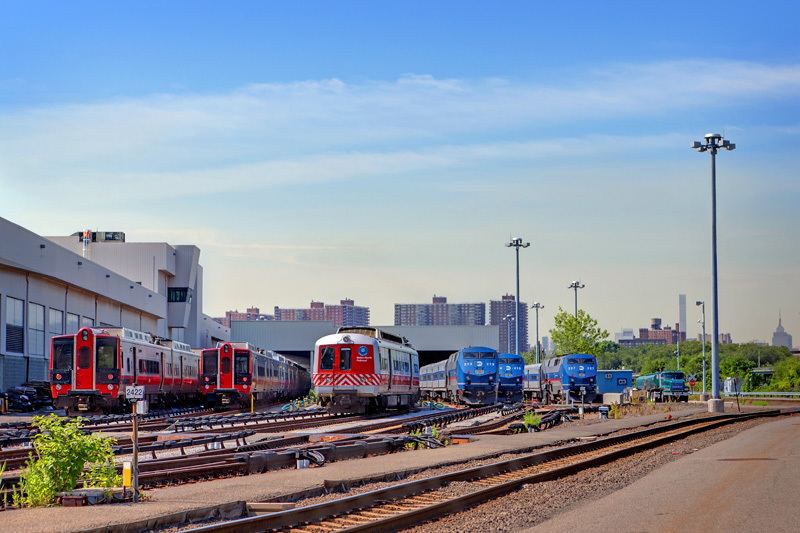 20 cars can be cleaned every shift, and each car gets this full treatment about every 60 days. The washing is completely computerized, and does not require an operator. 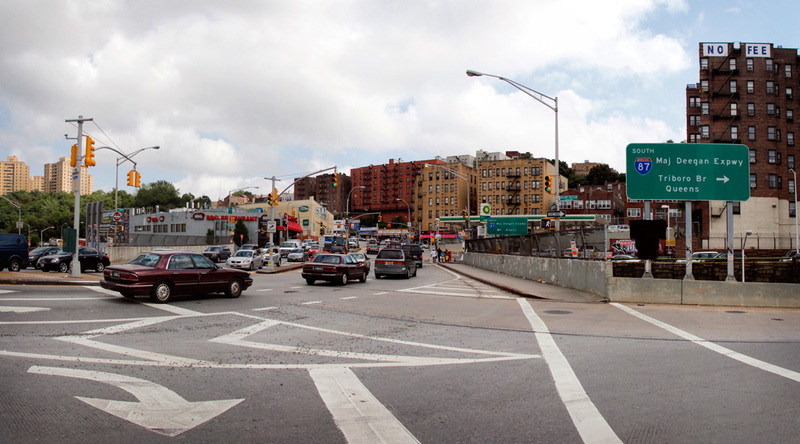 Heading into the Highbridge car wash. Photo by Paul Pesante. 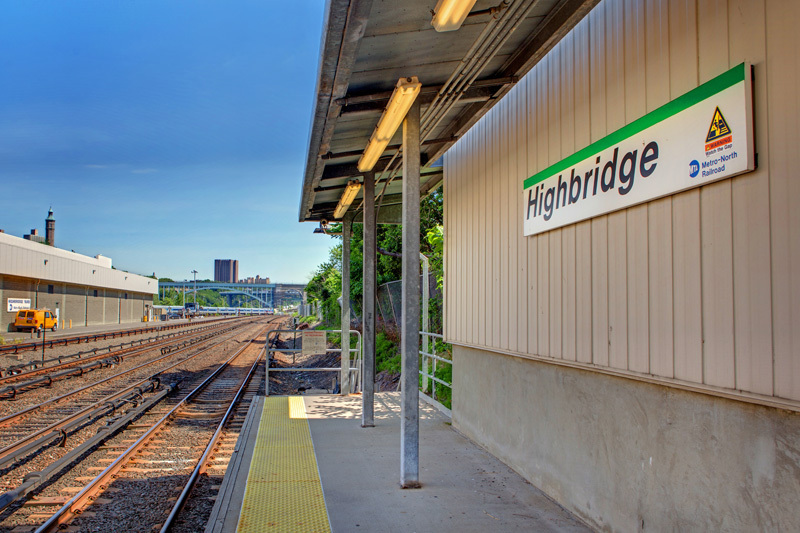 In addition to the appearance facility, Highbridge provides storage tracks for trains that is close to the city. 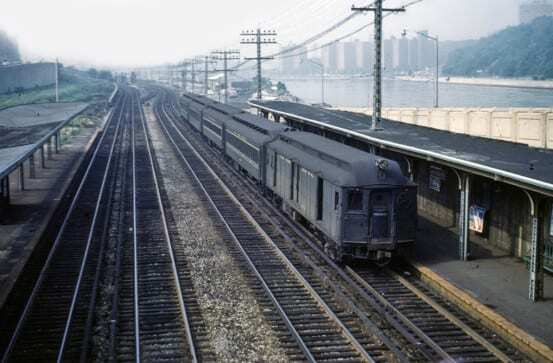 While in days gone past, the New York Central used Mott Haven for this purpose, most of Mott Haven’s tracks were ripped out long ago. 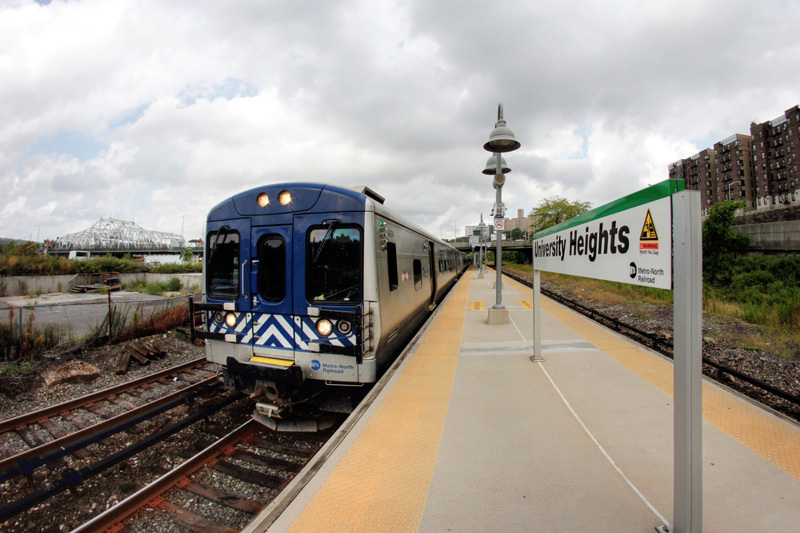 Highbridge has stepped up to fill that gap, which will especially be needed due to the East Side Access project, where Metro-North needed to give up quite a few storage tracks in Grand Central in order to bring Long Island Rail Road trains to the east side. 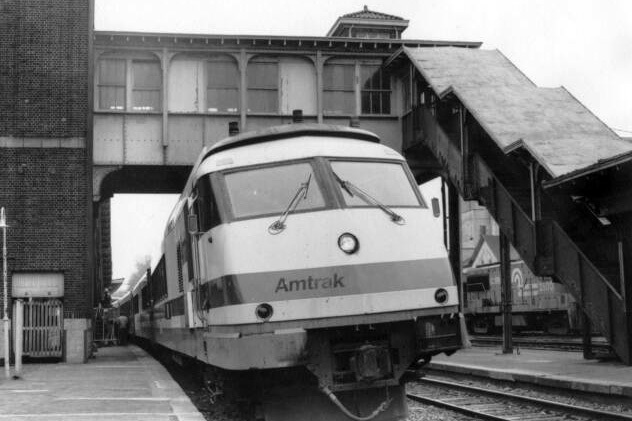 The original passenger station at High Bridge in 1961. 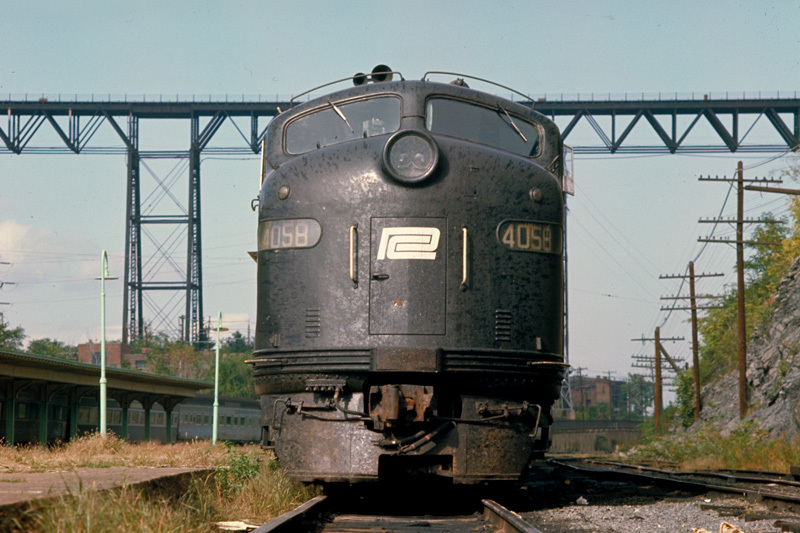 Photo by Ed Davis, Sr., from the collection of David Pirmann. 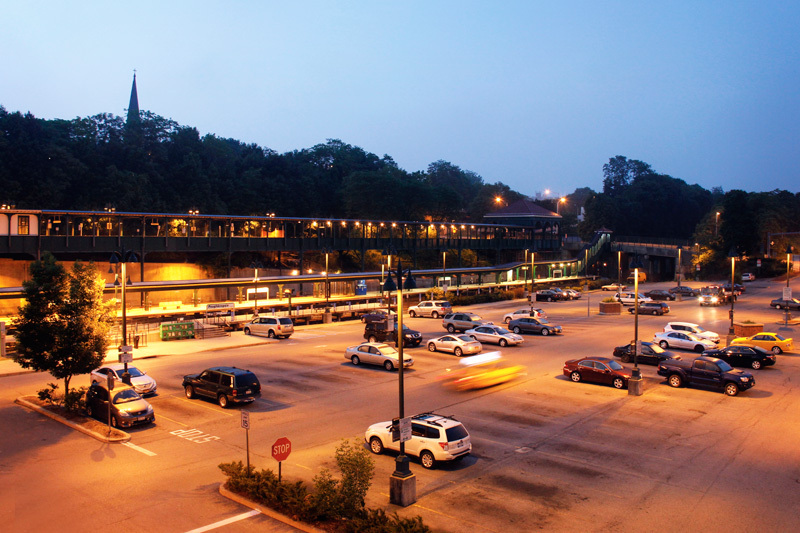 By the 1970s the station had some scheduled trains, while on others it was listed as a flag stop. 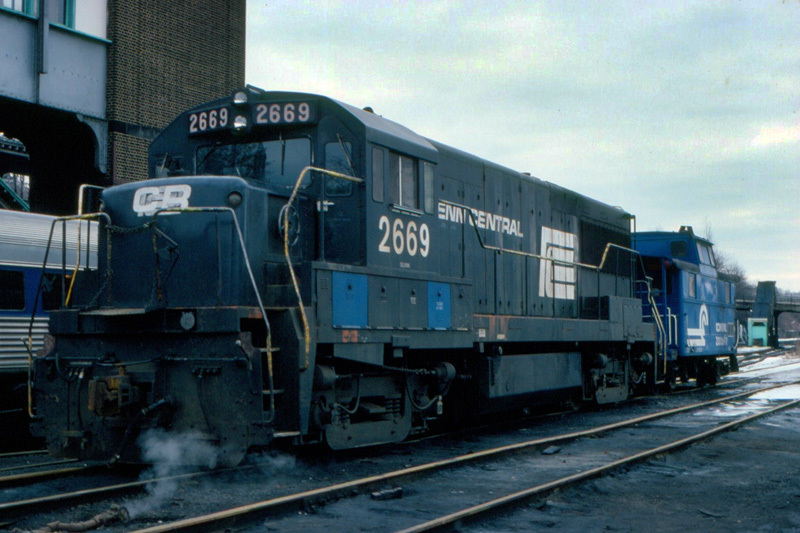 Other noteworthy details about Highbridge are that you can see some old remnants of the New York Central’s Putnam Division here – Highbridge was a point of transfer between the Hudson and Putnam Divisions. 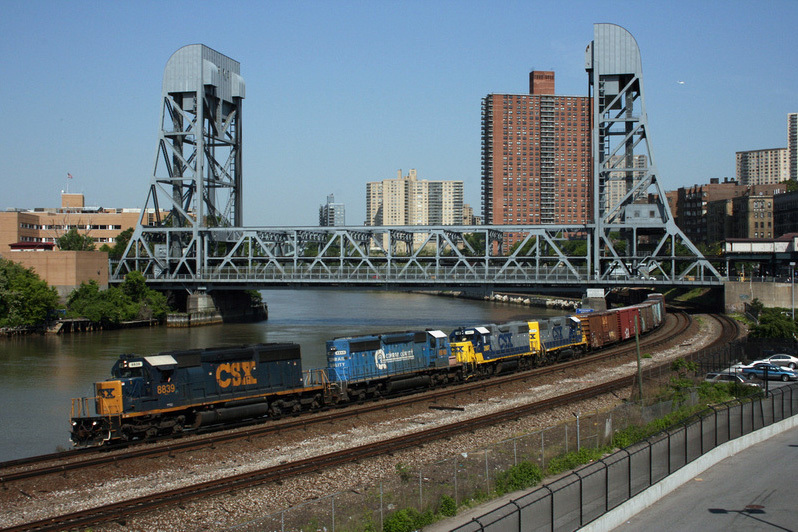 It is also where the Oak Point Link joins with the Hudson Line, permitting freights to avoid the bottleneck of Mott Haven to get to Oak Point Yard. 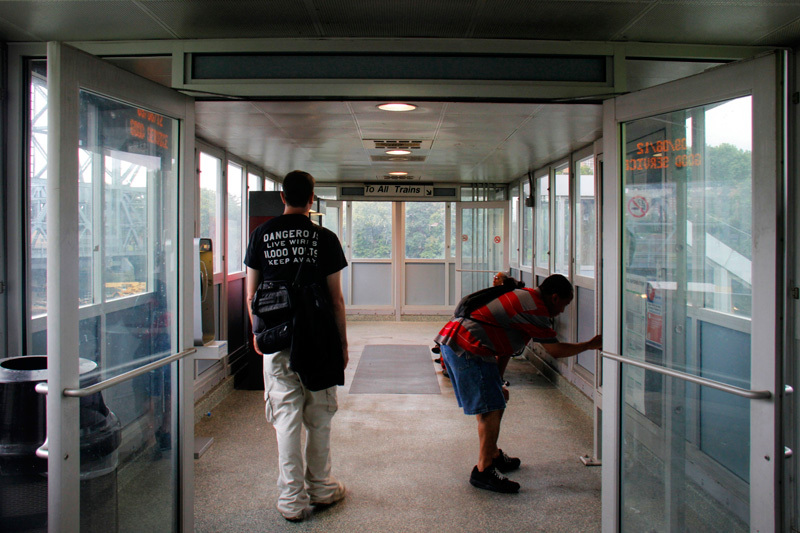 Anyway, let’s take a quick behind-the-scenes glimpse of Metro-North’s official employee station at Highbridge… the only place we neglected on our original tour of the Hudson Line. 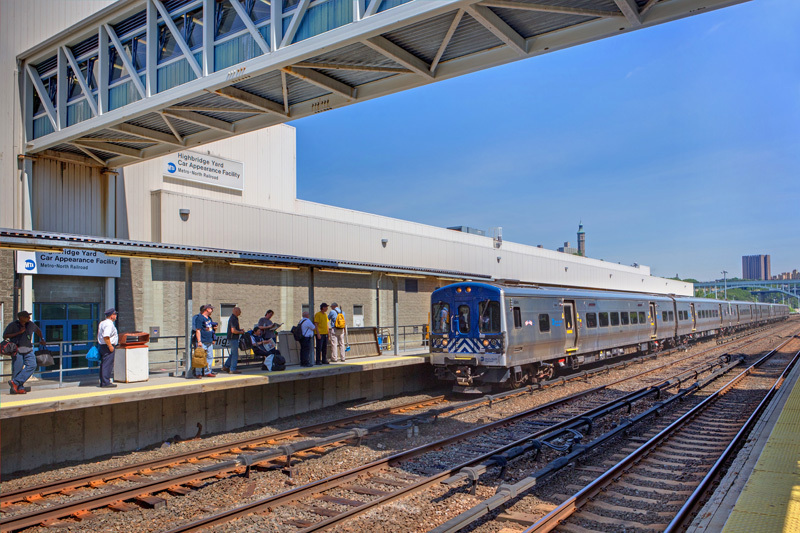 Giving Devon Transfer its own Tuesday Tour post may be a little bit of a joke, considering it is only a temporary station, nonetheless it is certainly worth a few minutes to check out. 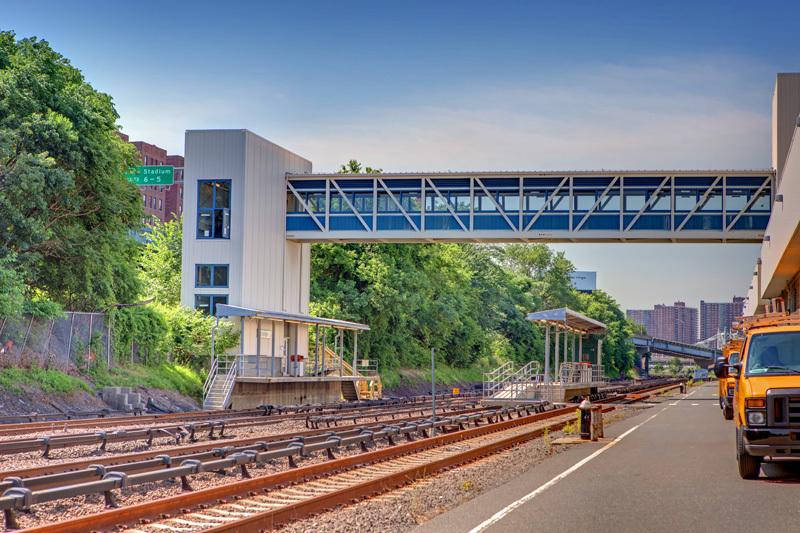 Intended to be in place for only six months, the transfer station facilitates passengers getting from the main New Haven Line over to the Waterbury Branch while Track 3 is currently out of service on the Devon Bridge for work. 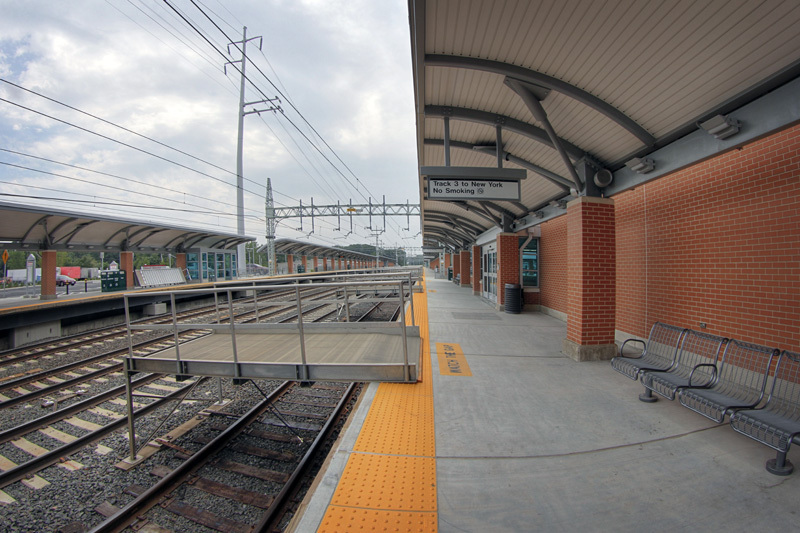 The v-shaped platform at Devon Transfer skirts the far end of the wye, allowing riders to essentially walk from the New Haven main line right over to the start of the Waterbury Branch and board their next train. 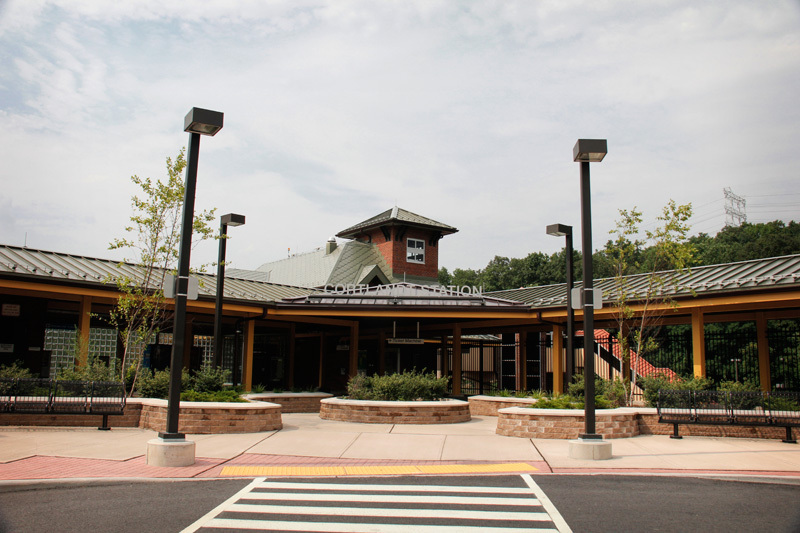 In some ways, Devon Transfer is not a true station – it is inaccessible to passengers in any form other than exiting a select main line train, or Waterbury Branch train. 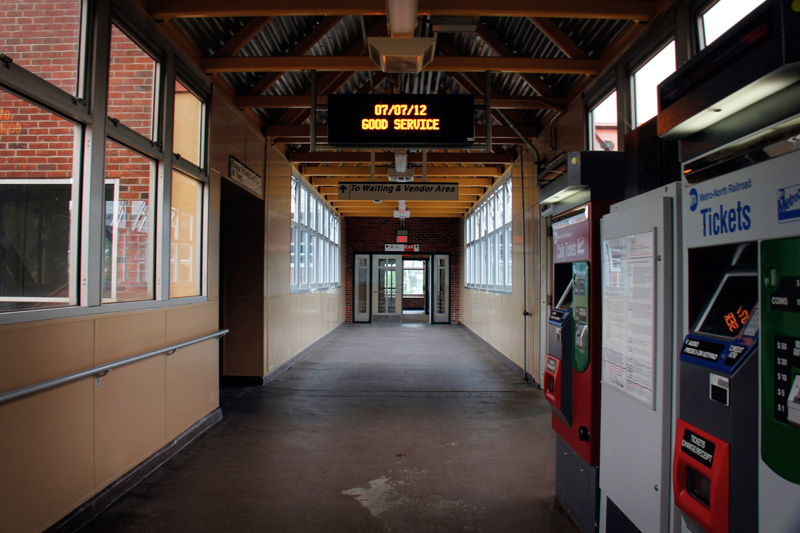 One cannot wait at Devon Transfer for any extended period of time – conductors, along with train masters and/or MTAPD are usually present to herd passengers from one side of the platform to the other and get on the connecting train, nor can one purchase tickets there. 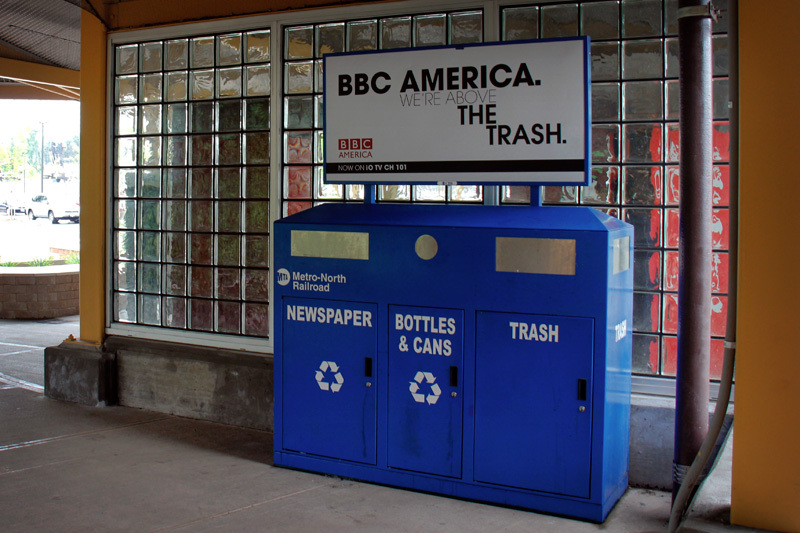 It does, however, have the typical trash bins one finds at Metro-North stations, lights for after hours, a public address system if ever necessary, as well as station name signs (I wonder who gets to keep these once work is done) on the platform. 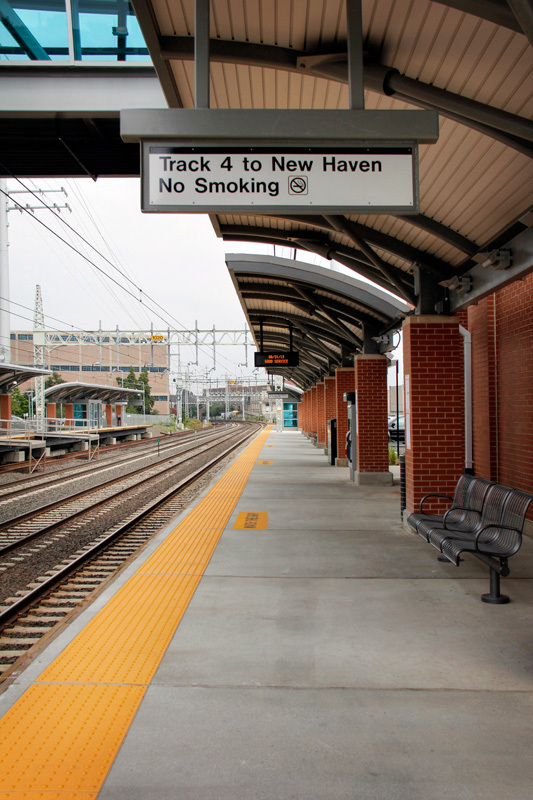 Utilizing the same wooden-style temporary platforms we’ve seen at other New Haven Line stations during track work, Devon Transfer is a decent substitute for keeping the Waterbury Branch running during the bridgework. 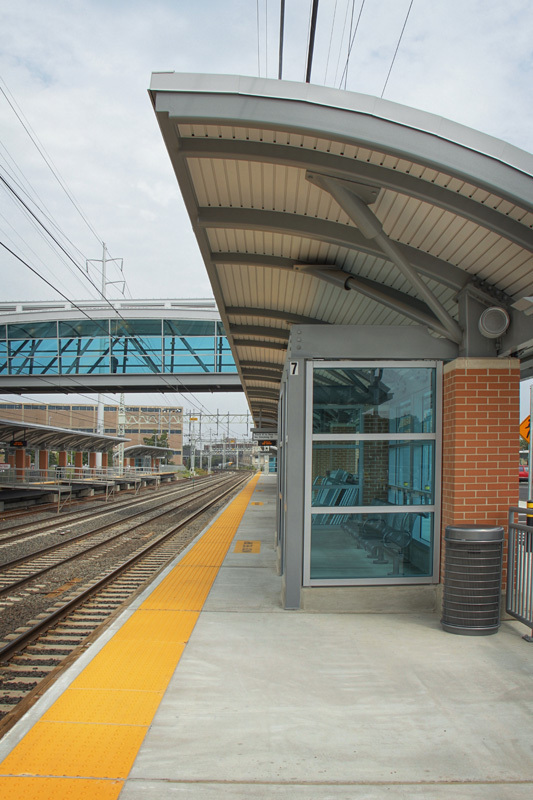 In fact, it is arguably nicer than some of the permanent stations on the Branch (Ansonia‘s low-level platform comes to mind). 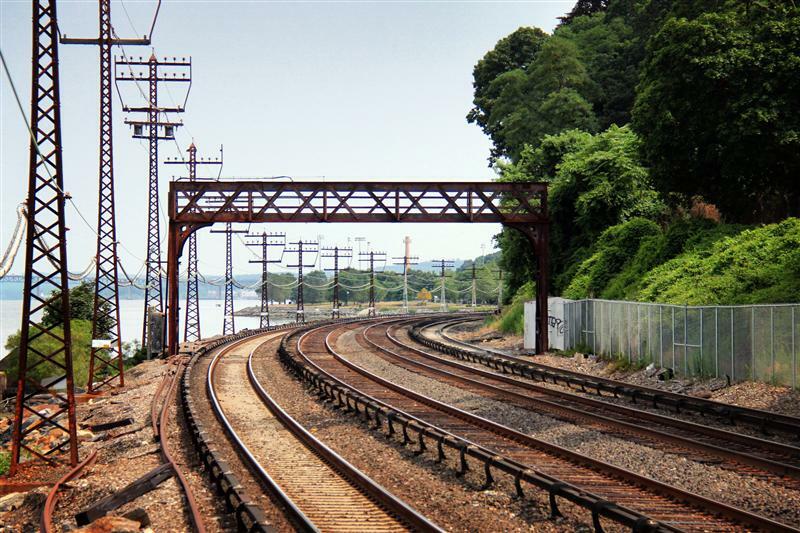 The Devon Bridge, currently undergoing work, with a six month expected outage on Track 3 (the one closest to the photographer in this picture). Aerial photographs of the Devon Bridge via the Historic American Engineering Record, Jack E. Boucher, photographer, taken April 1977. 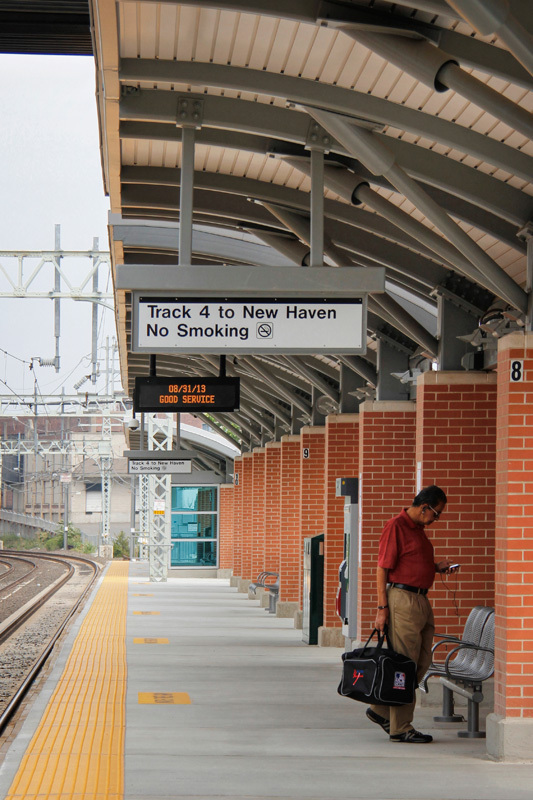 For most passengers, the transfer at Devon is relatively convenient, with the exception of anyone coming from/going in the direction of New Haven, who would have to make an additional transfer at Bridgeport for their journeys. 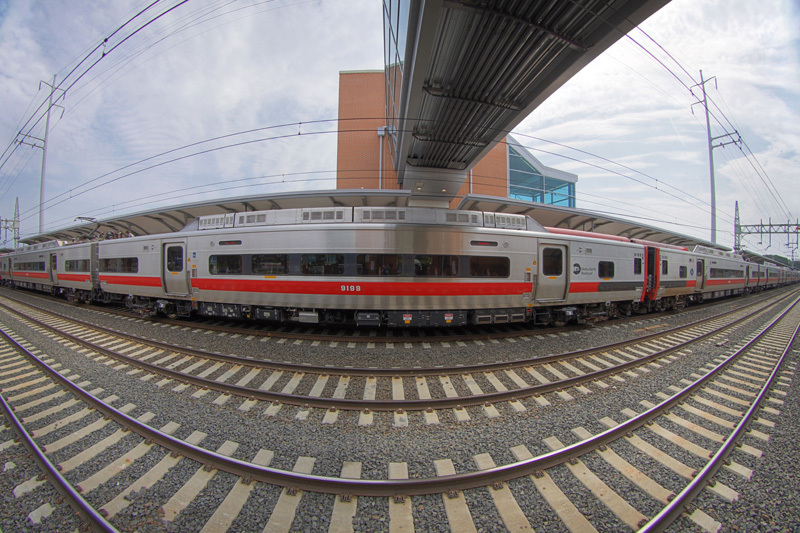 Additionally, all New Haven Line trains stopping at Devon will have an increased running time of about a minute, due to the extra stop. 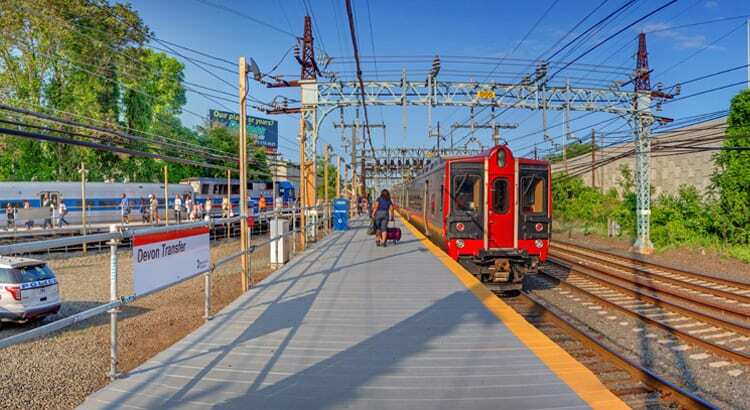 However, all of the work here is necessary to address one of the banes of the New Haven Line – its ancient movable bridges. 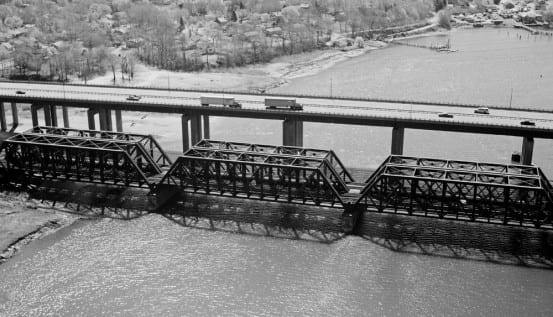 Crossing the Housatonic River, the Devon Bridge (also known as the Housatonic River Railroad Bridge) is a 110 year old, 1,067-foot long rolling lift bascule bridge. 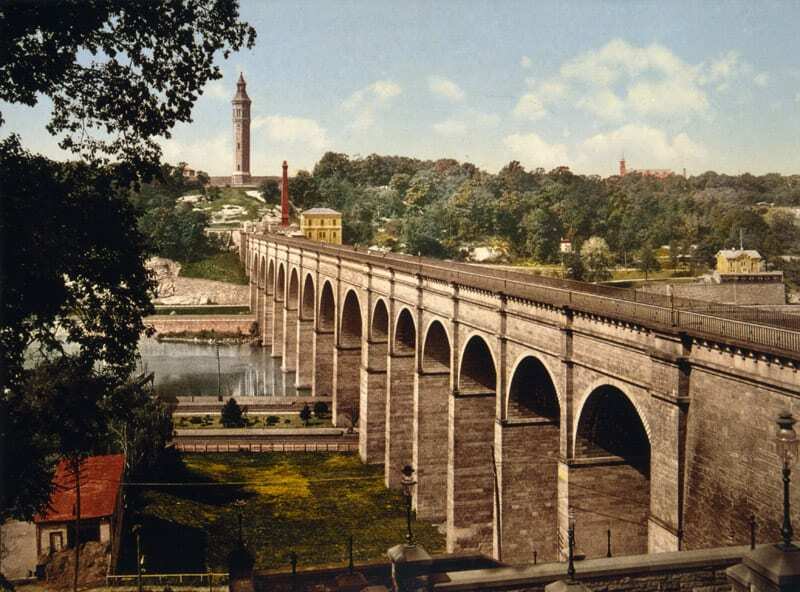 It was prefabricated by the American Bridge Company in Trenton, New Jersey, and installed in 1905. 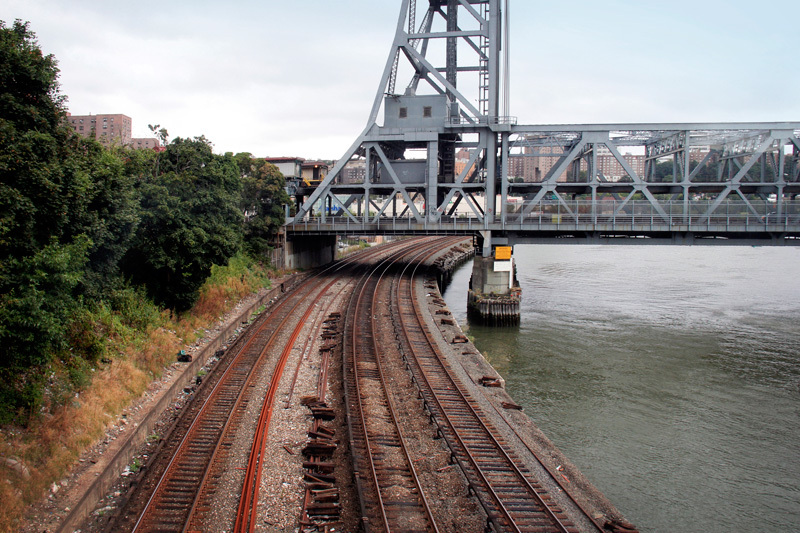 Although less problematic as the notorious swing bridges on the New Haven Line (namely WALK), it is well in need of some attention. 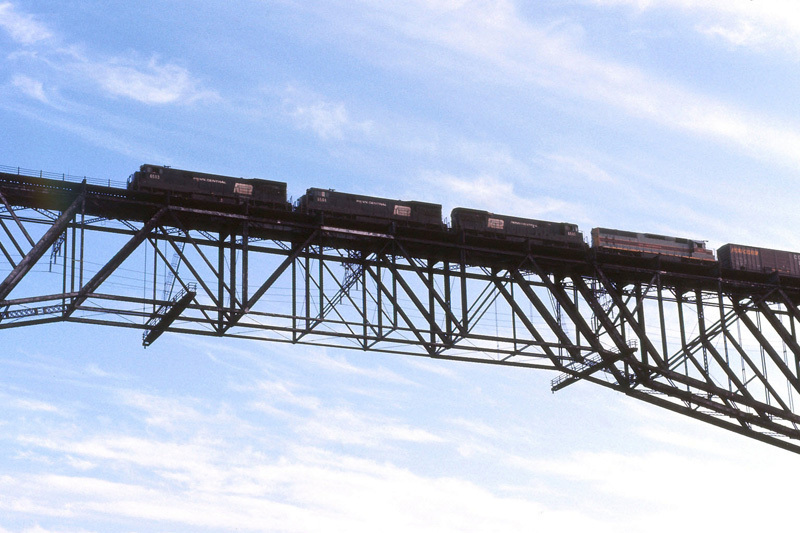 Suffering from the same lack of standardization found on many of the line’s movable bridges – each one being unique, with its own exclusive mechanical components – it requires custom created parts to fix. 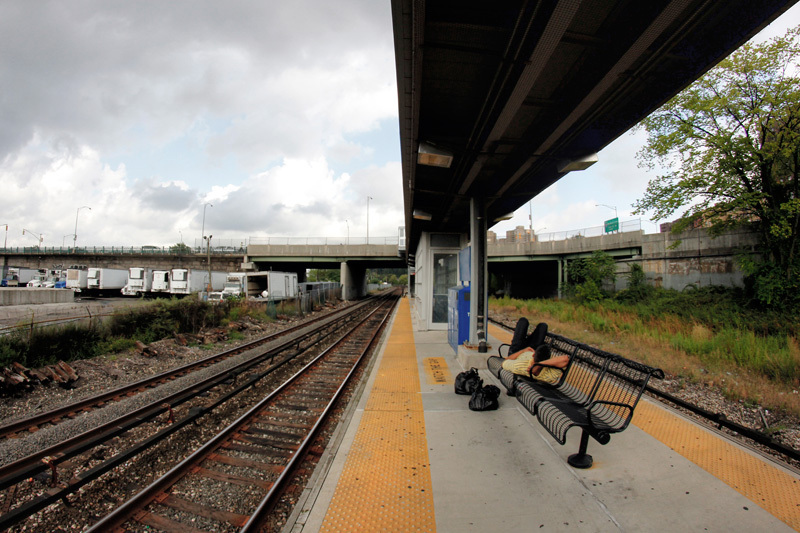 Unless you’ve been living under a rock for the past few weeks, you’re most likely aware that Metro-North has a new rail station. 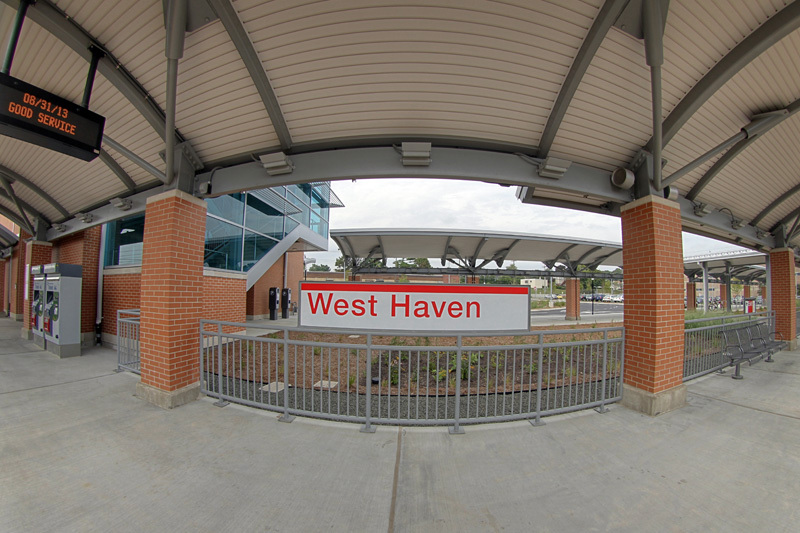 West Haven, on the New Haven Line, is Metro-North’s 124th active station, and one of just a handful that have opened in the past few years (Fairfield Metro and Yankees-E 153rd Street being the other two). 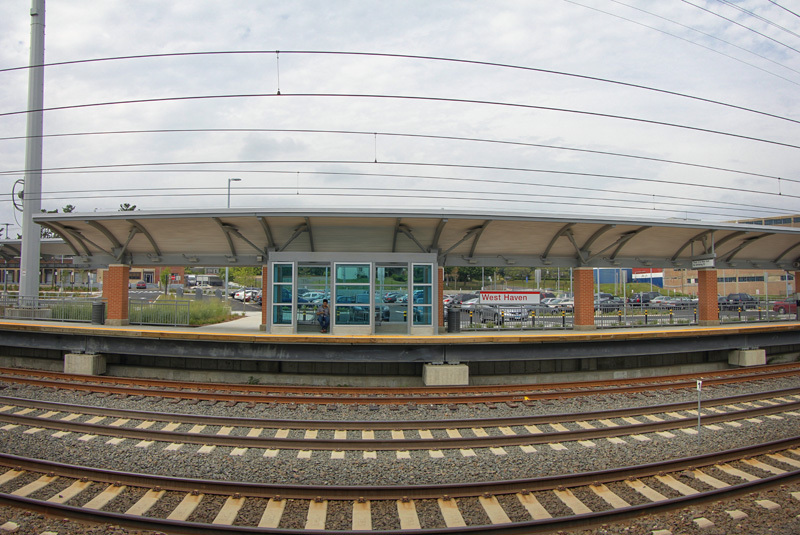 The new station puts a break in the long stretch in between New Haven and Milford stations, and relieves parking issues at both. 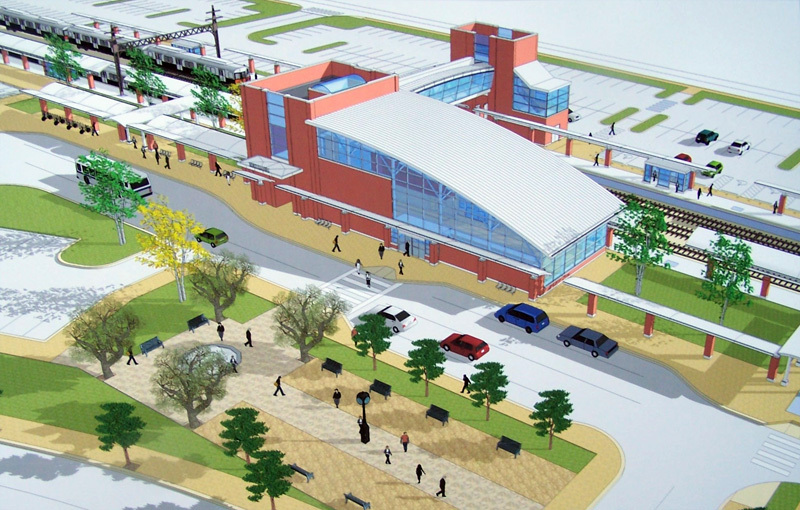 Rendering of what the station site would look like at completion. 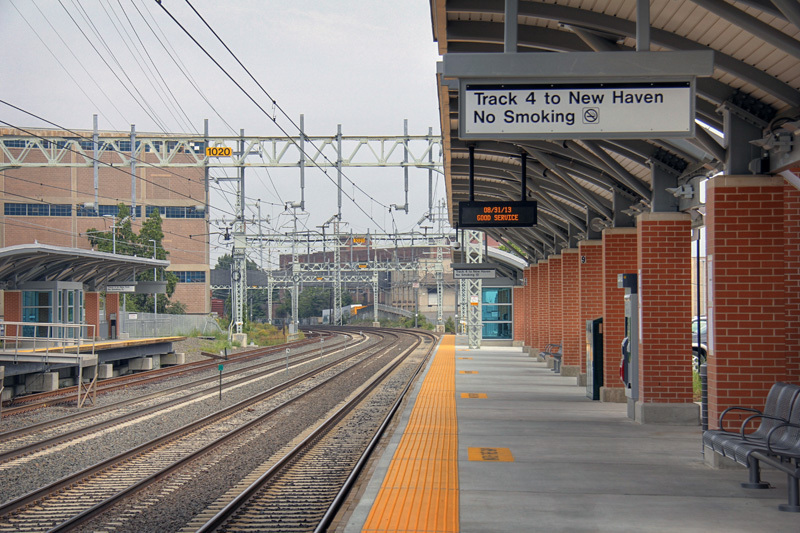 A station in between Milford and New Haven had long been debated, and extensive studies looked at sites in both West Haven and Orange. 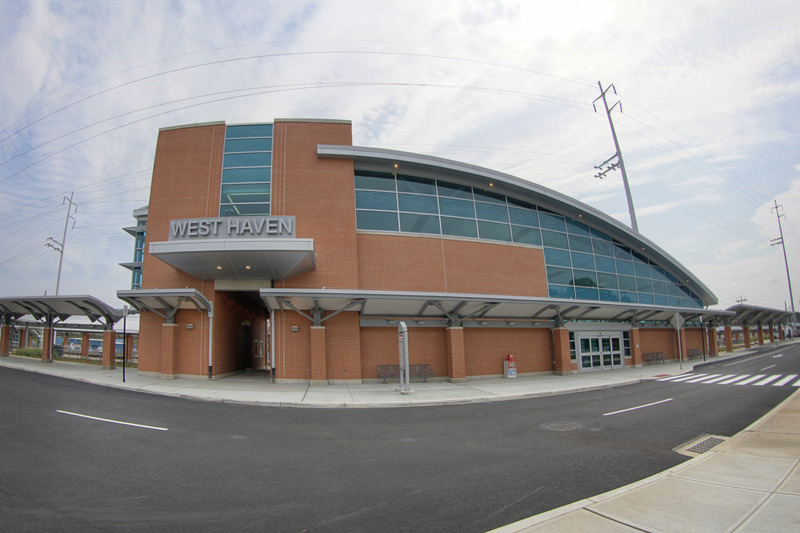 Though an apparent decision in favor of West Haven came in 2002, the debate was dragged on for many more years. 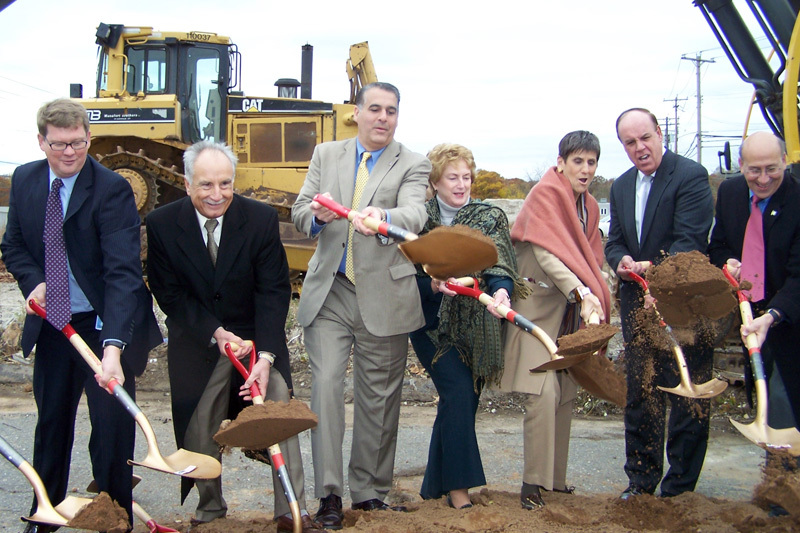 Connecticut’s Final State Environmental Impact Evaluation, published in June of 2007, cites the pros and cons of the two sites and is an immense four hundred and fifty pages. 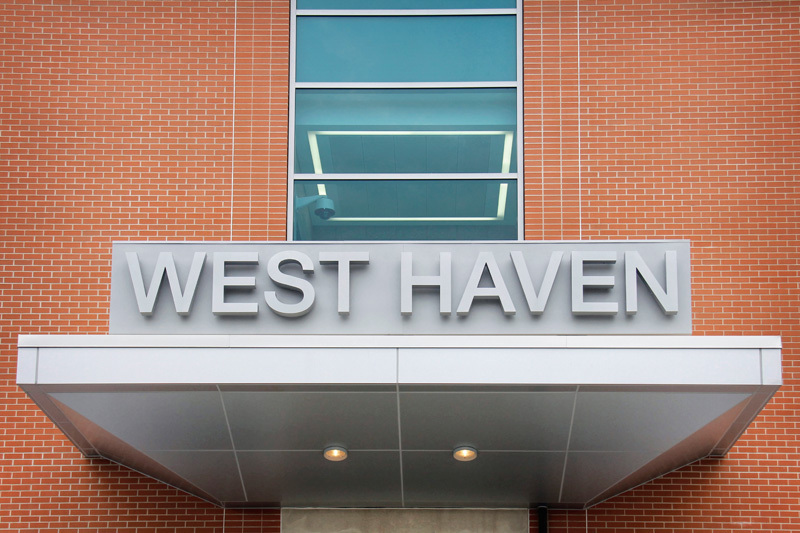 Despite the Orange station plan being supported by Bayer Pharmaceutical Corporation (the proposed Orange site would be within walking distance of their headquarters), the state upheld the original 9 to 6 vote in favor of West Haven. 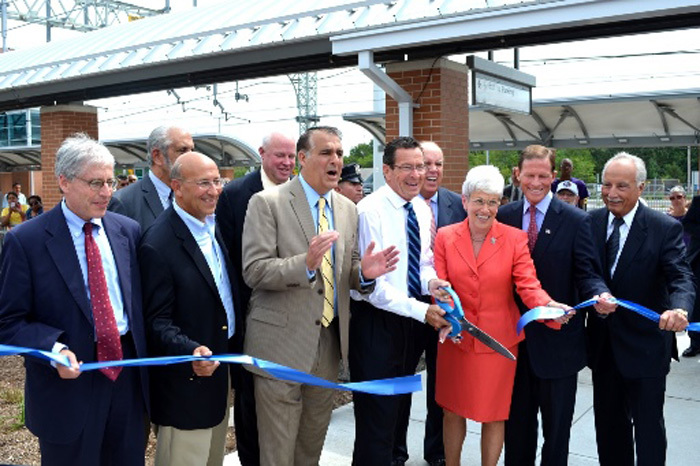 After many years of often-heated debate, a ceremonial groundbreaking was finally held in November of 2010, and attended by then-Governor Jodi Rell (the station project has languished over the tenure of three different governors – the original decision was made during John Rowland’s term, and Dannel Malloy was present at the ribbon cutting). 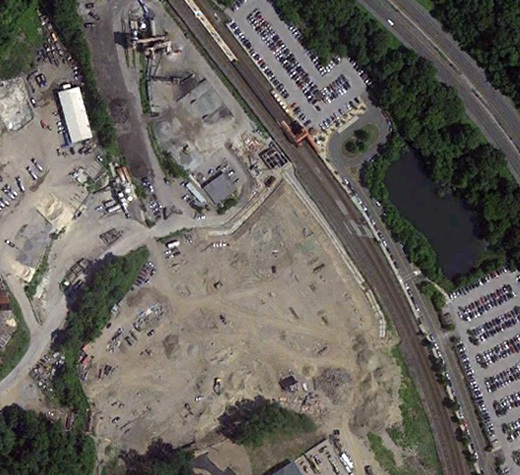 Aerial view progression of the work site: by 2010 a few buildings have been knocked down in preparation for the new station, and by 2012 construction is in full force. 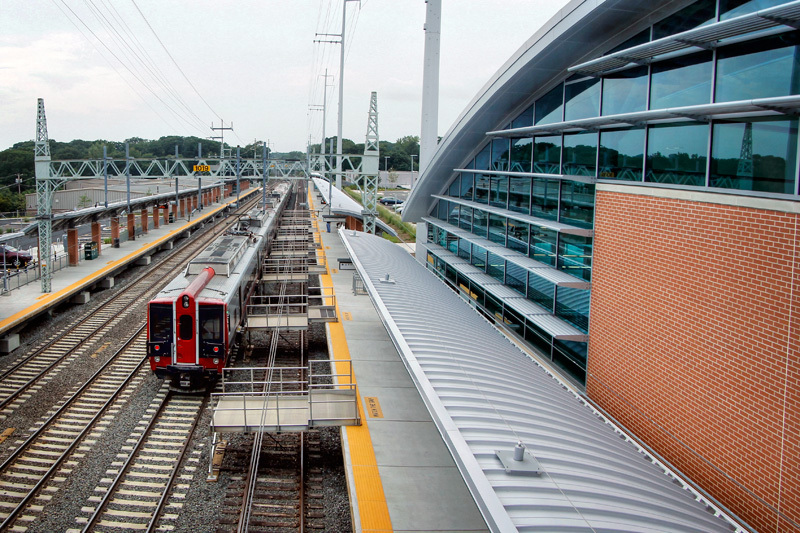 Though the station was originally estimated to cost around $80 million, and would include a parking garage, the final cost was closer to $110 million and lacked the garage. 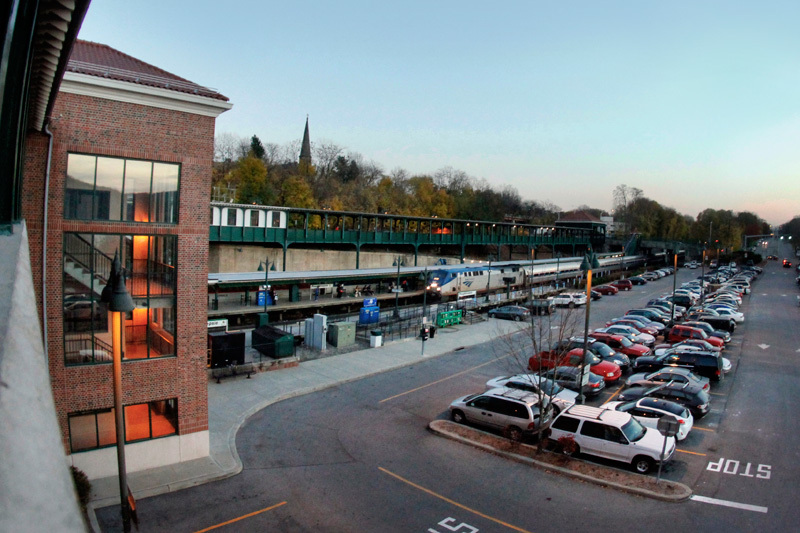 Although the 658 parking spaces at the new station do alleviate some of the parking problems at New Haven and Milford, it does not have the impact that was originally hoped for with a 2000+ space garage. 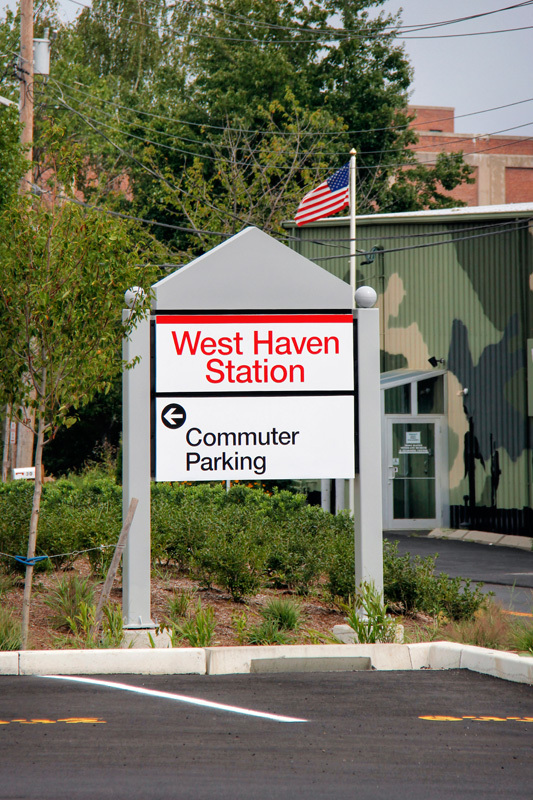 Nonetheless, the new station does allow access to the nearby Yale West Campus, and West Haven’s Veterans Hospital is investigating the possibility of operating a shuttle to and from the new station. 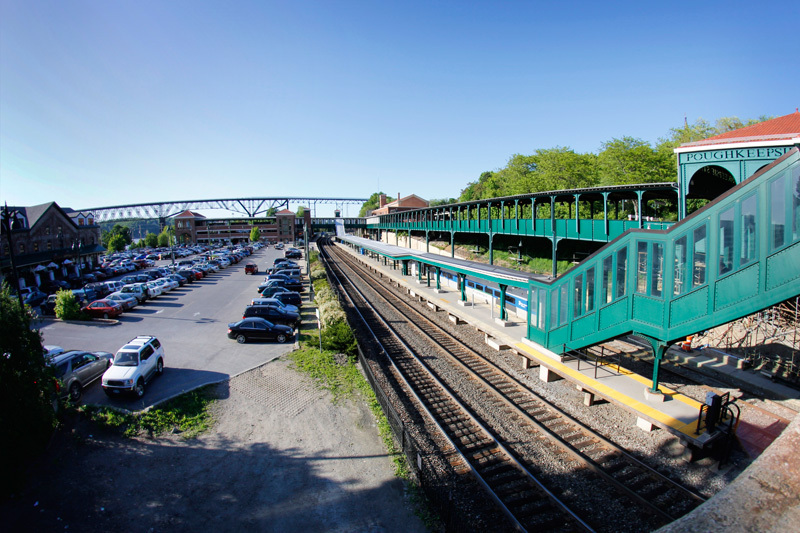 Many West Haven citizens hoped for an older style station, reflecting the historical aesthetic of the old Savin Rock Amusement Park. 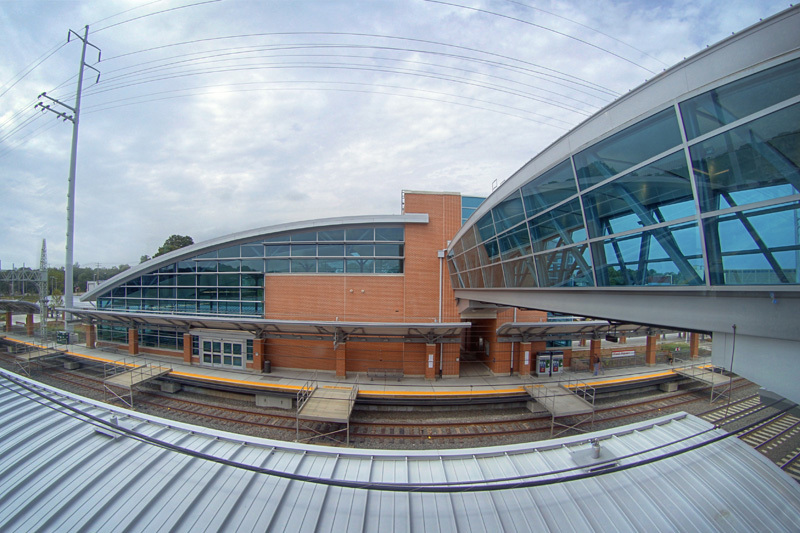 Alas the station built was a more modern brick and glass building that may resemble a school more than it does a train station. 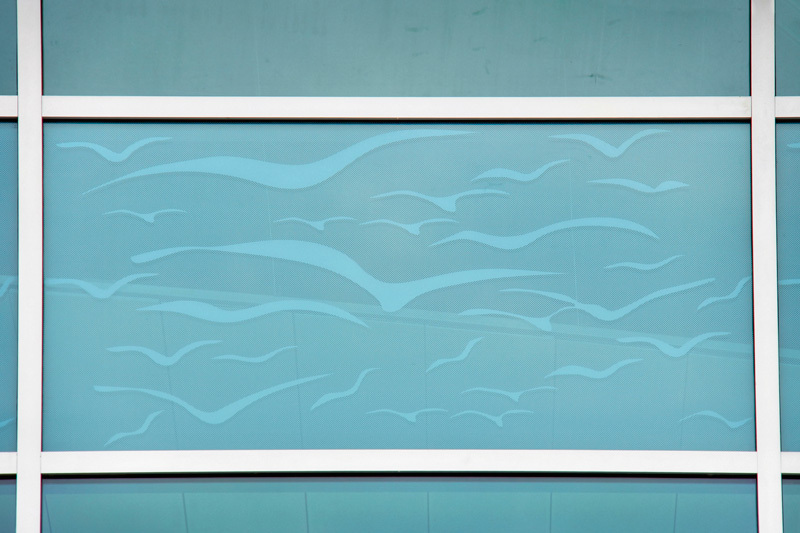 The only truly aesthetic touch are the stylized seagulls on some of the window panes, which do seem to appropriately reflect the nearby Savin Rock area of West Haven, but are relatively underwhelming. 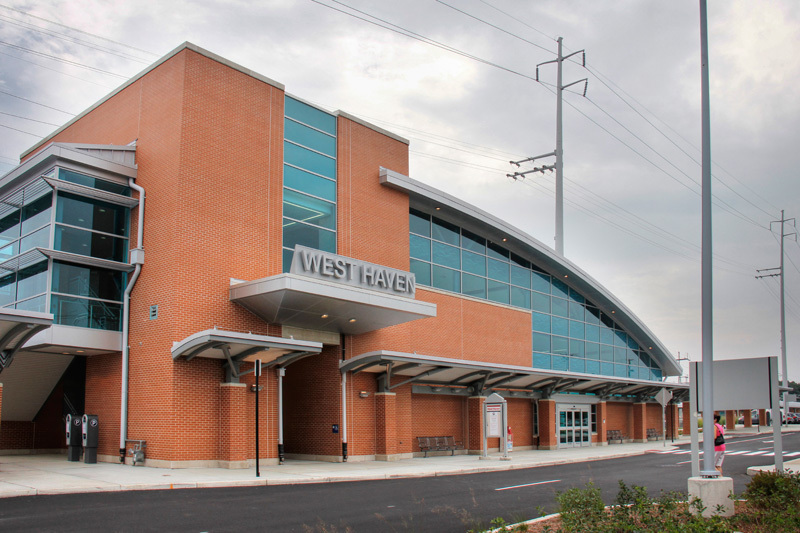 Though it is certainly a nice addition to the New Haven Line, and to the citizens of West Haven, the station is hardly unique, and un-noteworthy compared to many of the historical stations you’ll find on the line. 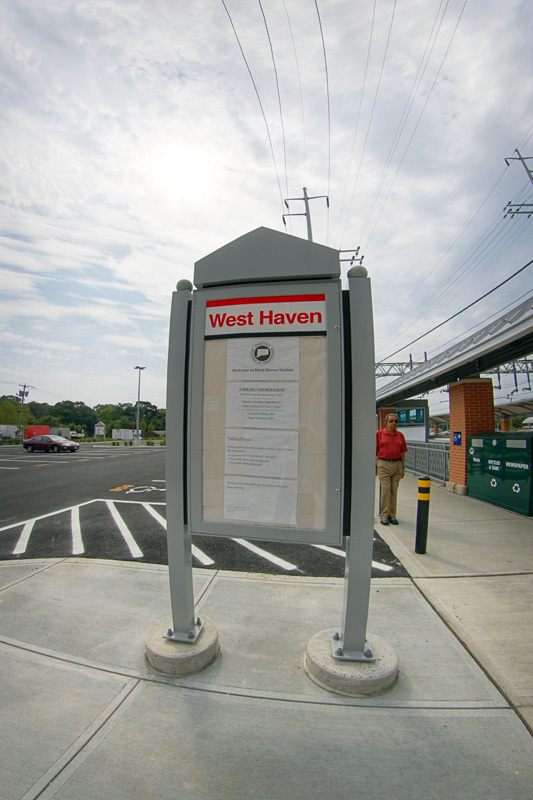 As a final note, Michael Mercuriano, chairman of the West Haven Train Station Committee is hoping that a plaque will be placed at the station recognizing the efforts of the committee. I didn’t see a plaque to that effect, but if you were to ask me I think a plaque recognizing Robert Luden would be most appropriate. 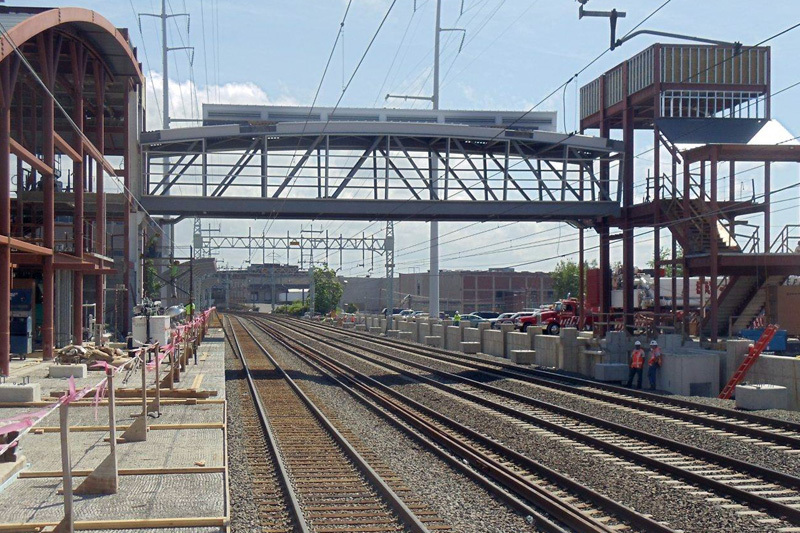 Luden was the 27-year veteran track foreman killed in May near the construction site. 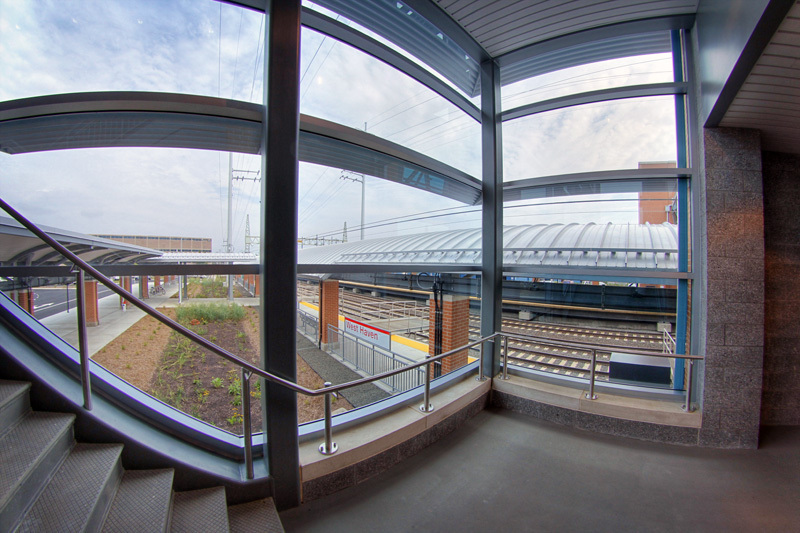 Construction views of West Haven station. 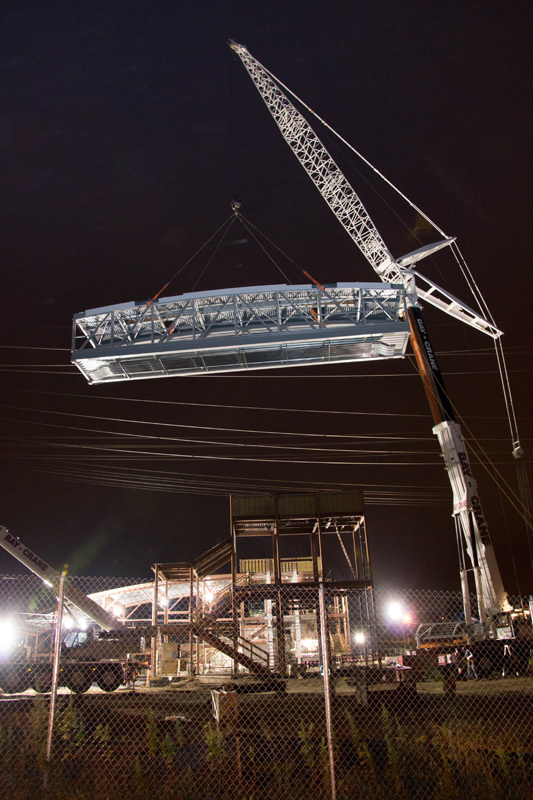 Top: The prefabricated pedestrian bridge is placed. 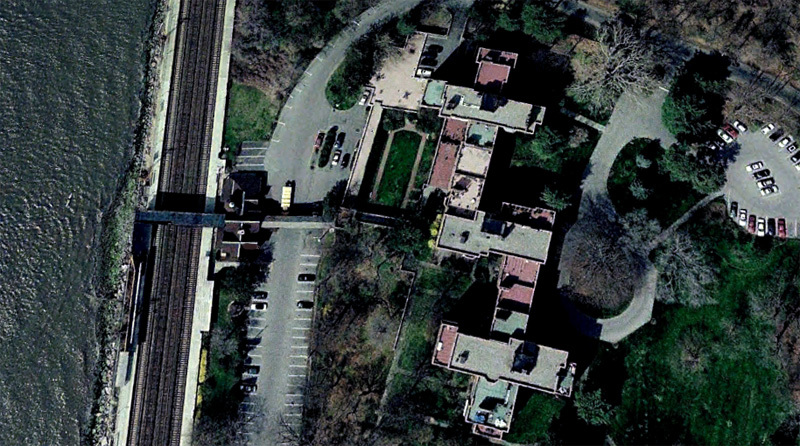 ((Pedestrian bridge photos by Tim Kemperle)) Bottom left: Aerial view of the construction site. 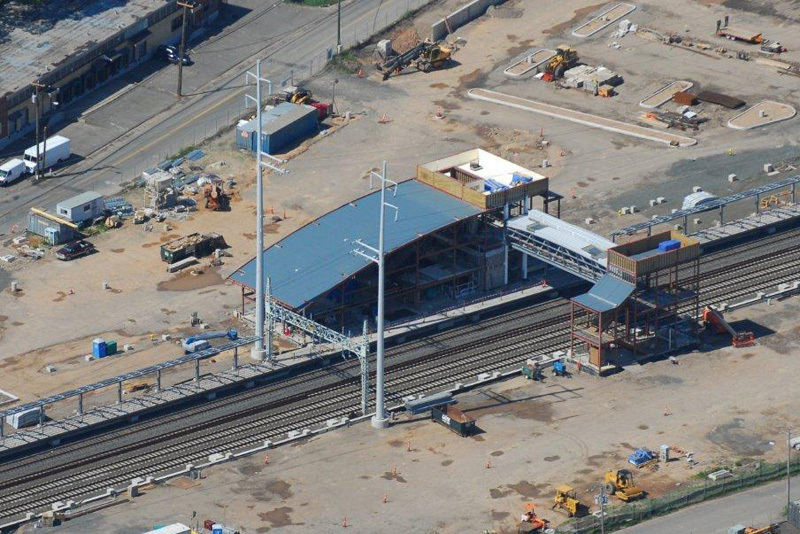 ((Aerial view of the construction site photo from Discover West Haven.)) 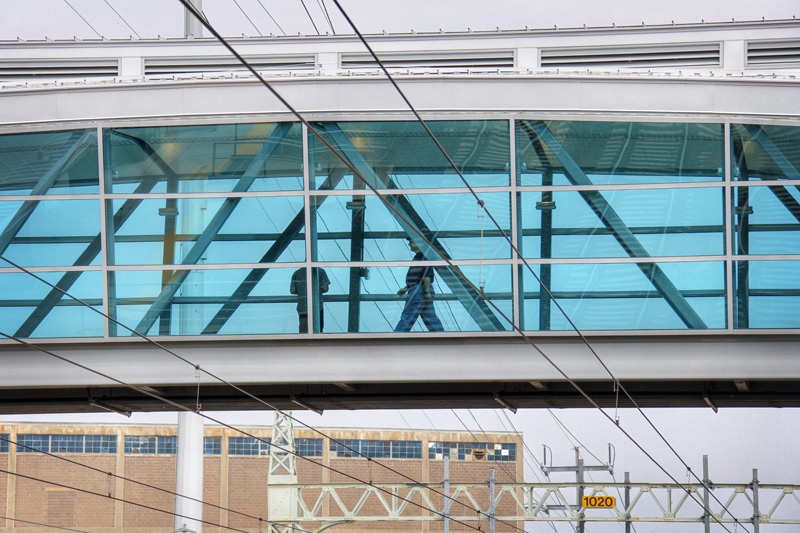 Bottom center: Glass installers getting ready to place the windows into the station. 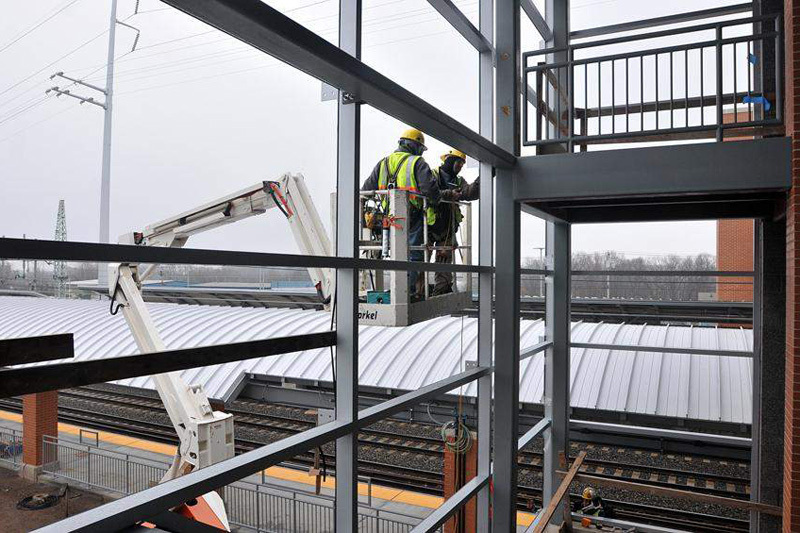 ((Glass installers photo by Peter Casolino, New Haven Register.)) 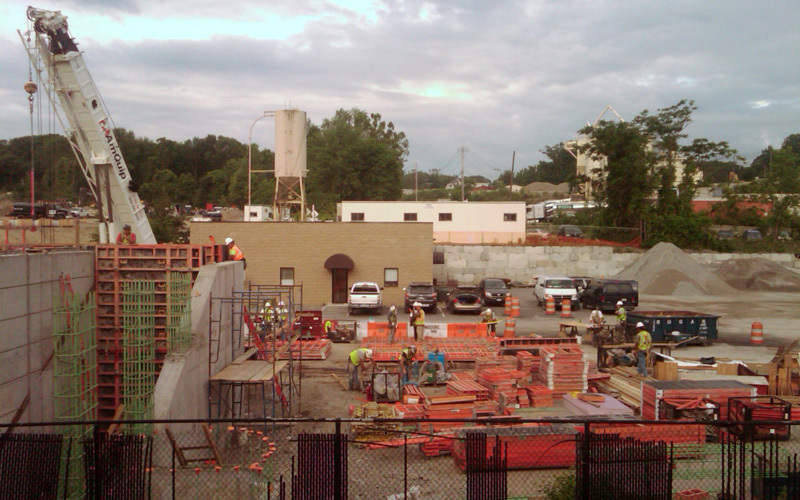 Bottom right: Platform view of the construction work ((Platform view of the construction site photo from Discover West Haven.)). 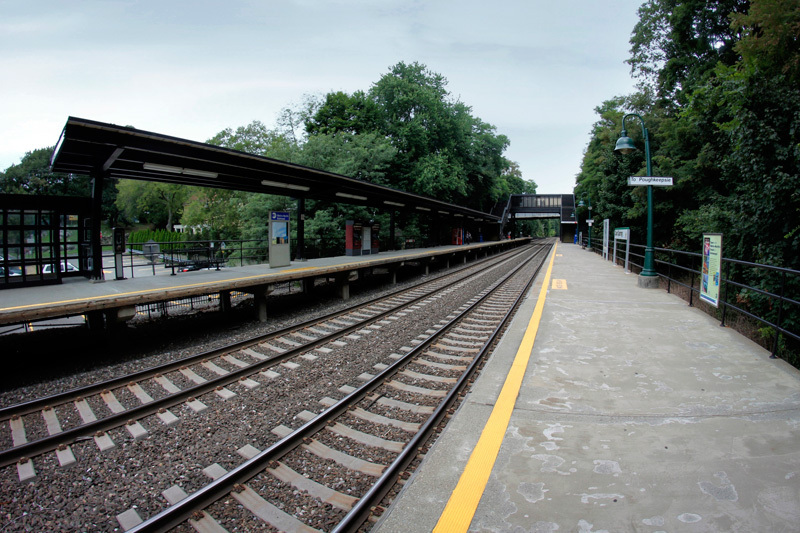 By now you are probably aware that I finally finished my three-year-long project to photograph every Metro-North station – all one hundred and twenty three of them. 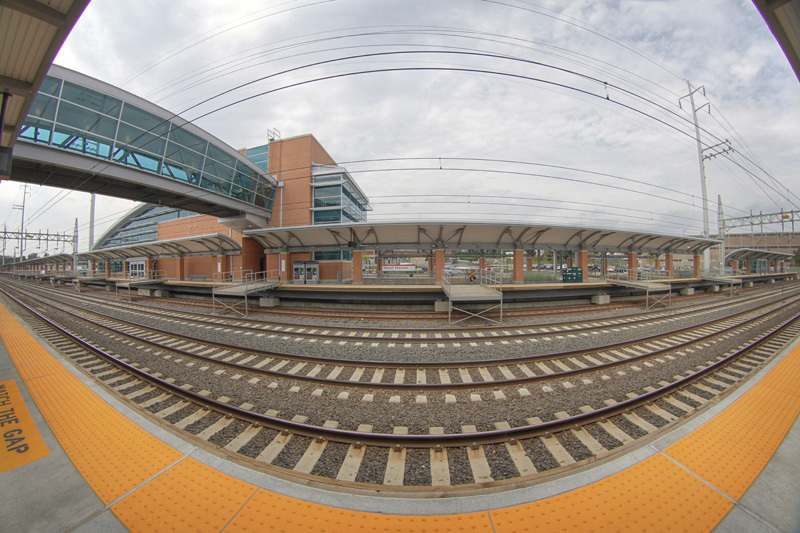 For my “final” Tuesday Tour post, I thought it would be nice to post a map which links to the photographic tours of every station. 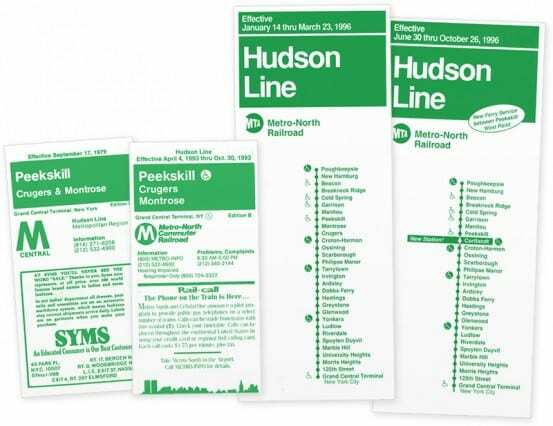 Though I’ve tried my hand at doing some Harlem Line maps in the past (they were crappy) and made an acceptable stab at a map of the West of Hudson Lines, I never really attempted a system-wide map. 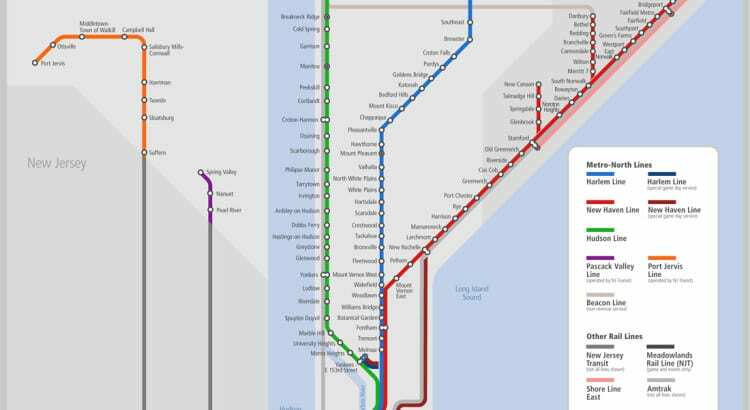 I’m not the biggest fan of Metro-North’s maps, especially how they deal with multi-line stations like Fordham (admittedly, it is not a bad map when you compare it to this atrocious Metro-North publication! 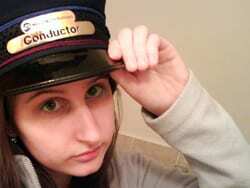 ), so I wanted to do something drastically different. I guess when I say drastically different, I mean cleaner, hopefully easier to read, and showing info that the official map does not contain. 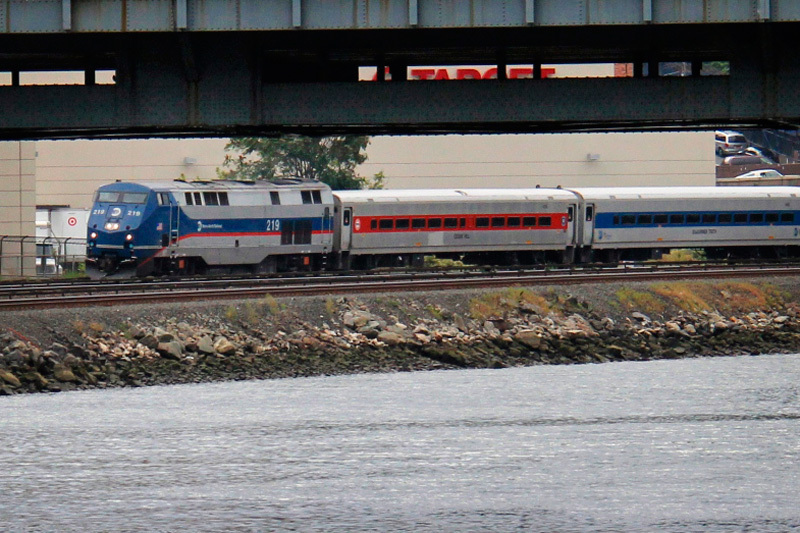 One addition was Metro-North’s extra services, namely game/special event trains. 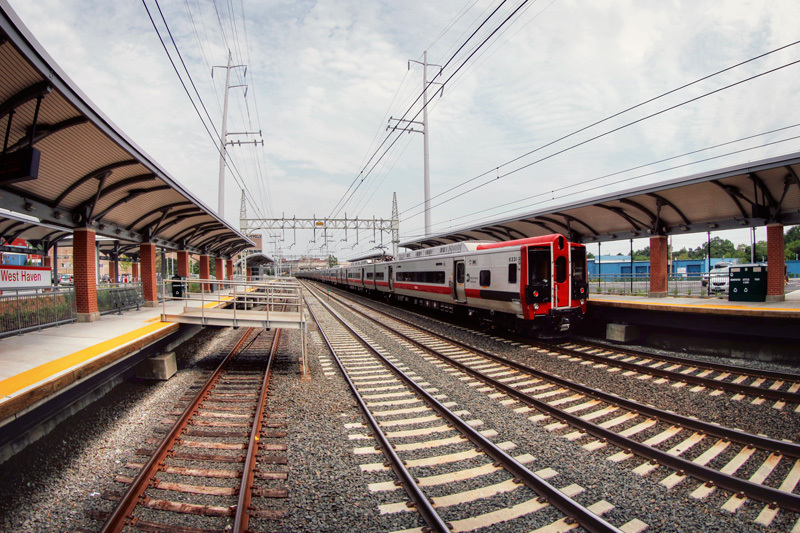 Including them explains visually how Metro-North’s main lines connect, something most railfans probably know, but the average rider may not. 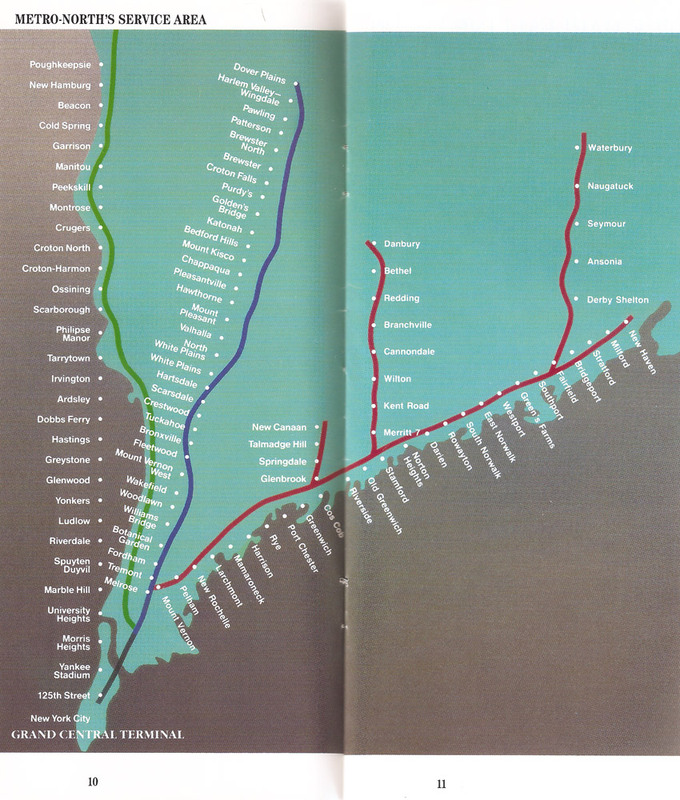 The official map doesn’t properly illustrate that the Harlem and New Haven Lines run side by side up to Woodlawn, that they can both head onto the Hudson Line for Yankees games, or that the New Haven Line can diverge and follow Amtrak’s path into Penn Station and Secaucus for football games. 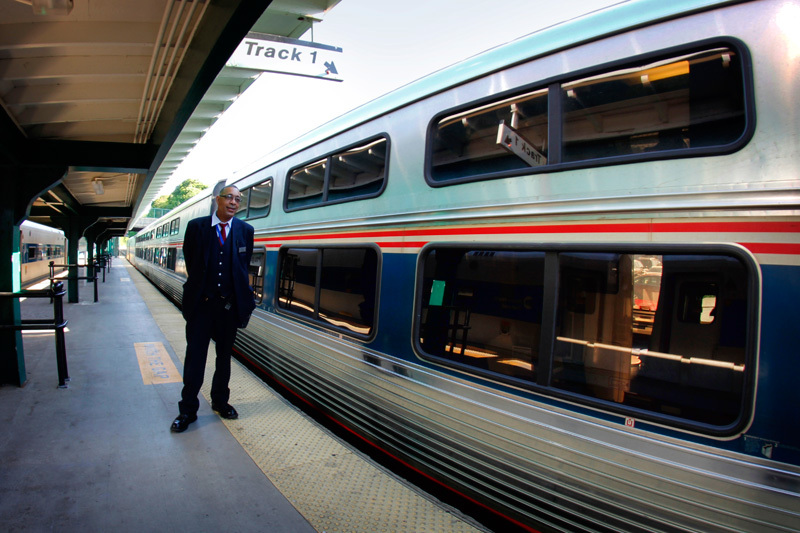 Other additional info I included are limited-service stations, and shared stations. 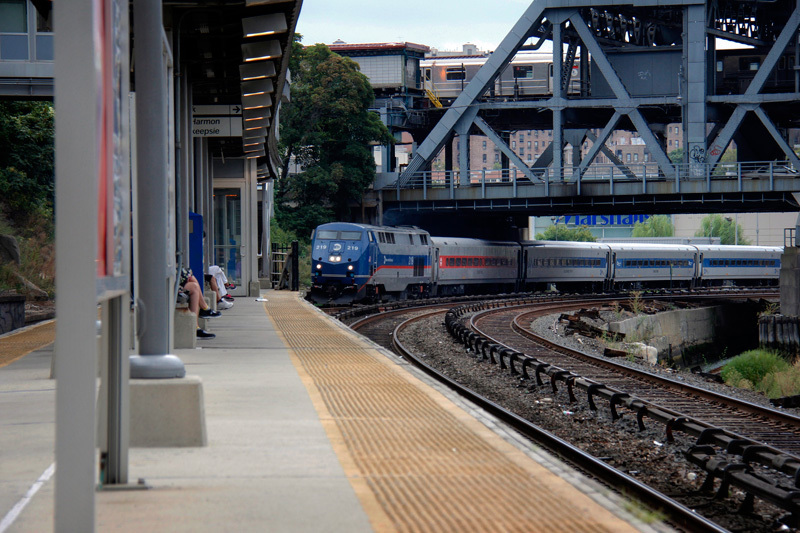 A handful of Metro-North’s stations also have Amtrak service, and in the case of New Haven station, Amtrak and Shore Line East service. In all, my map is more of a “diagram” than anything. 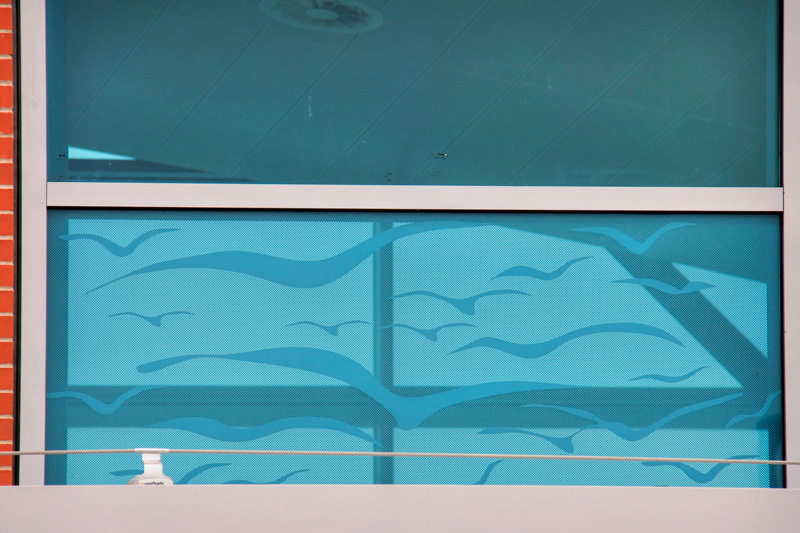 Some geography has been compromised a little bit for easier viewing and aesthetics. 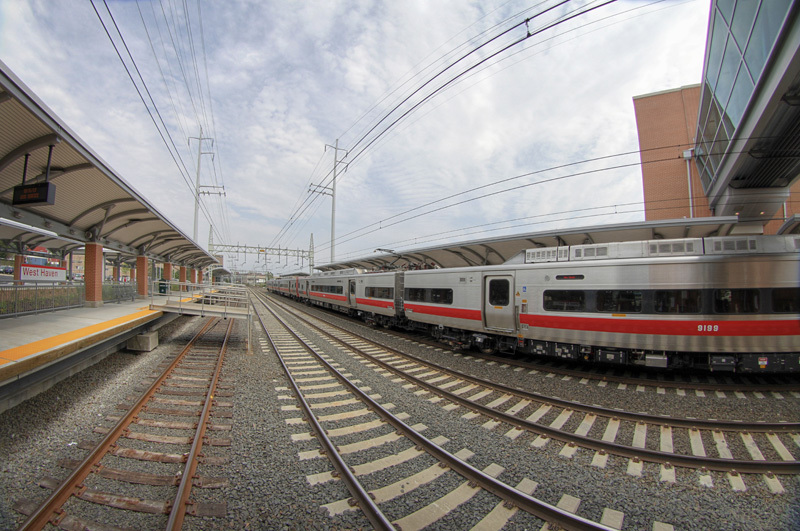 But every station name and dot links directly to its respective Tuesday Tour full of photos and history, so it is certainly an interesting way to see the system as a whole. Since the map is large, it will open in a new window. 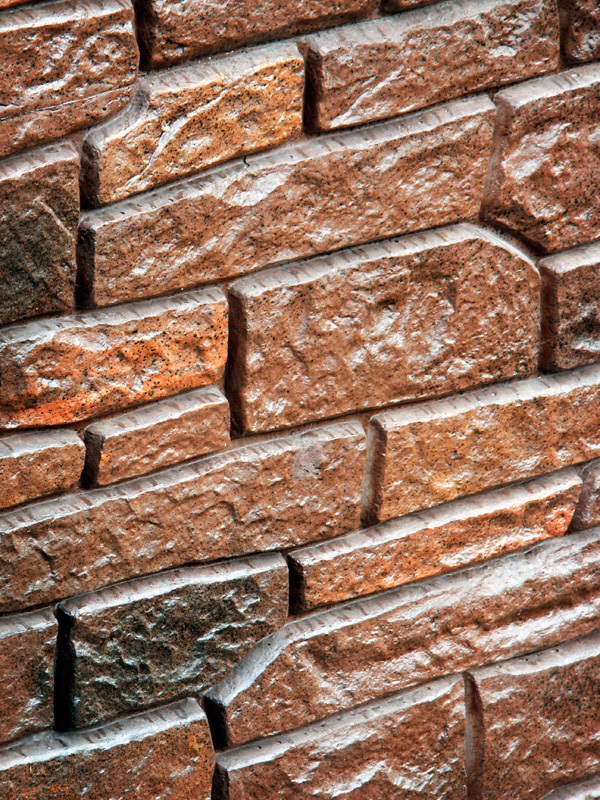 Click the preview image below to launch the map! 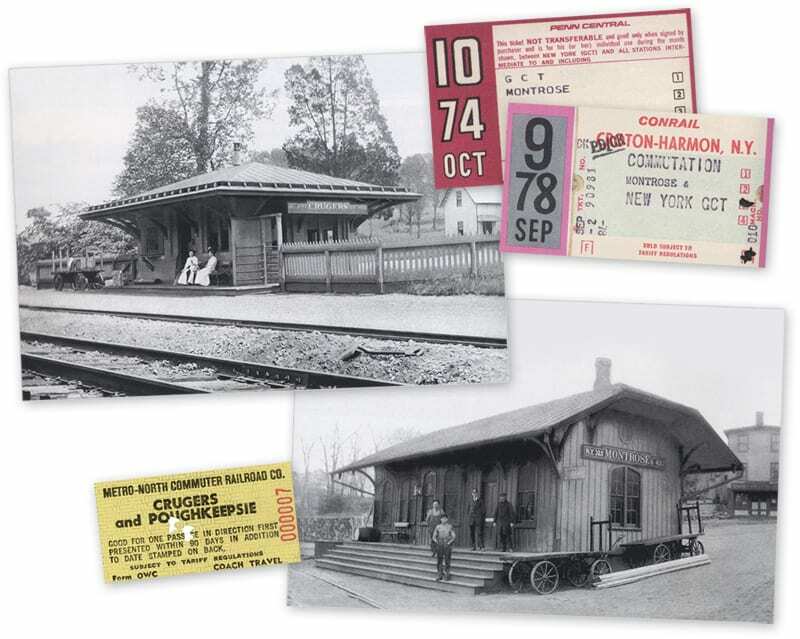 1890 photo of the previous Poughkeepsie station. 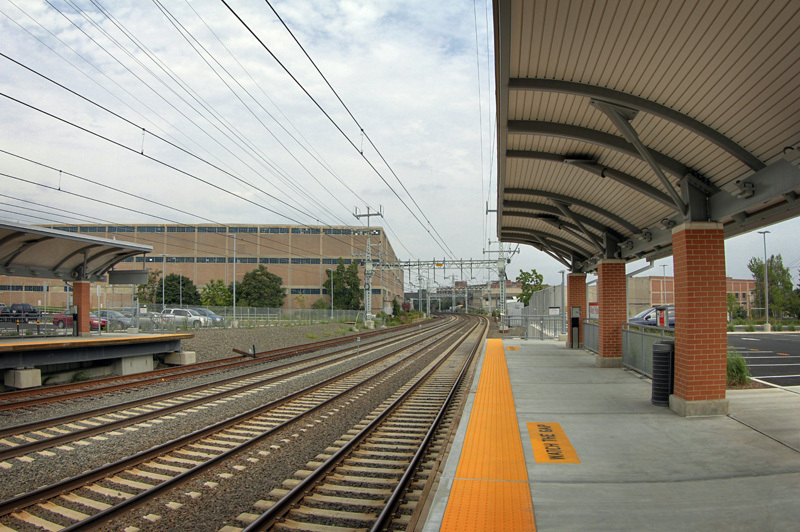 Note that this station was on the west side of the tracks, while today’s station was constructed on the east side of the tracks. 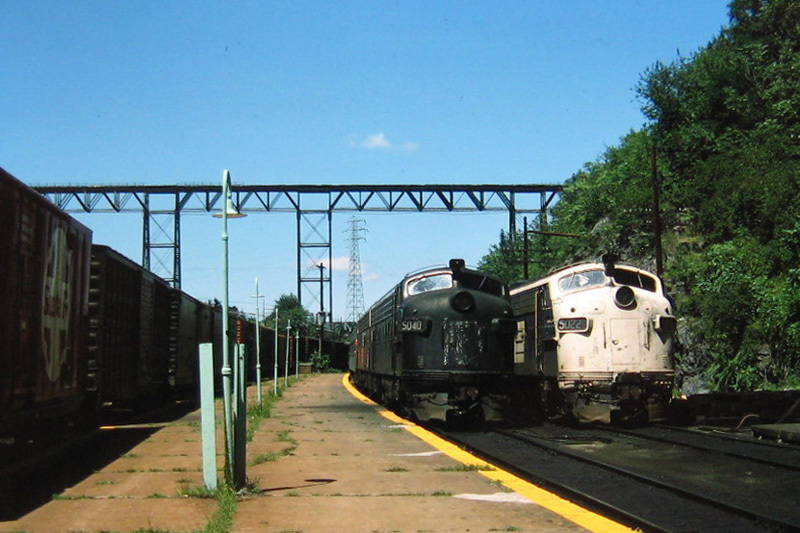 1960 photo of Poughkeepsie station, not obstructed by Route 9 which now runs above the station’s front parking area. 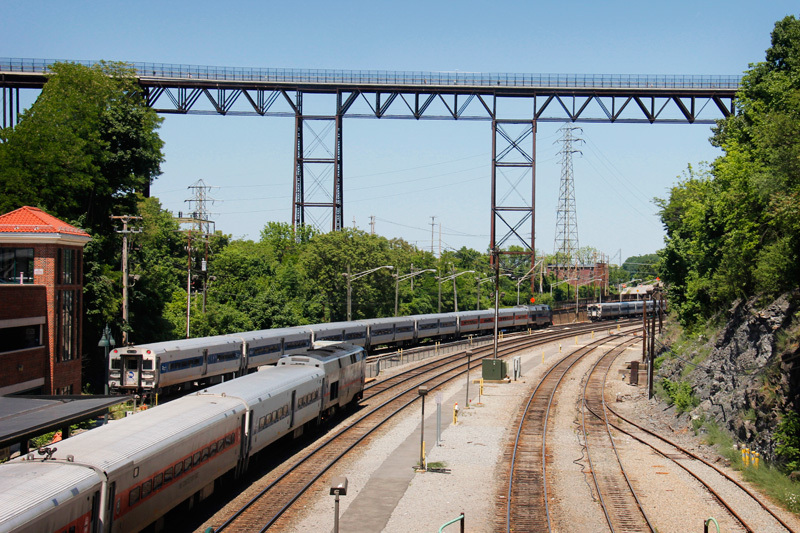 Today we’ve arrived at the end of the line – both literally and figuratively. 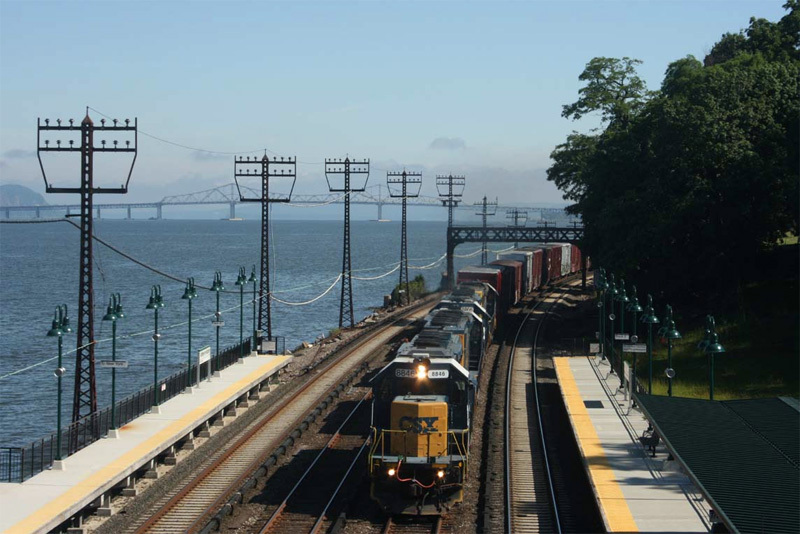 Today’s station tour is of Poughkeepsie, the northern terminus of Metro-North’s Hudson Line, and the final station on our Hudson Line tour. 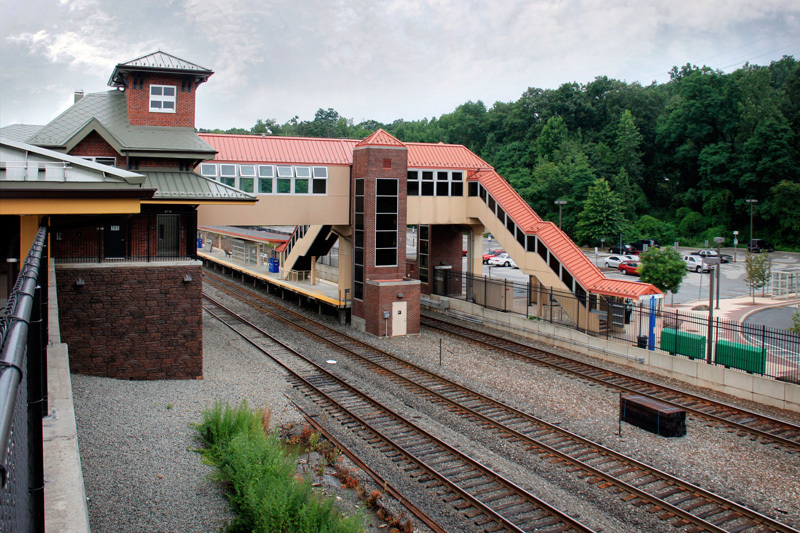 In fact, it is the final Metro-North station to be featured here. 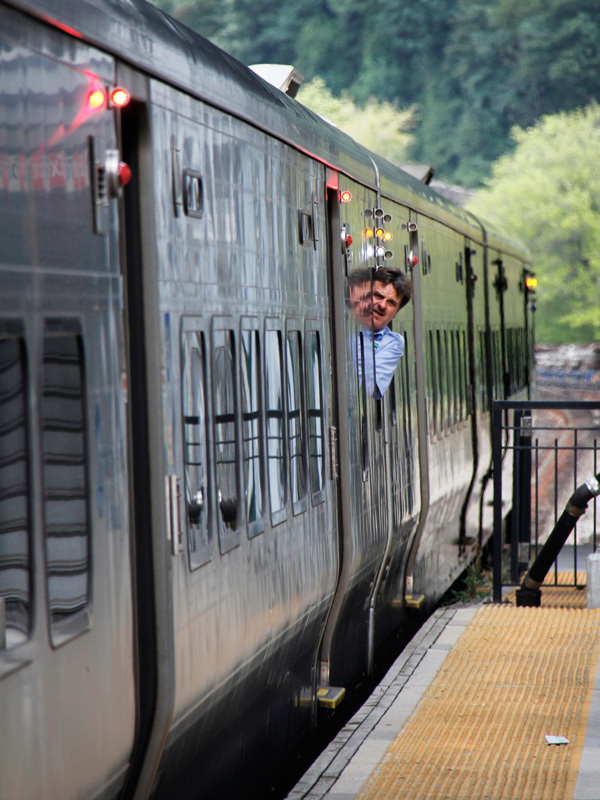 Over the past three years I’ve taken you to all one hundred and twenty three Metro-North stations, on both sides of the Hudson River. 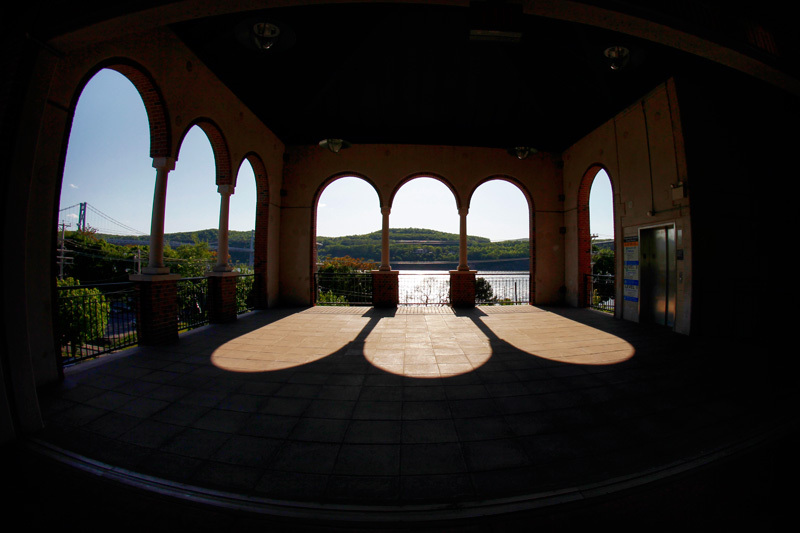 I saved Poughkeepsie for the end, as it is truly a gem, and a worthy send off for our Panorama Project. 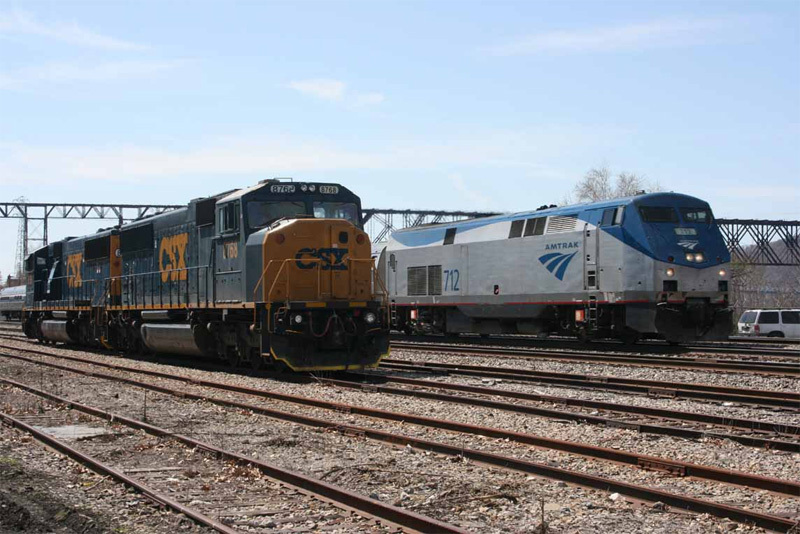 A wide variety of timetables from Pougkeepsie, including two of Amtrak’s trains that stop here. 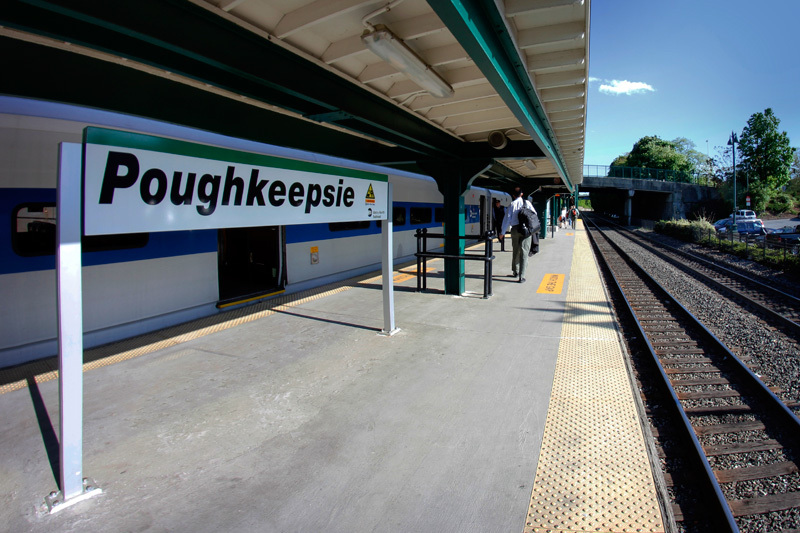 Located on the east bank of the Hudson River, Pougkeepsie is roughly equidistant between New York City and Albany, and the station is about 75 miles from Grand Central. 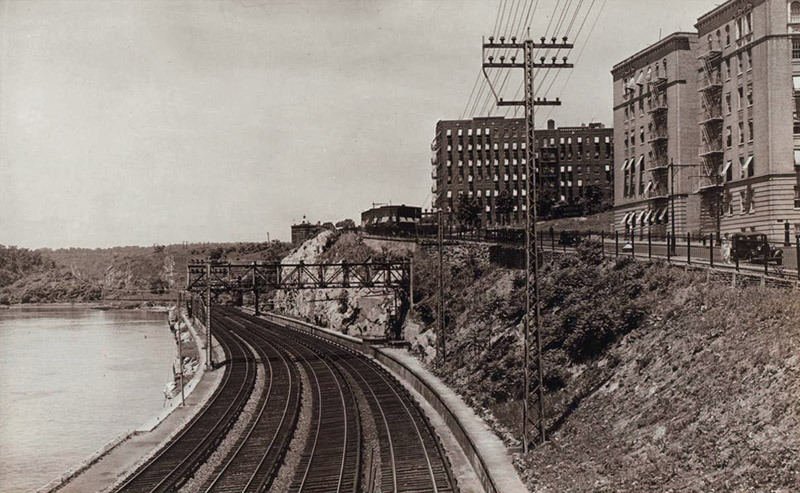 Both the access to the river, and later the railroad, played a significant part in Poughkeepsie’s growth. 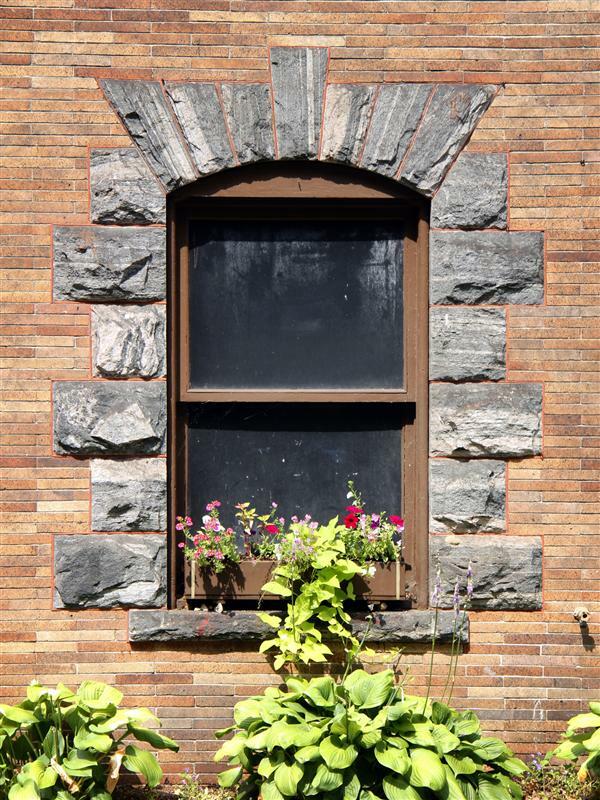 Over the years Poughkeepsie has been home to a various array of industries, including a glass factory, dye factory, brewery, carpet mill, shoe factory, and a chair manufacturer, among many others. 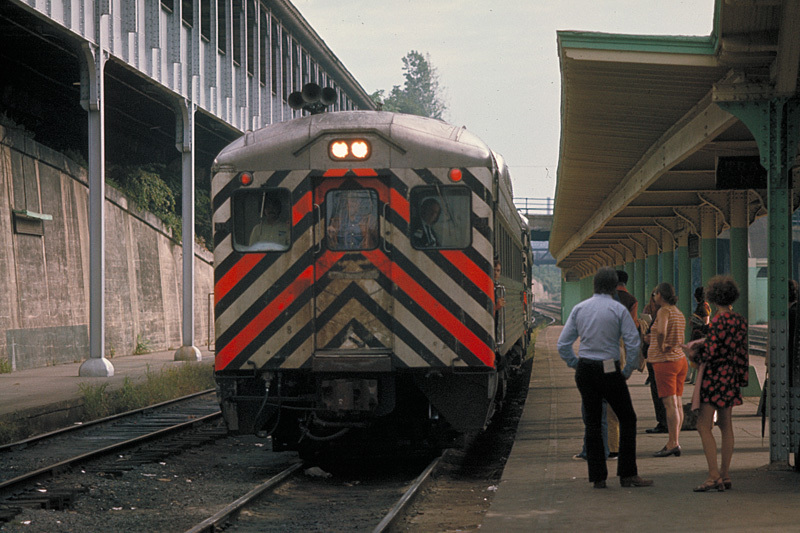 At Poughkeepsie station, 1971. 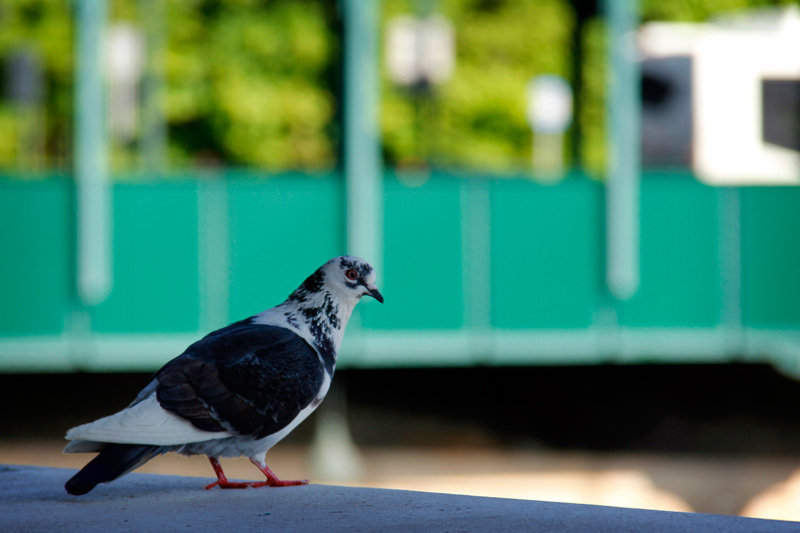 Photos by Steve Baldwin. 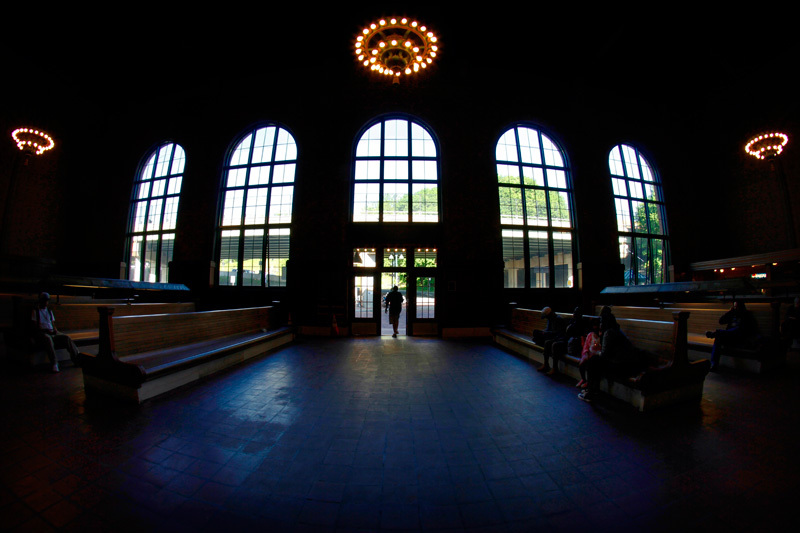 Reflecting Poughkeepsie’s important status along the New York Central’s famed Water Level Route, a grand station was constructed in 1918. 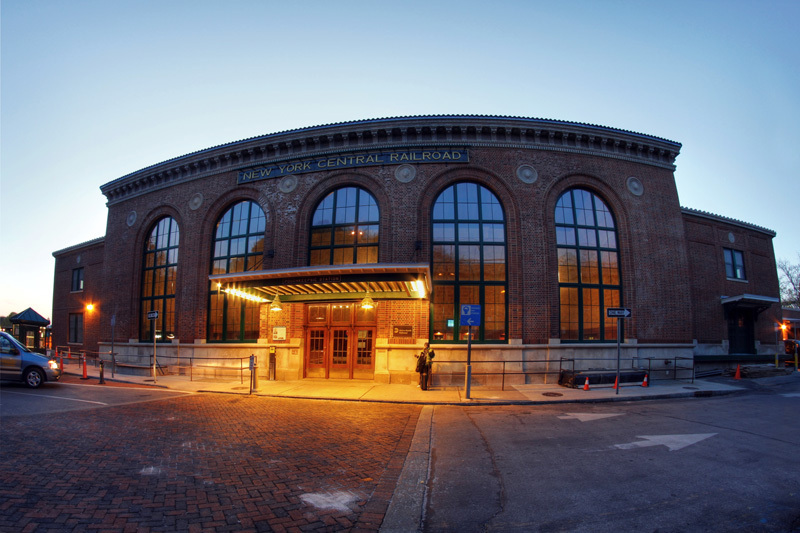 The four story concrete and brick building was designed by the notorious Beaux Arts architects Warren and Wetmore. 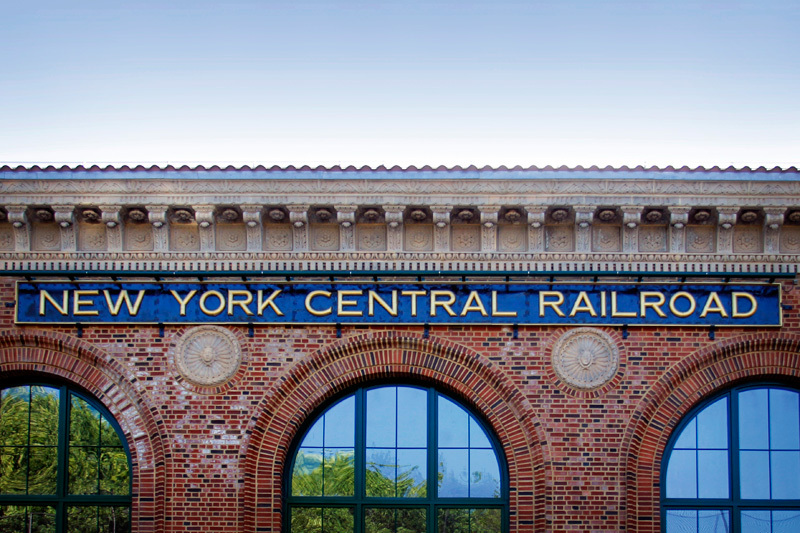 No strangers to the New York Central, Whitney Warren was a cousin of the Vanderbilts, and designed Grand Central with duo Reed and Stem. 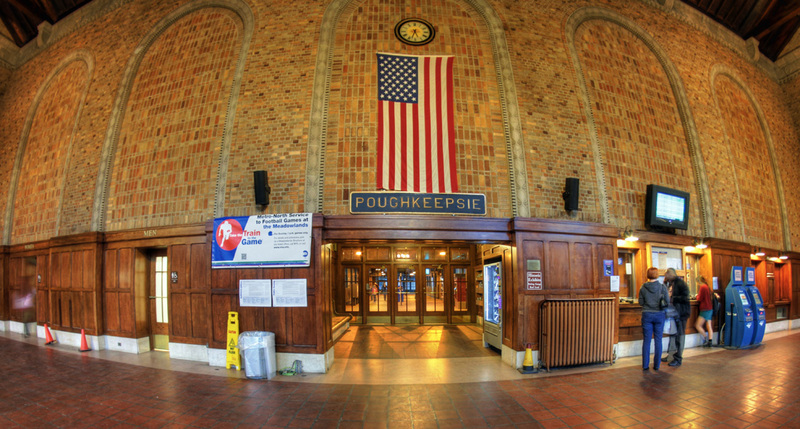 Poughkeepsie station is not nearly as extravagant as Grand Central, but along with the station in Yonkers, it is certainly one of the Hudson Line’s real gems. 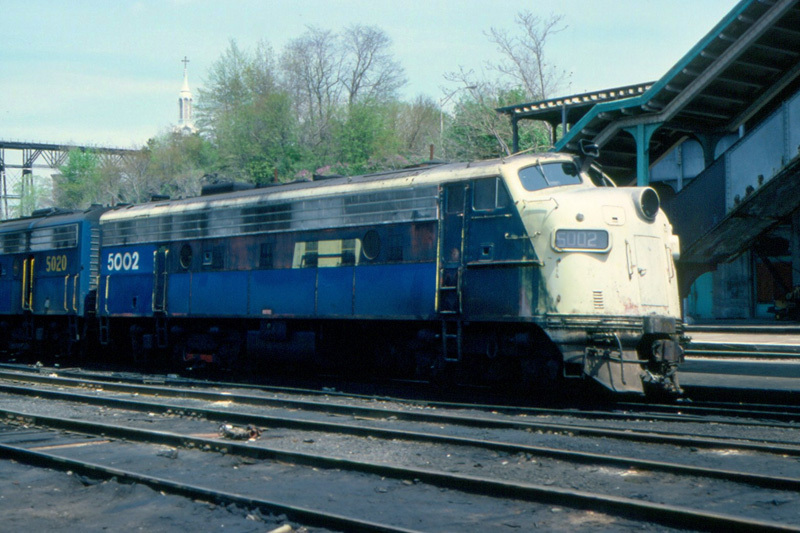 Poughkeepsie in the 1970’s. 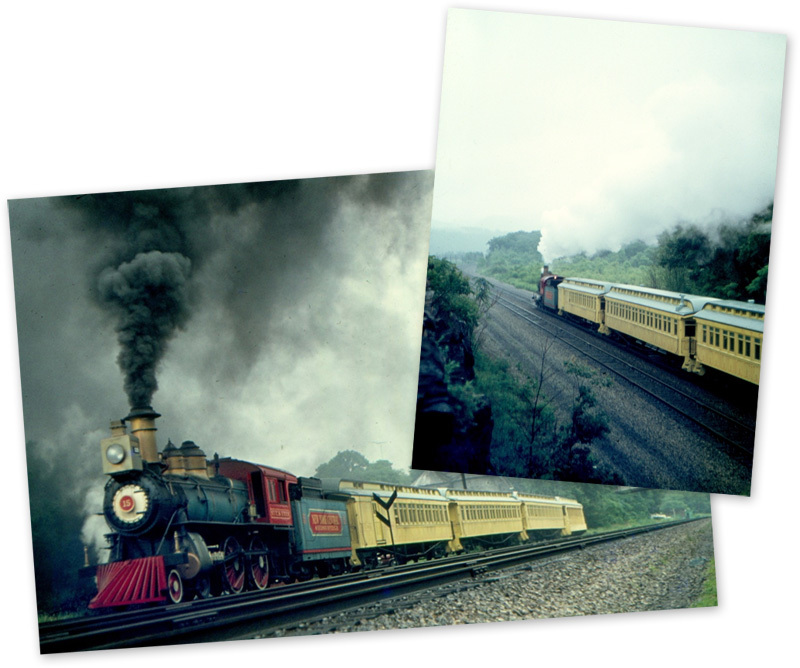 Top left photo in 1975, right and below, 1979. 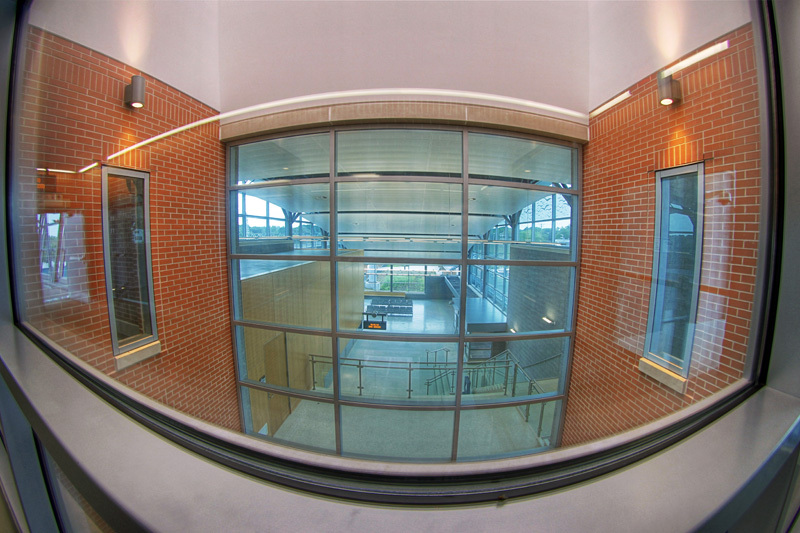 Top right photo by Panoramio user Scotch Canadian. 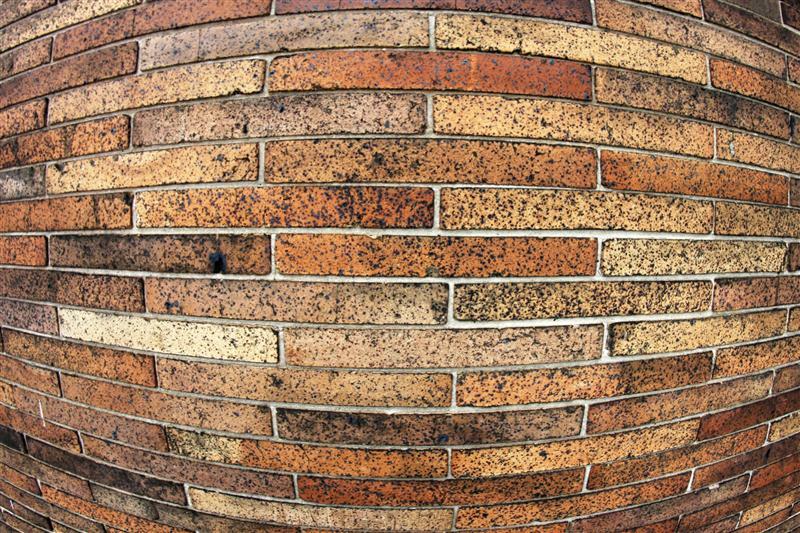 Top left photo in 1979 by Panoramio user Scotch Canadian. 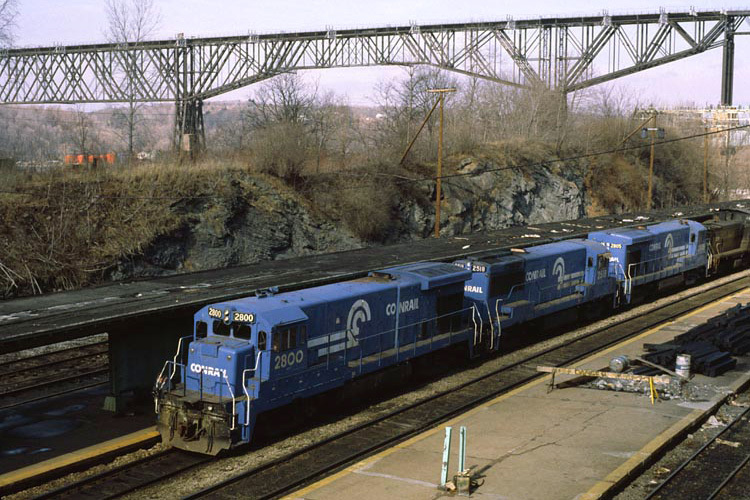 Top right photo in 1981 by Bob Coolidge. 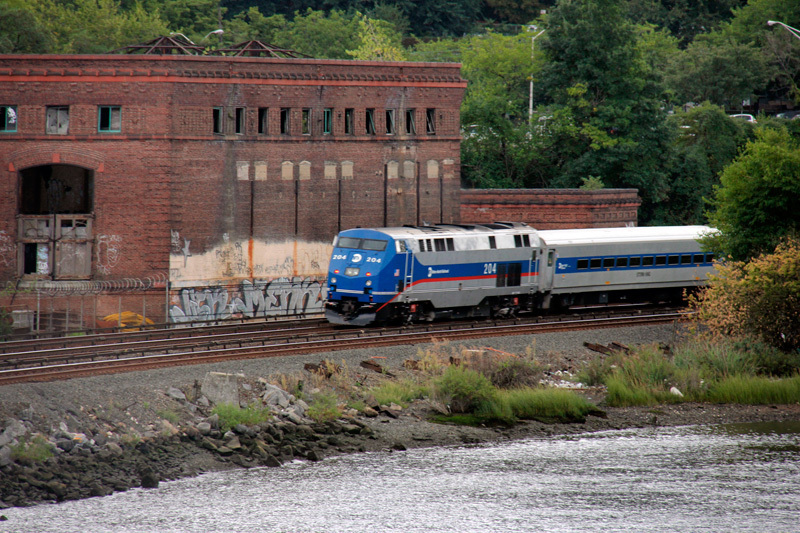 Amtrak photo by Ed Linde. 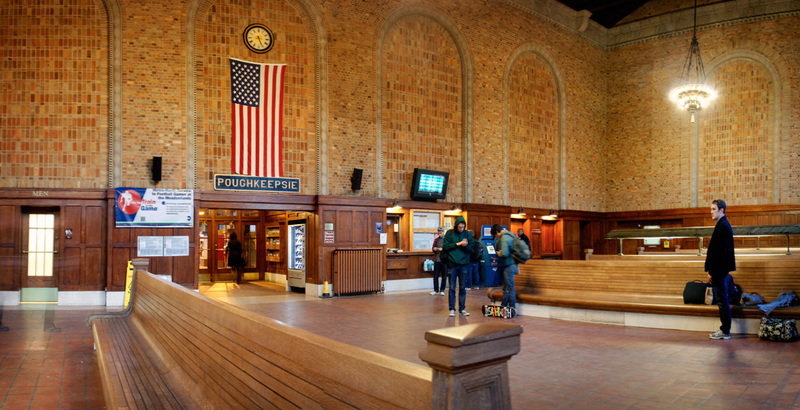 Fitting with the typical design of a Beaux Arts building, Poughkeepsie station offers a main, and large, focal point – in this case, the waiting room. 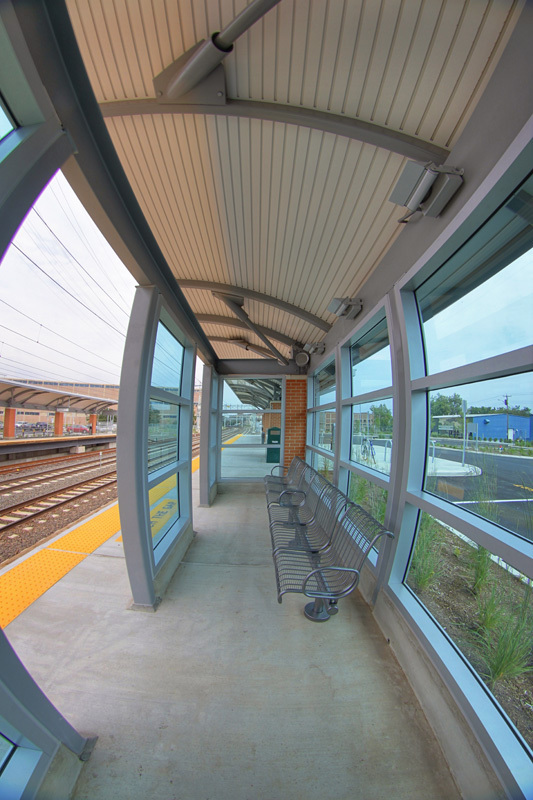 Featuring five massive windows that stretch from almost floor to ceiling, during the day the station is well lit just from sunlight alone. 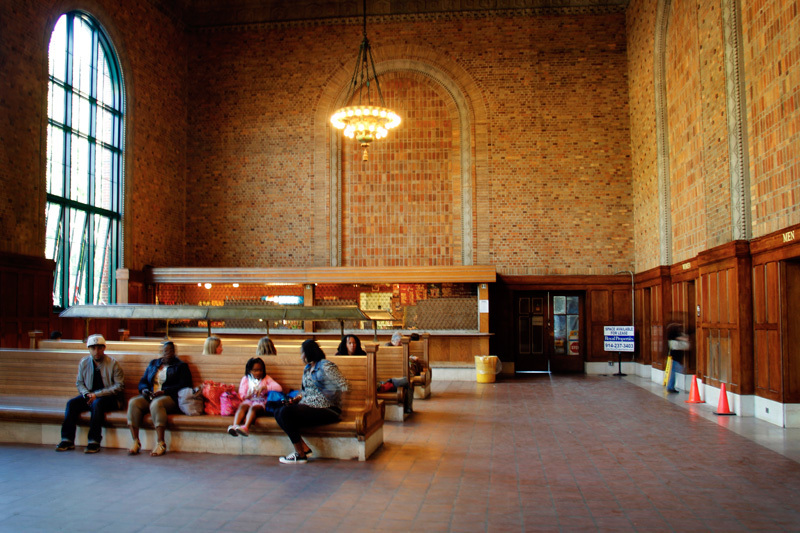 To supplement that light, three chandeliers also hang from the ceiling, and similar to Grand Central’s chandeliers, boast their modern use of electricity with naked light bulbs. 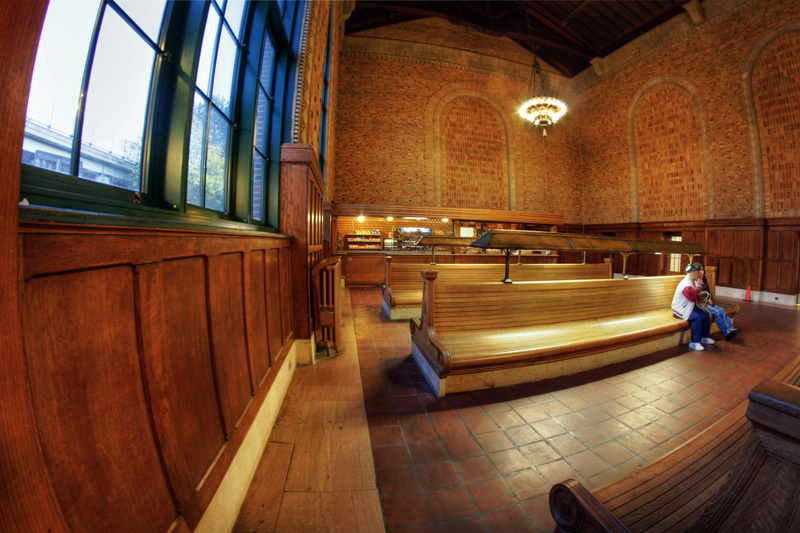 Interspersed throughout the waiting room are fourteen wooden chestnut benches, also similar to the benches that were once in Grand Central’s main waiting room. 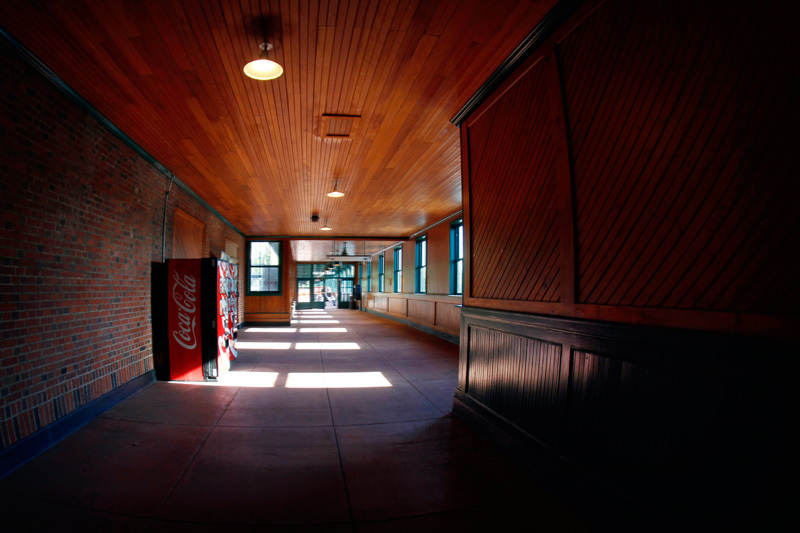 Historically, the north wing of the station was reserved for a railway express agency, and the south end with a kitchen and dining room. 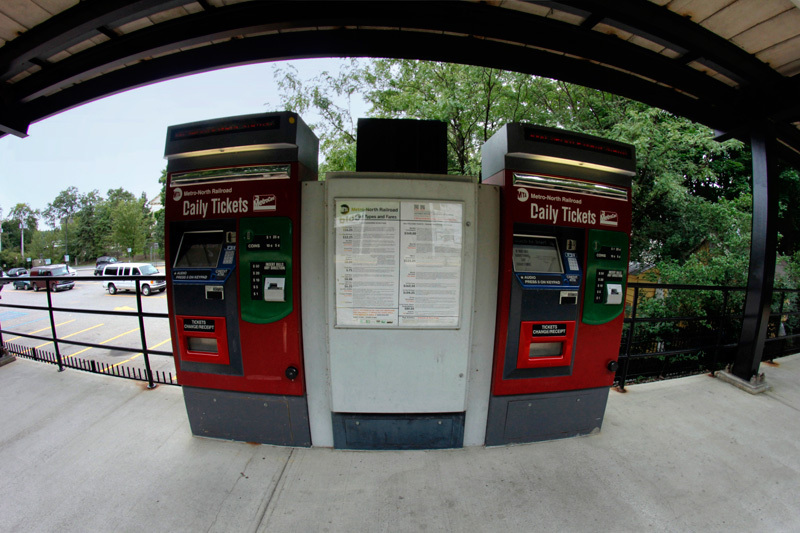 Today, the waiting room contains a Metro-North ticket window, some Quik-Trak machines from Amtrak customers, restrooms, a snack shop on the south side, and an MTAPD station on the north end. 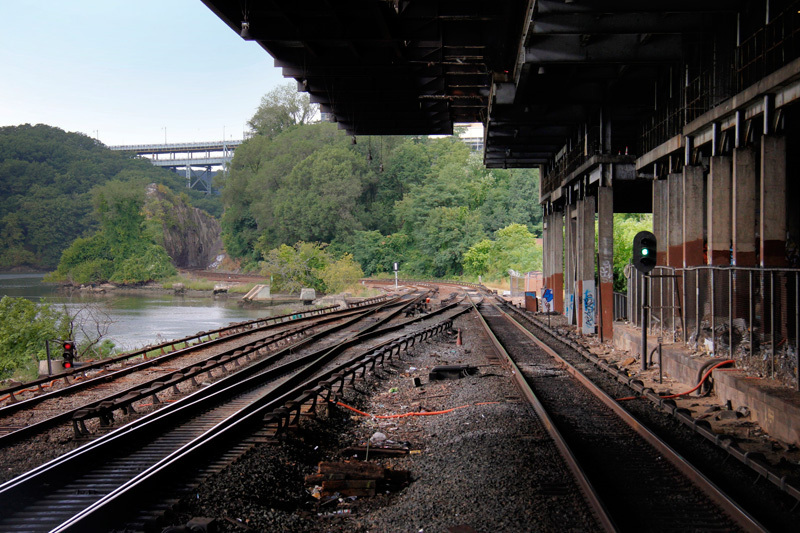 Photos of the former Poughkeepsie Railroad Bridge, now the Walkway Over the Hudson. 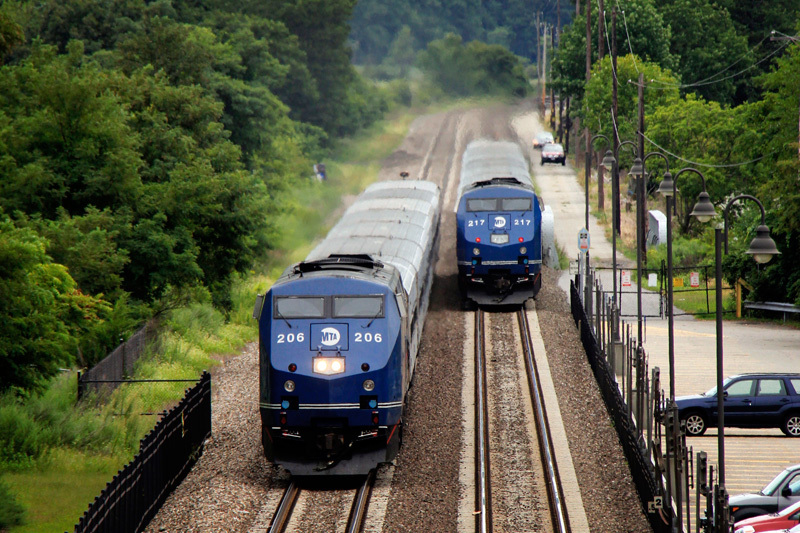 Photo on the right by Flickr user miningcamper. 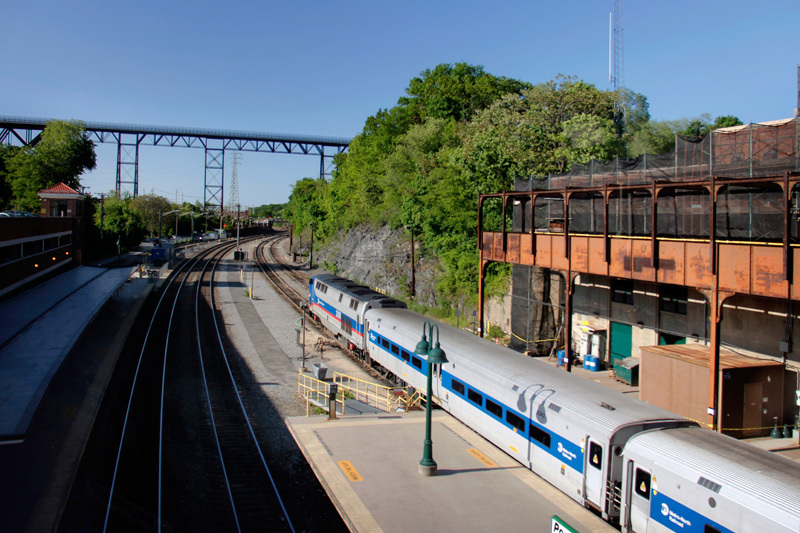 Arriving at Poughkeepsie by train, likely the first thing you’d notice is the large bridge running overhead, and not the station building itself, which is less visible on the track side. 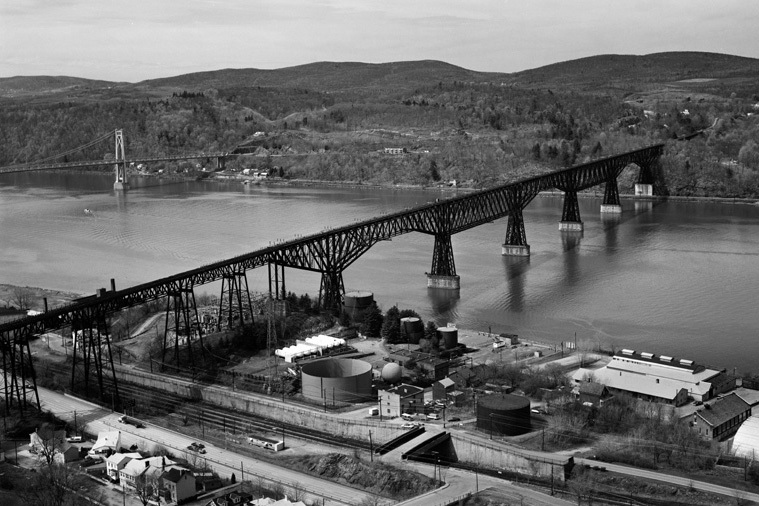 Constructed in 1888, the Poughkeepsie Railroad Bridge stretches from Poughkeepsie on the east side of the Hudson River, to Highland on the west. 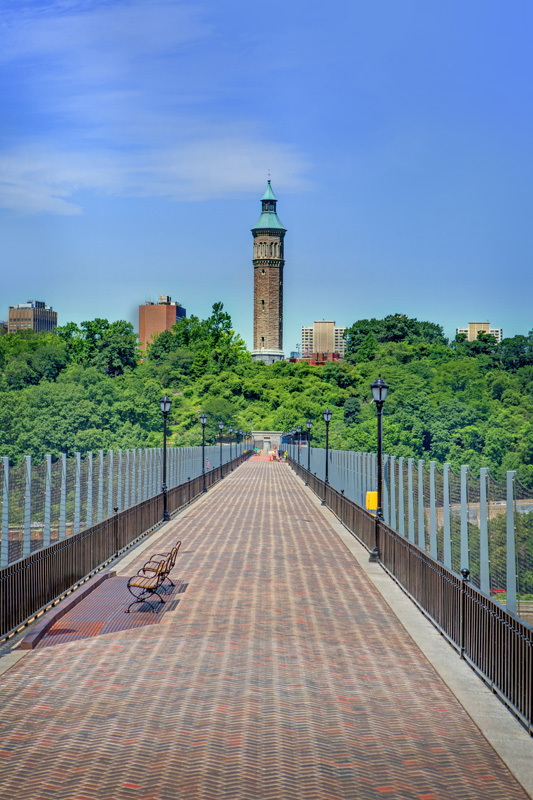 Today this bridge makes Poughkeepsie an even more attractive destination. 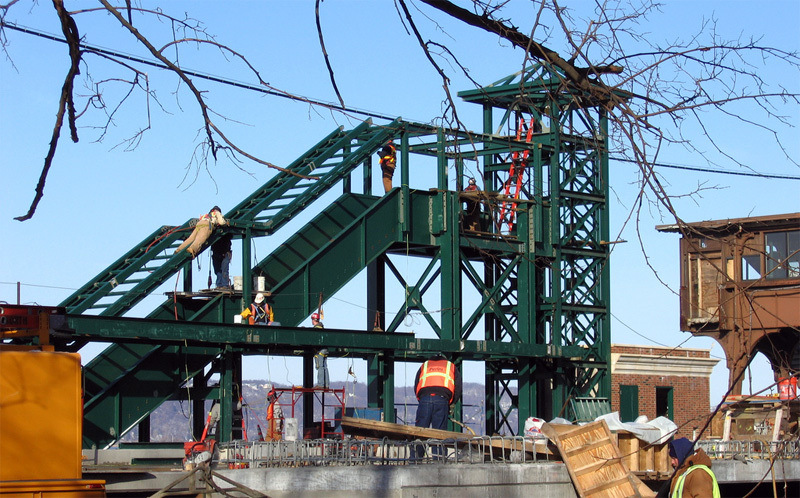 After serving railroad traffic for more than 75 years, the bridge was heavily damaged by fire and was for the most part abandoned until the early 2000’s when it was converted to pedestrian use as the Walkway Over the Hudson State Historic Park. 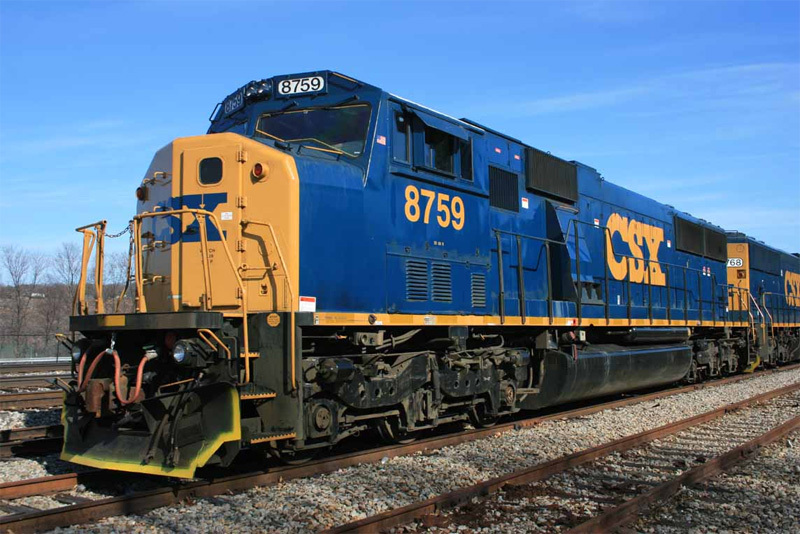 CSX at Poughkeepsie. 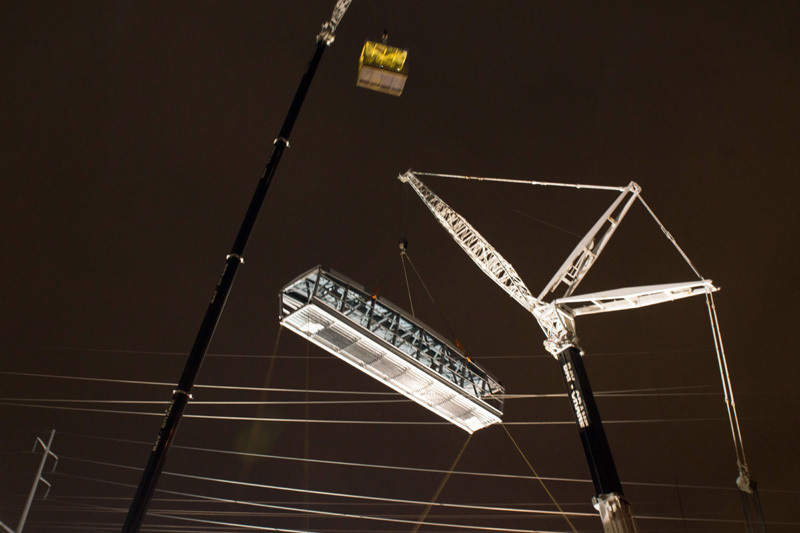 Photos by Mike Foley. 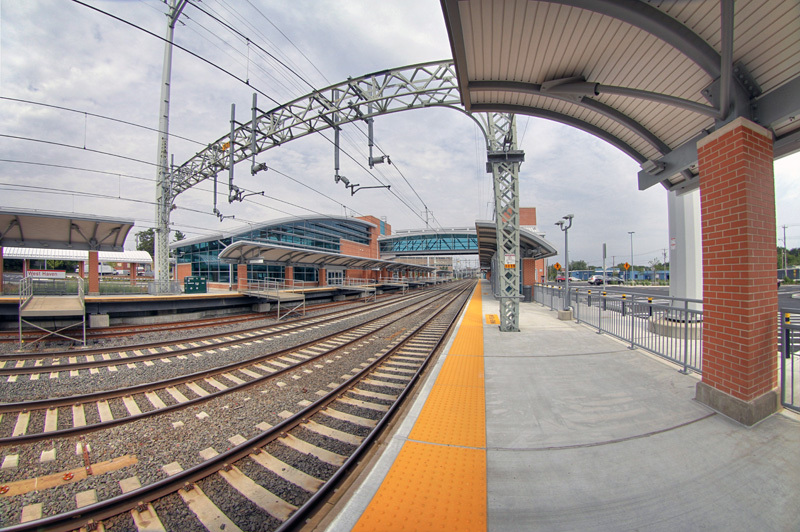 Poughkeepsie station in 2011, while undergoing renovations. 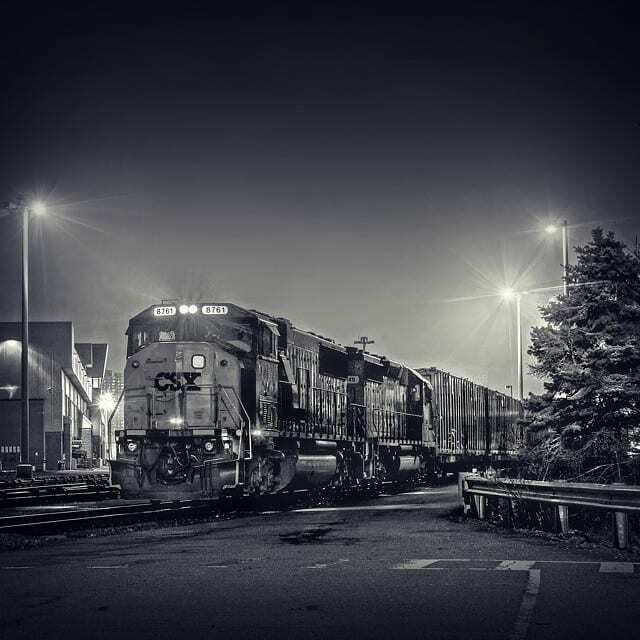 Photo by Mike Groll. 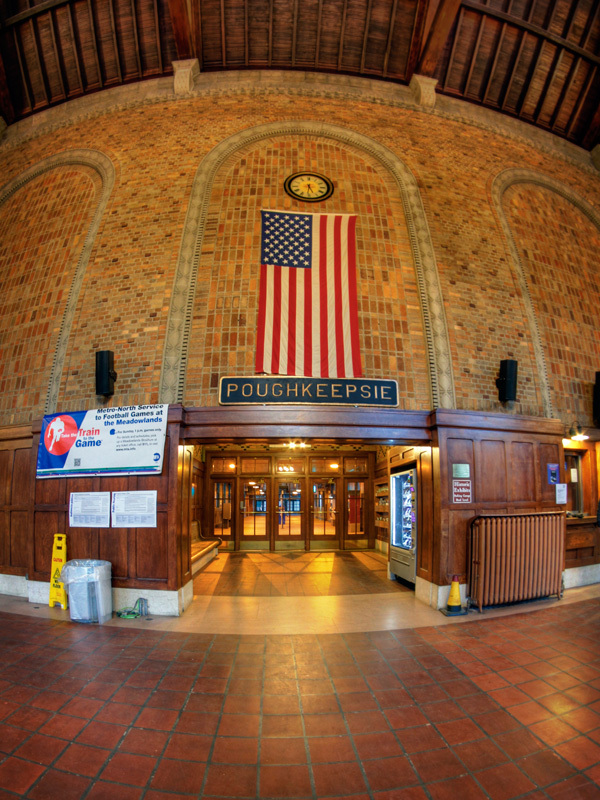 Today Poughkeepsie station is quite attractive, with Metro-North having spent more than $22 million dollars to restore and improve it. 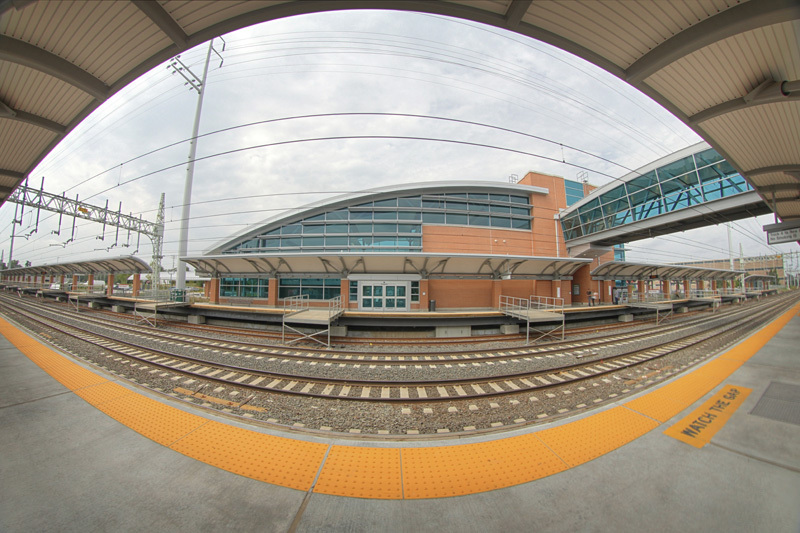 This included an ample parking garage on the west side of the tracks, and a walkway and pavilion for people heading to the waterfront. 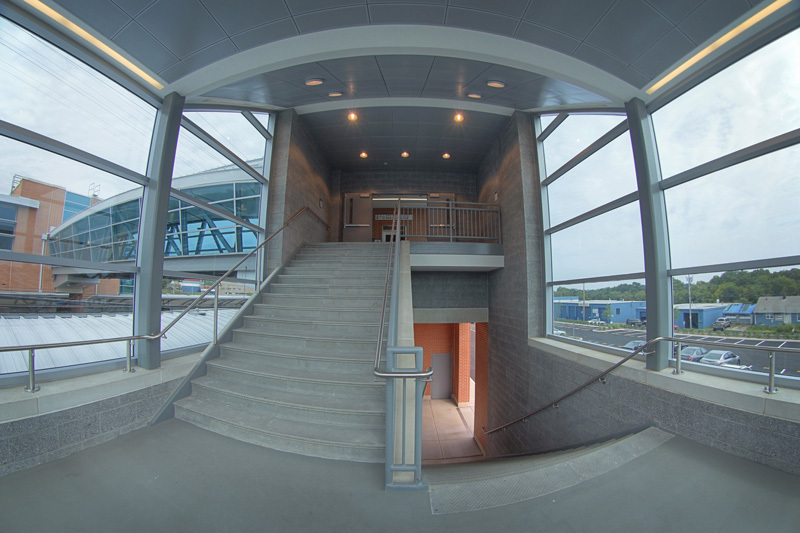 Renovations to the area continue, including an elevator to make accessing the Walkway over the Hudson from the station easier. 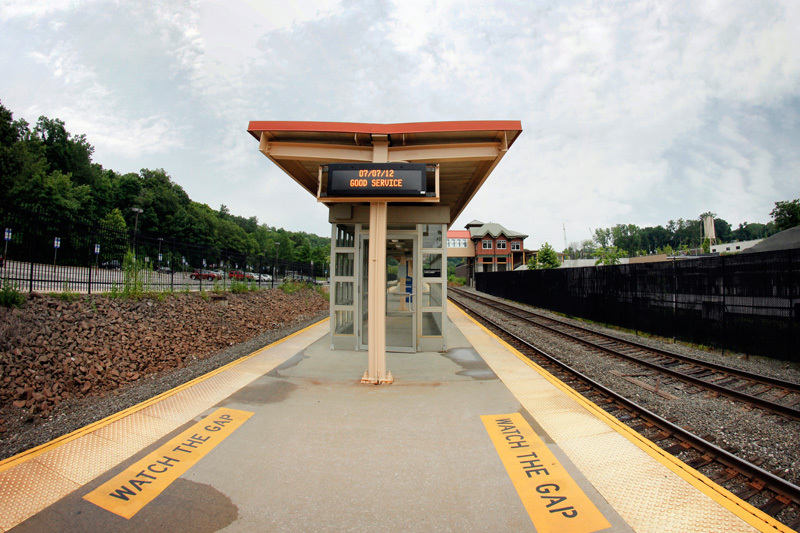 Though a bit bigger than most Metro-North stations, the setup is relatively similar. 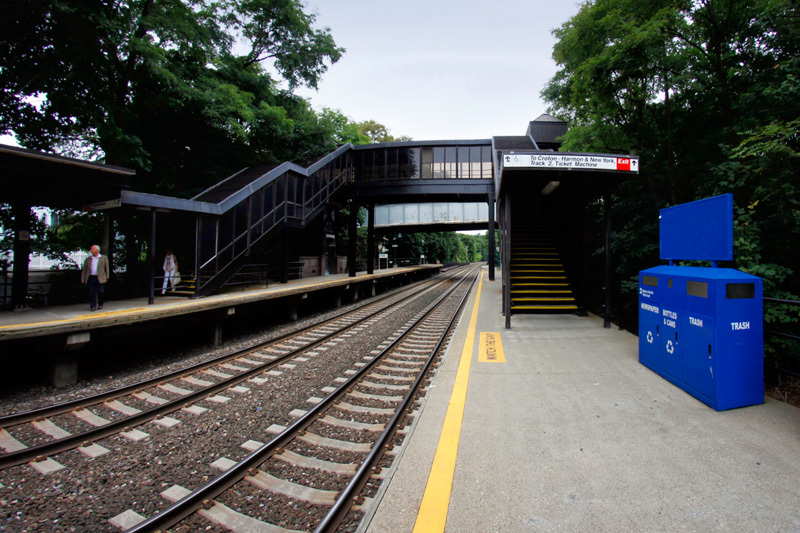 Pretty much every station has ticket machines, wire benches, and blue trash bins, as does Poughkeepsie. 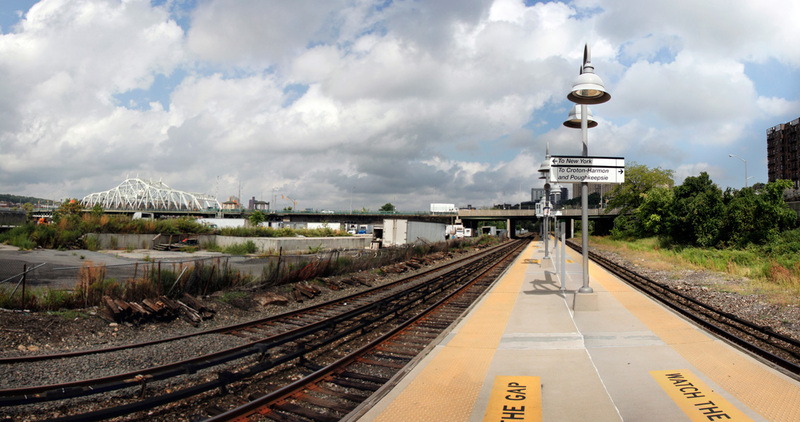 Unlike most other stations, Poughkeepsie has one island platform, and two side platforms, although the one side platform is lower level and not used by passengers. 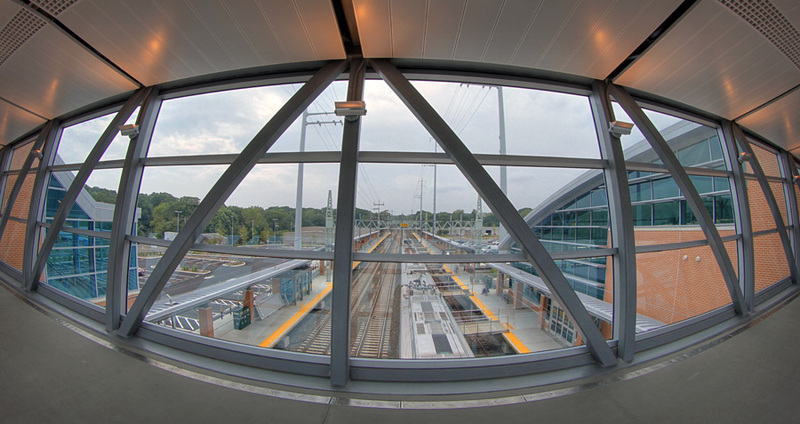 All of the tracks are accessible to the main station by an overpass, which also connects to the parking garage. 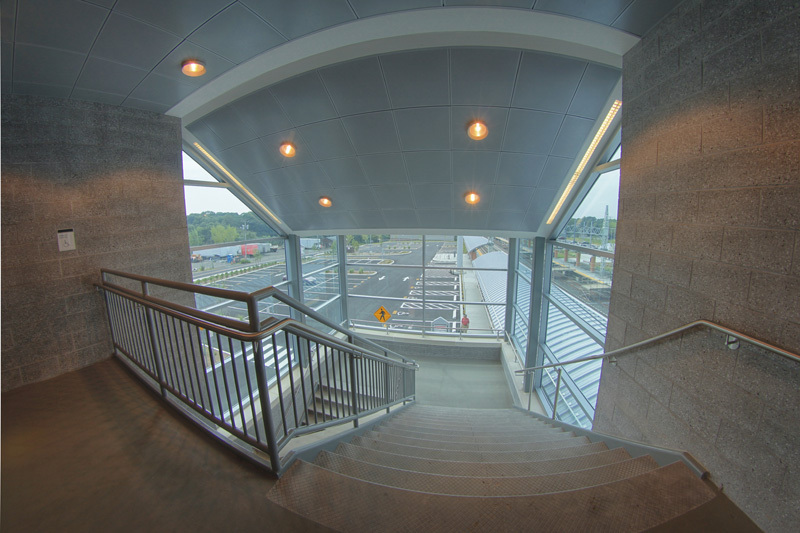 The overpass, covered in attractive wood paneling, is far nicer than the relatively utilitarian overpasses you see at most Metro-North stations. 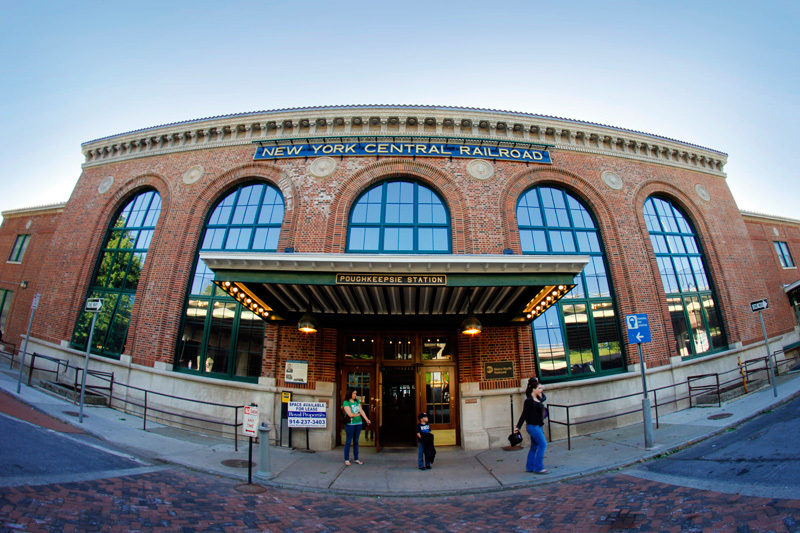 In all, Poughkeepsie is a lovely station, and definitely worth visiting, if only for the lovely historic station, with the New York Central sign on the front. 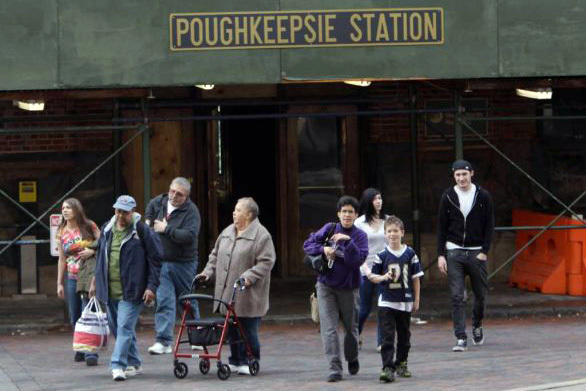 But a wide variety of restaurants and attractions in the area, most especially the Walkway Over the Hudson, make Poughkeepsie one of the nicest places we’ve seen on our now complete Metro-North tour. 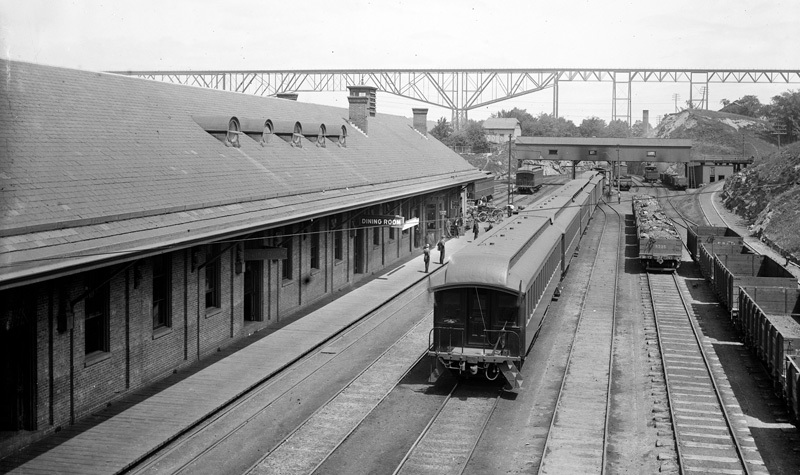 The old station at Marble Hill, pictured in 1927, and in 1946. 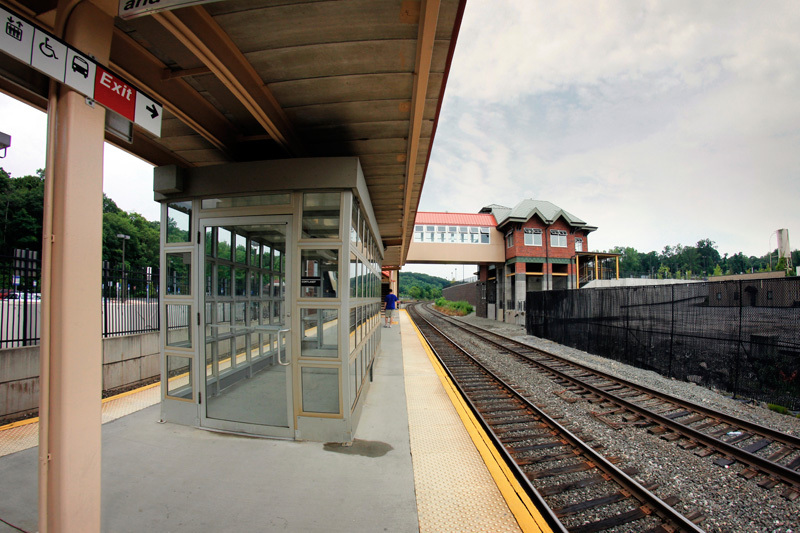 As we’ve toured the Hudson Line, we’ve encountered several stations with fairly confusing backgrounds. 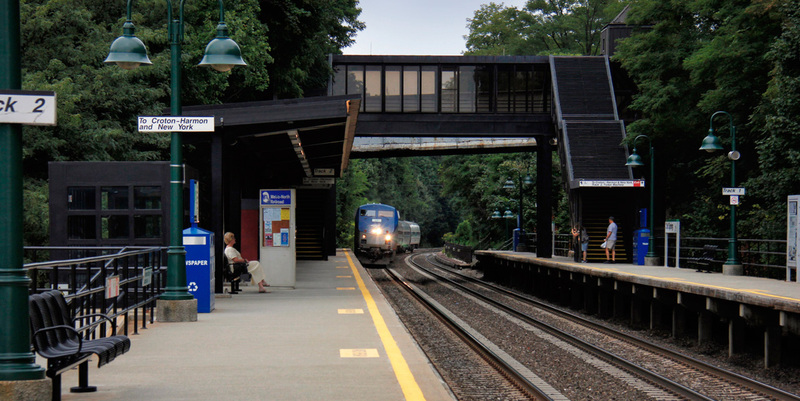 There are stations that nobody seems to be able to spell correctly, like “Spitendivel” and “Pokipse.” And there’s also Ardsley-on-Hudson, which isn’t in Ardsley, and shouldn’t be confused with the former Putnam Division station of Ardsley (despite the fact that the New York Central printed Ardsley-on-Hudson timetables as just Ardsley). 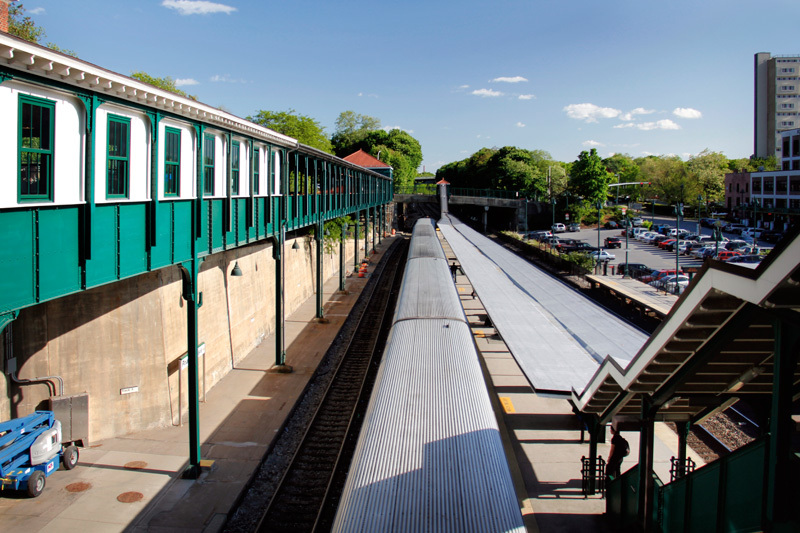 Today’s tour takes us back to the Bronx, to another station also surrounded in a bit of confusion – Marble Hill. 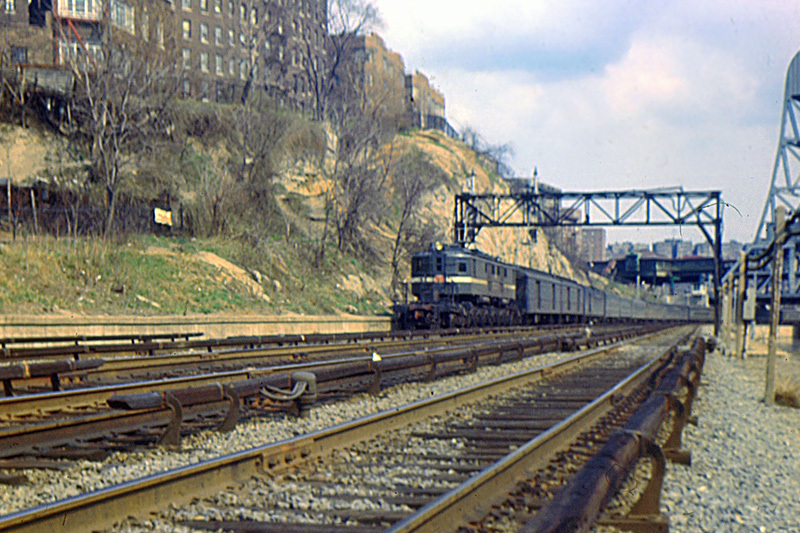 Views of the tracks near Marble Hill in 1935. 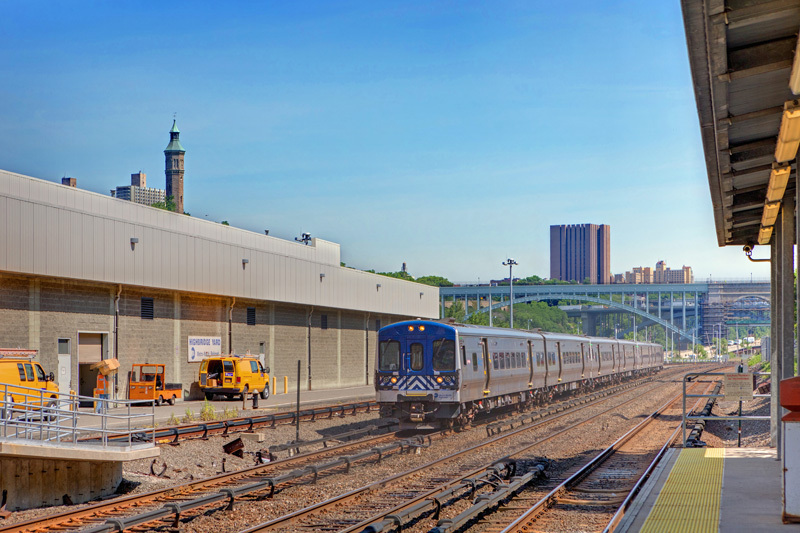 Special timetable with new daytime trains for the West Bronx stations, including Marble Hill… where that Bronx name is subject to debate. 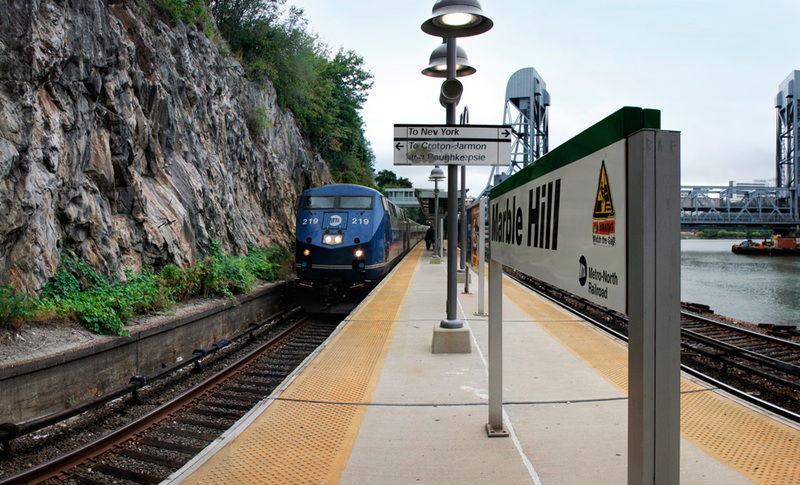 If you were to look at any of the local timetables printed by the railroad, or even at a map, you’d likely get the idea that Marble Hill is part of the Bronx. 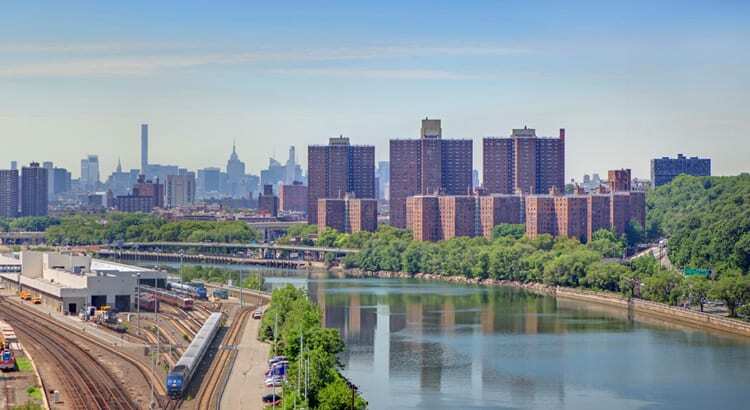 On the other hand, I probably have at least one person that wants to hit me for calling Marble Hill part of the Bronx in the paragraph above. 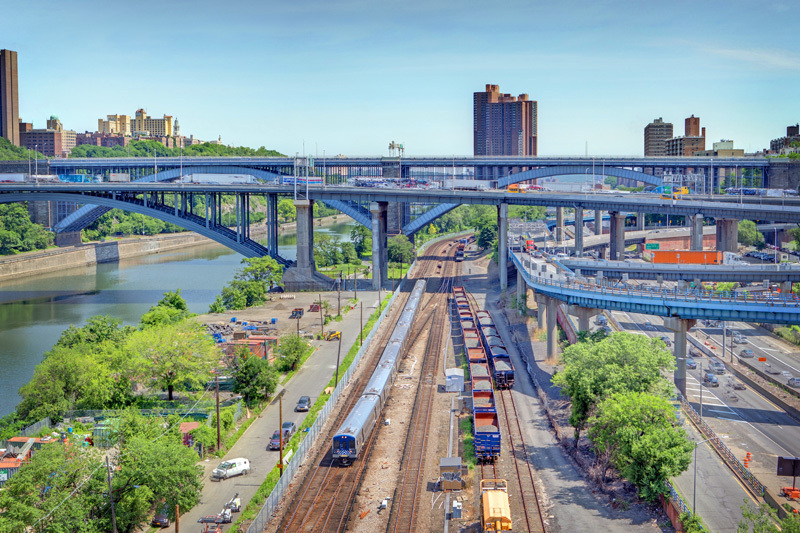 As New York City grew, we humans have significantly changed the landscape of Manhattan island and beyond – and I’m not just talking about massive buildings and skyscrapers. 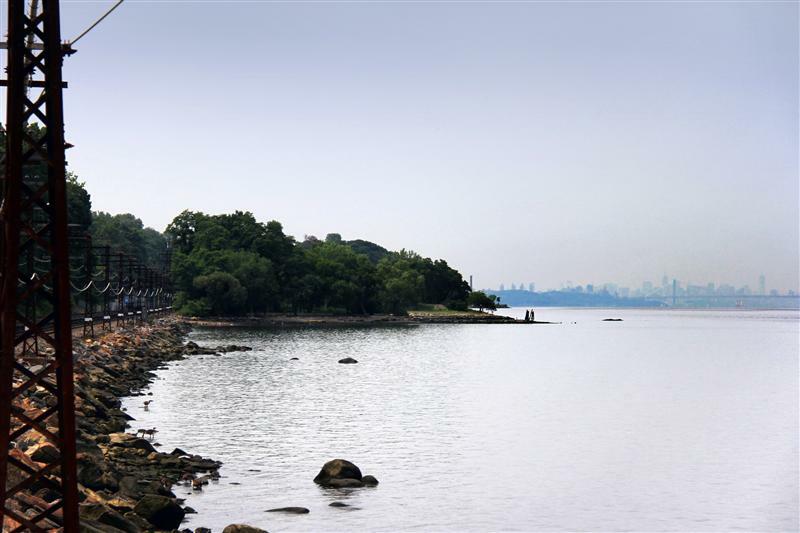 At one point in history, Marble Hill – named for the marble quarries once located here – was part of Manhattan island. 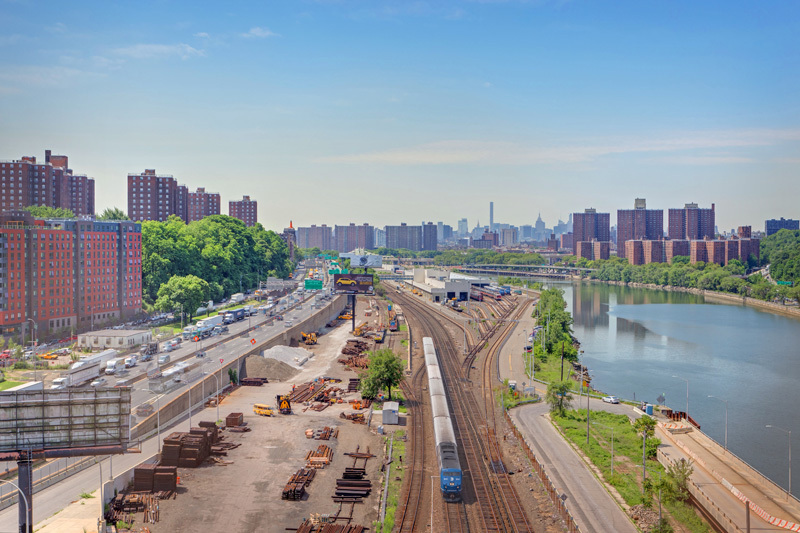 When a canal was built to link the Harlem and Hudson Rivers, Marble Hill was separated from Manhattan and became its own island. 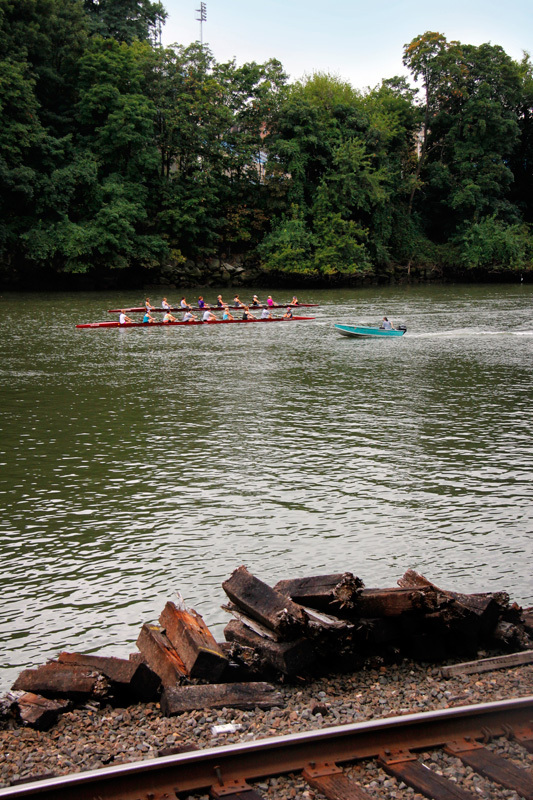 And when, in 1914, the original course of the Harlem River was filled in, Marble Hill became connected geographically with the Bronx. Map of the Marble Hill area from 1895 (when the canal was completed), and an aerial view of what the area looks like now. Note the “island” of Marble Hill on the 1895 map. 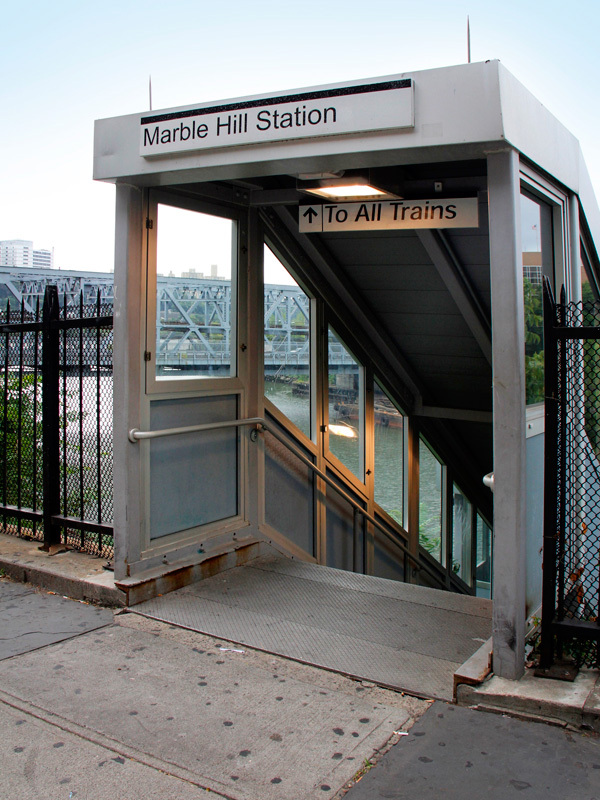 Politically, residents of Marble Hill vote for the Manhattan Borough President, Senator, City Councilman and Assemblyman. 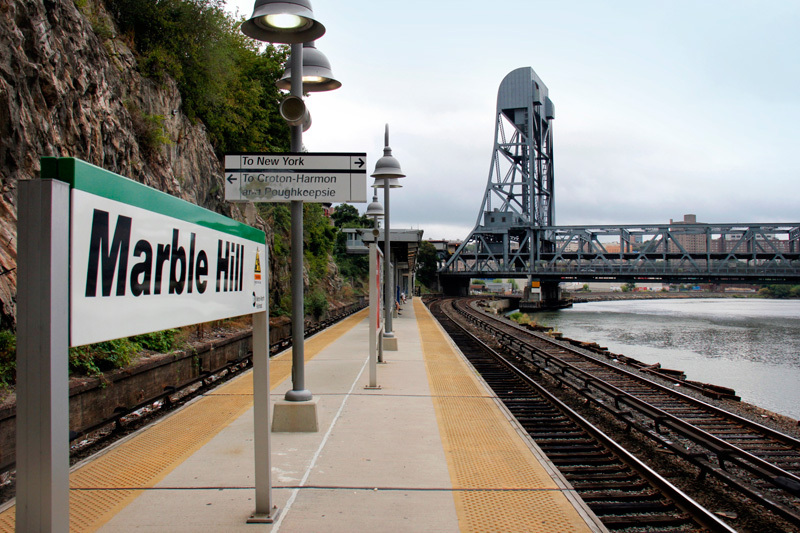 But due to the geographic nature of the area, Marble Hill is serviced by the police, emergency and fire department from the Bronx. 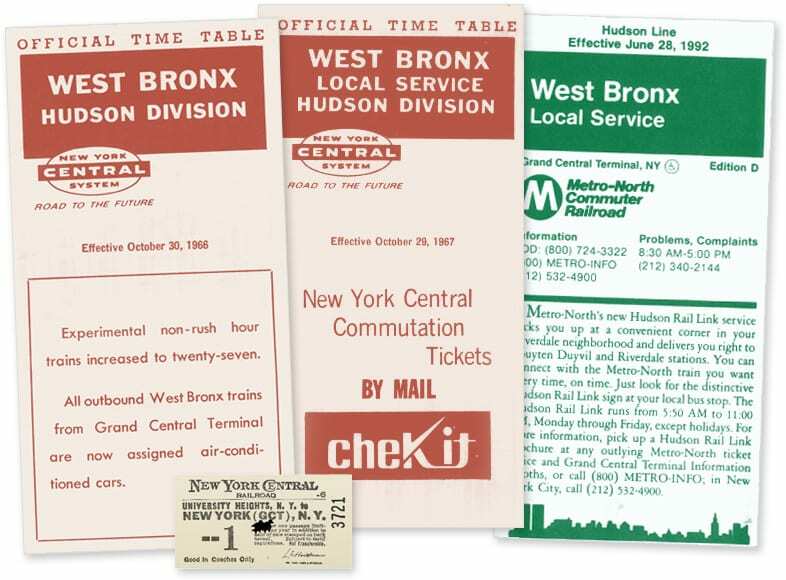 Because of the general confusion, residents of Marble Hill end up in the archaic directory known as the “phone book” for both the Bronx and Manhattan, and letters written to either borough will be delivered by the US Postal Service. 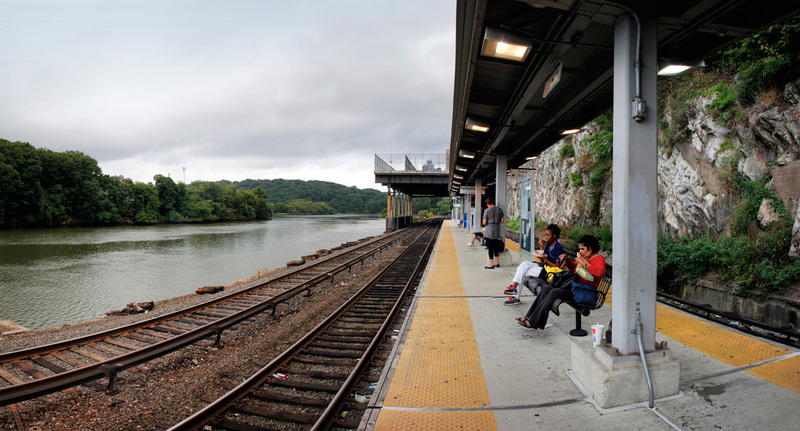 Nonetheless, Metro-North considers it part of the Bronx, and you’ll find Marble Hill listed in the local timetable for the West Bronx. 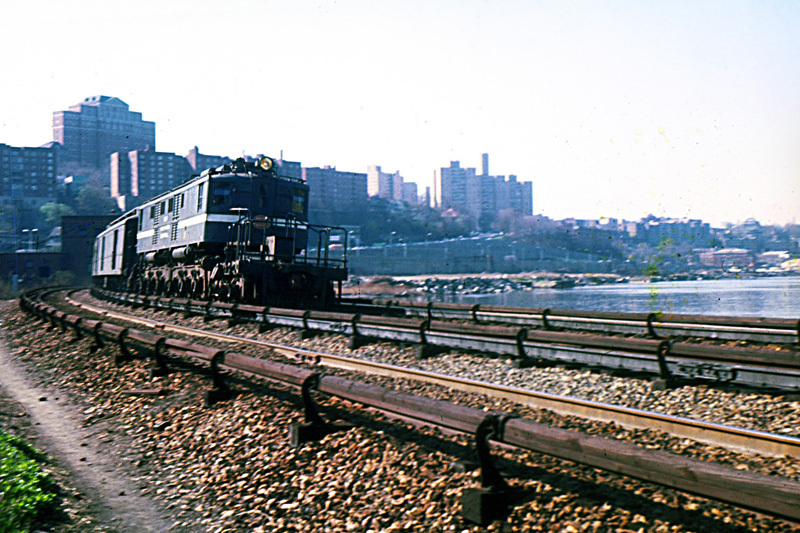 Around Marble Hill in the ’60’s. 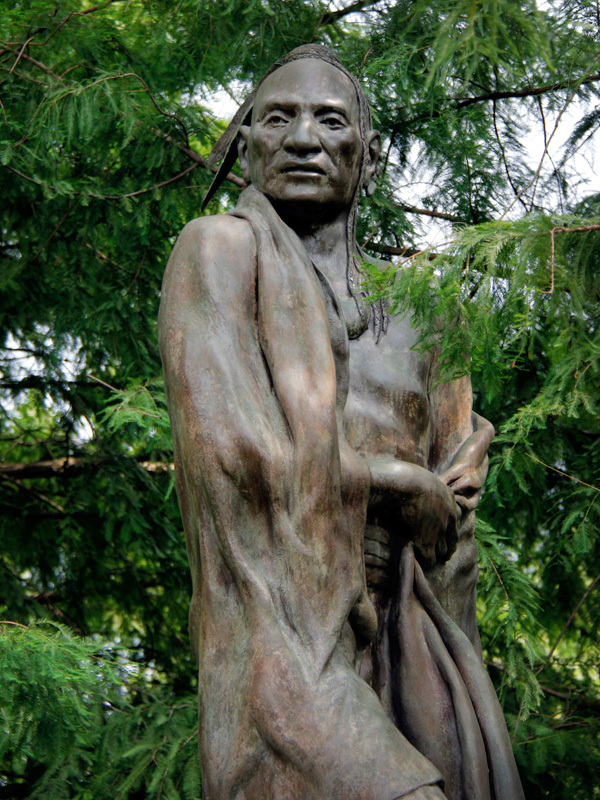 Photos by Herbert Maruska. 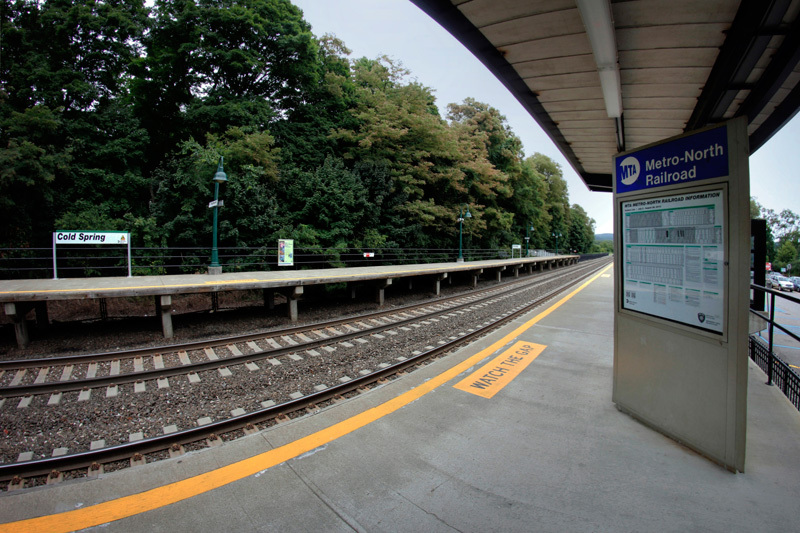 The current Metro-North station at Marble Hill is located a bit more north than the historical station operated by the New York Central. 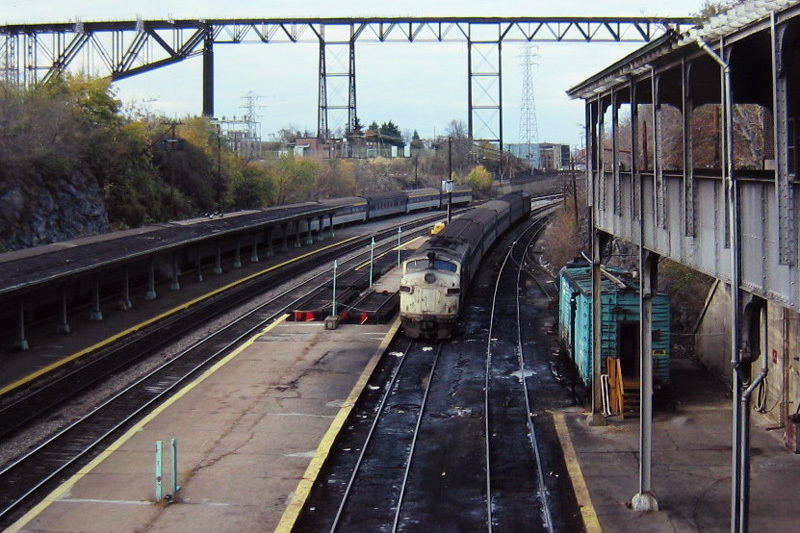 The old station had four tracks running by it (visible in the photos above), where the current station only has three. 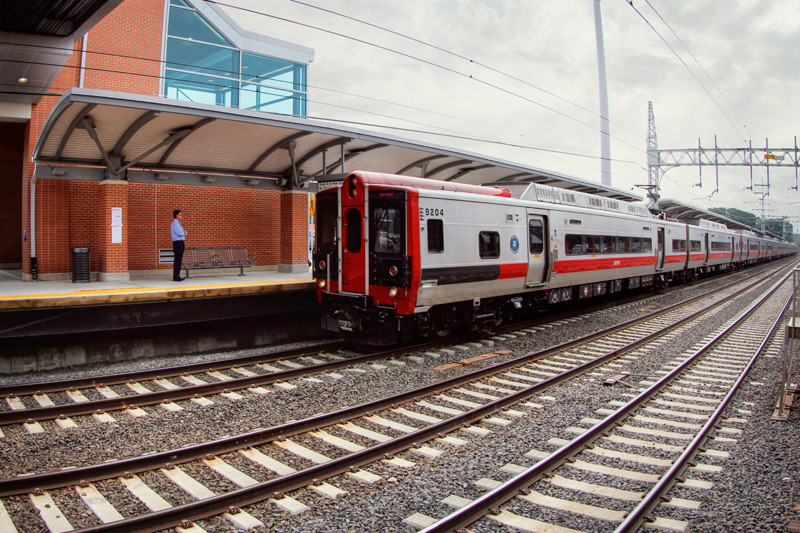 Both locations, however, are easily within walking distance of the 225th Street subway station, which has a significant effect on the ridership at the station. 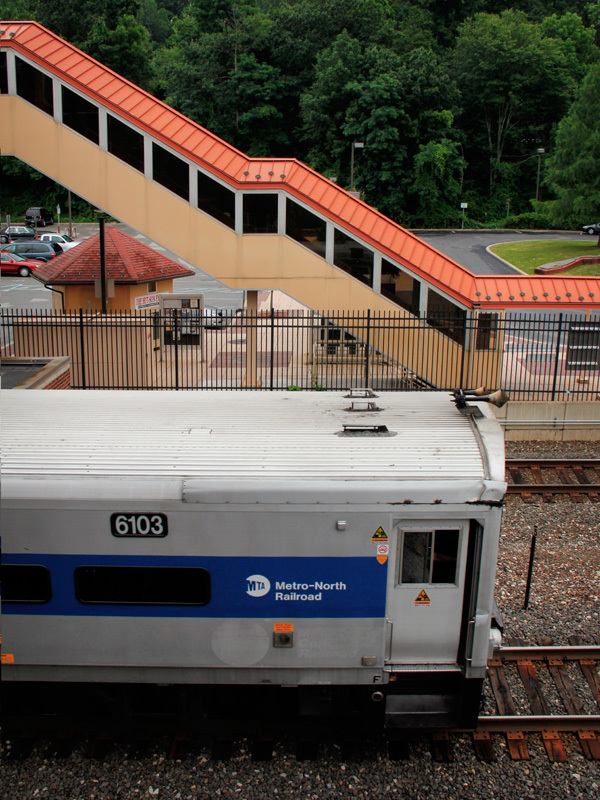 In 2008, Metro-North reported that over 900 people were using Marble Hill station, but only 100 were using it to get to Grand Central. 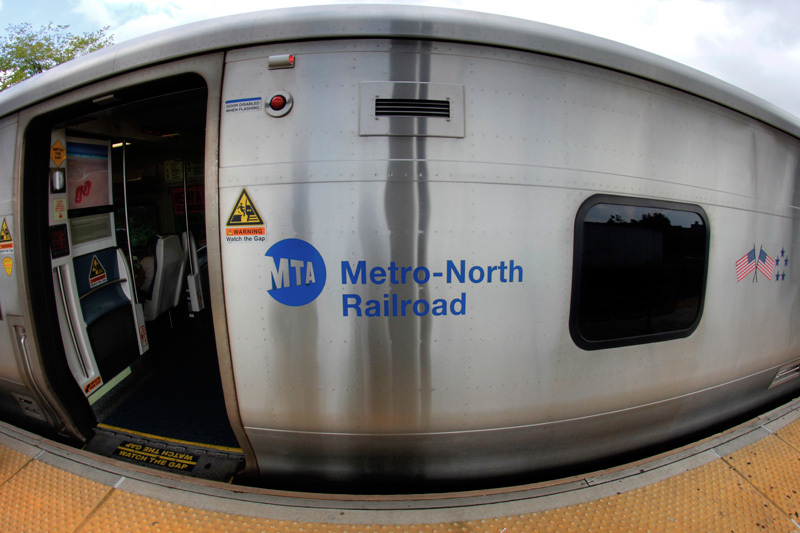 At least 300 people were getting off southbound Hudson Line trains and transferring to the subway. 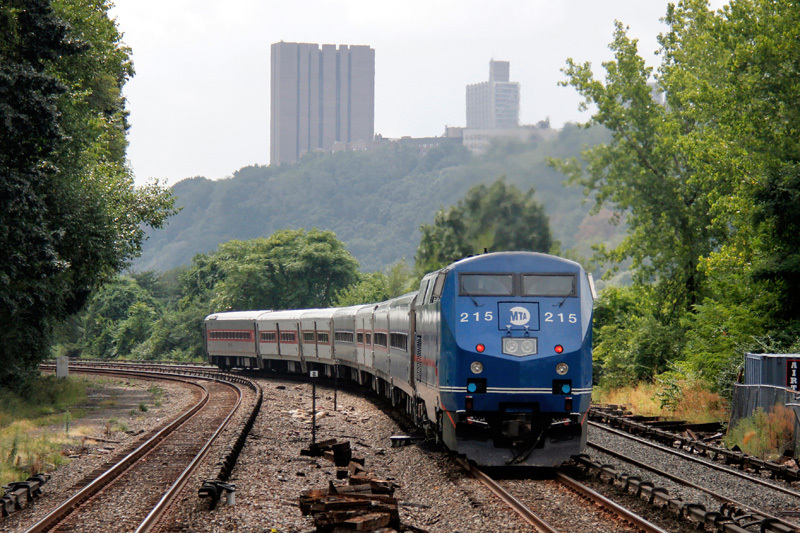 Another 300 were using Marble Hill for the reverse commute, possibly making the connection with the subway. 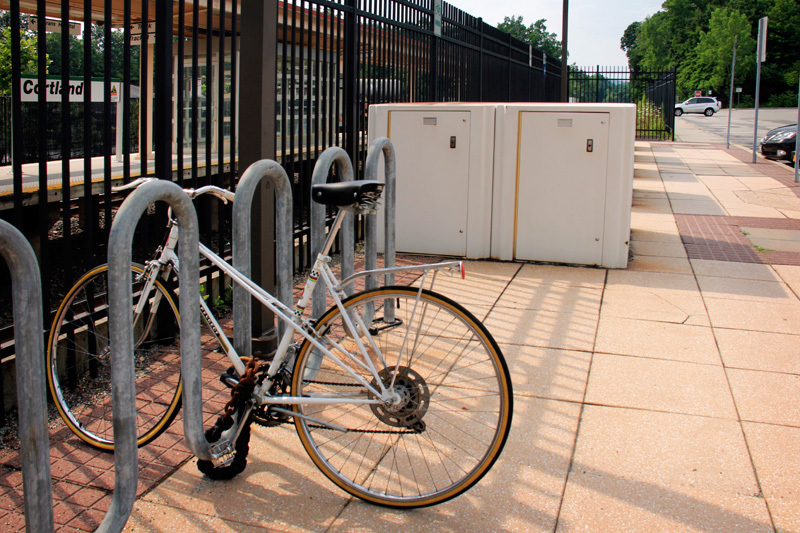 Although it would likely lengthen the commute time, many people may be doing this as a cost saving measure. 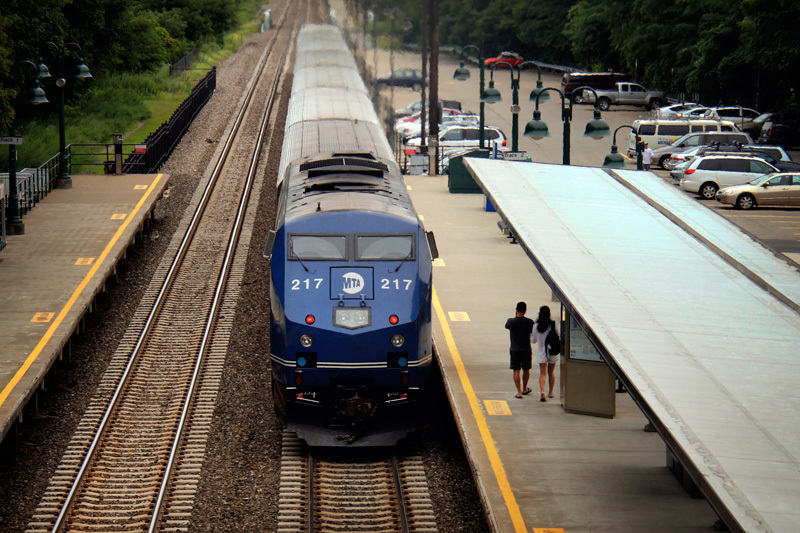 For example, a Tarrytown to Grand Central monthly would cost $266, but a Tarrytown to Marble Hill monthly only costs $88. 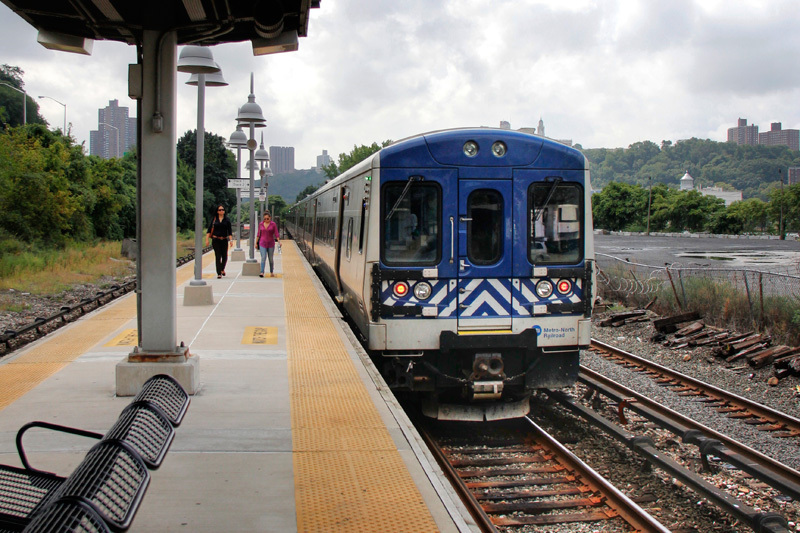 Purchasing that along with an unlimited-ride Metro-Card would yield a savings of $74. 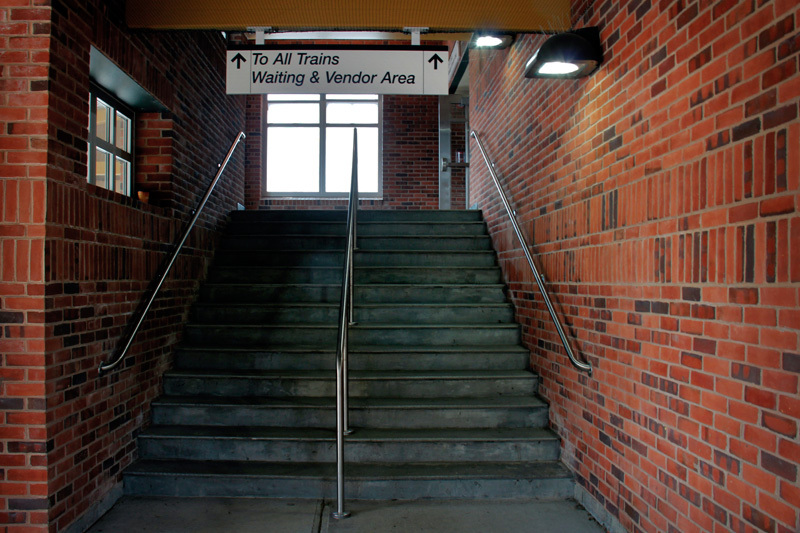 For others, the subway may just provide easier access to their places of work. 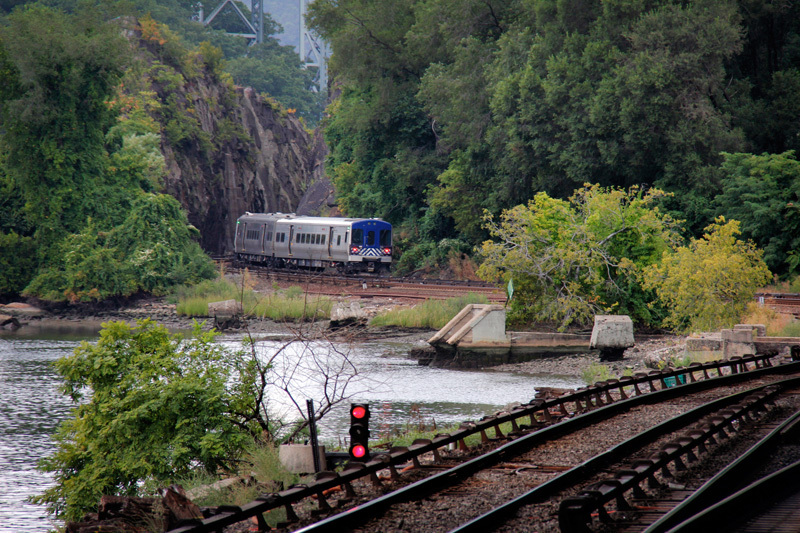 Some non-Metro-North action in Marble Hill. 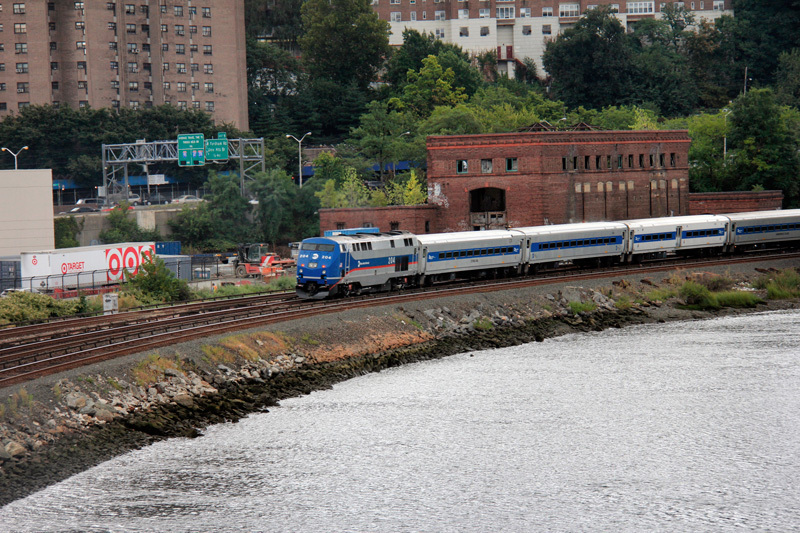 Seeing Amtrak trains at Marble Hill is a rarity, as they generally branch off from the Hudson Line before Spuyten Duyvil, unless for some reason they need to be detoured. 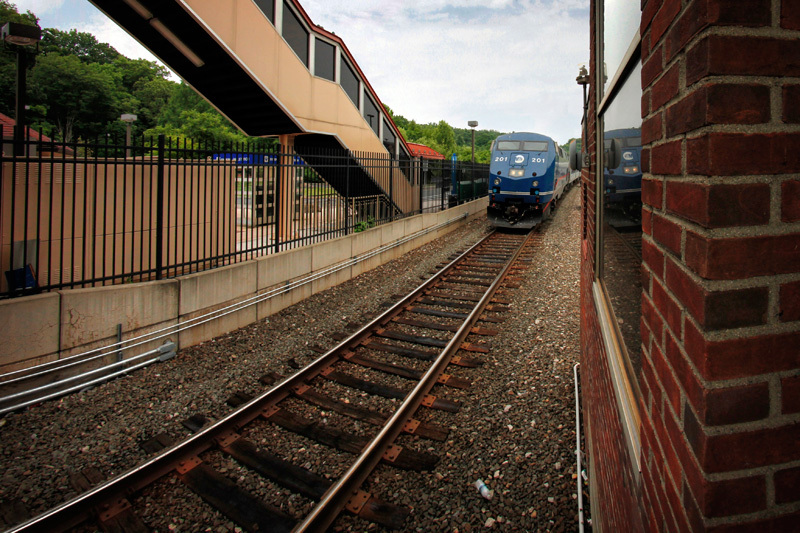 Photos by Mike Foley. 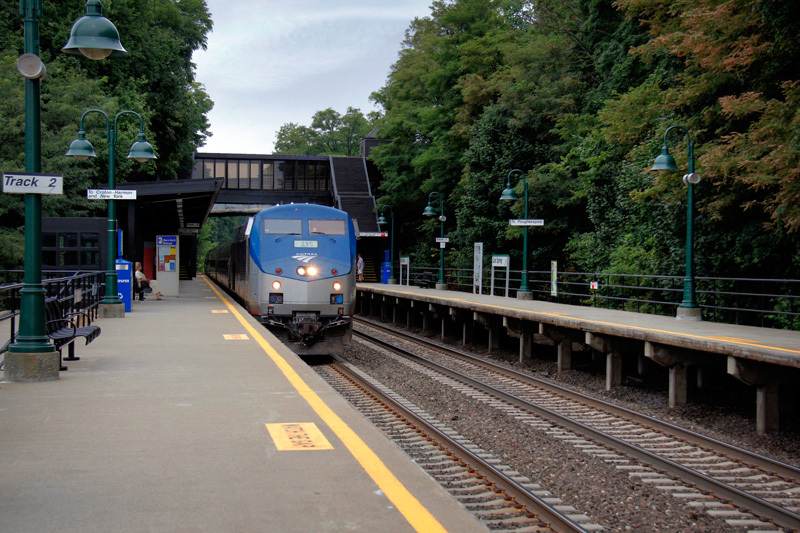 Besides the geographic anomaly and the unique ridership of Marble Hill, the station really is typical of Metro-North. 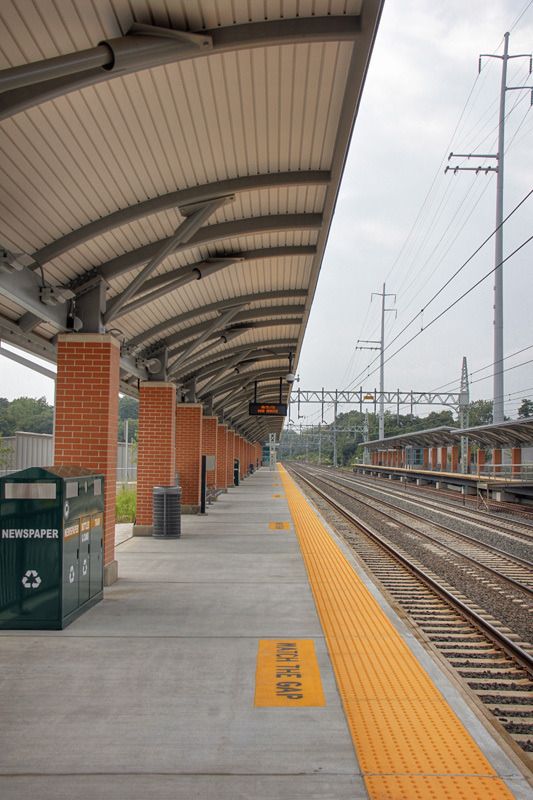 You can find the same station signs, wire benches, blue trash bins, and ticket vending machines as almost every other station. 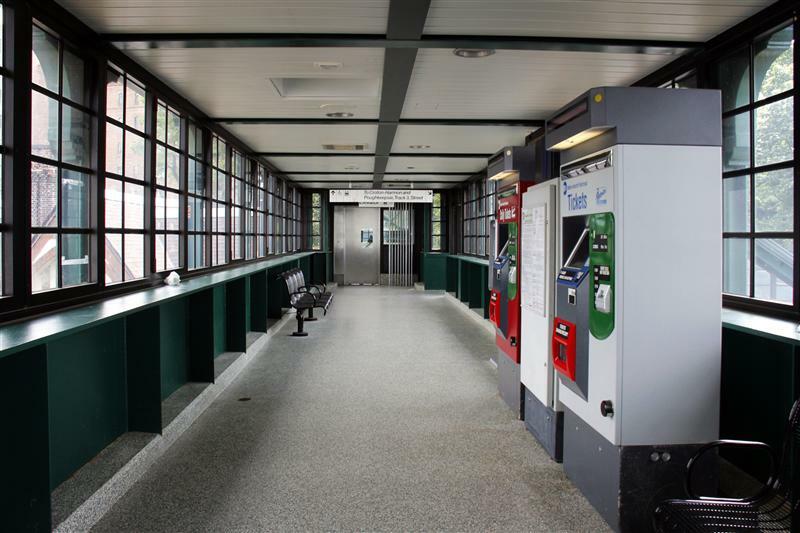 The station itself consists of a short island platform, connected to street level with an overpass, which contains the aforementioned ticket machines. 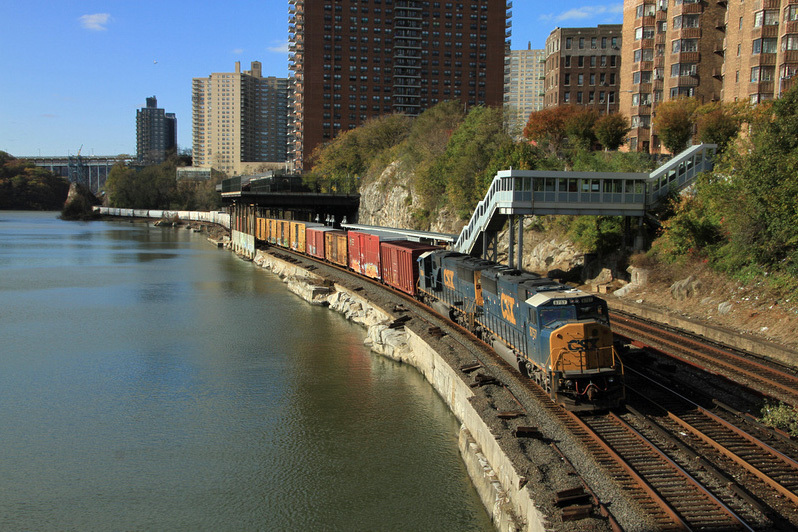 The station is located right alongside the river, and visible from the station is the Broadway Bridge, which connects both cars and subway trains to Manhattan. 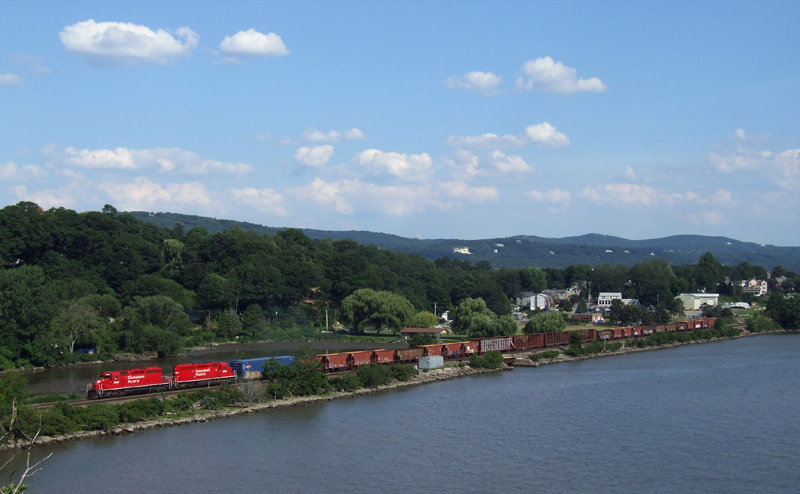 That about wraps things up for Marble Hill – next week we’ll feature our final Tuesday Tour of the Hudson Line, Poughkeepsie. 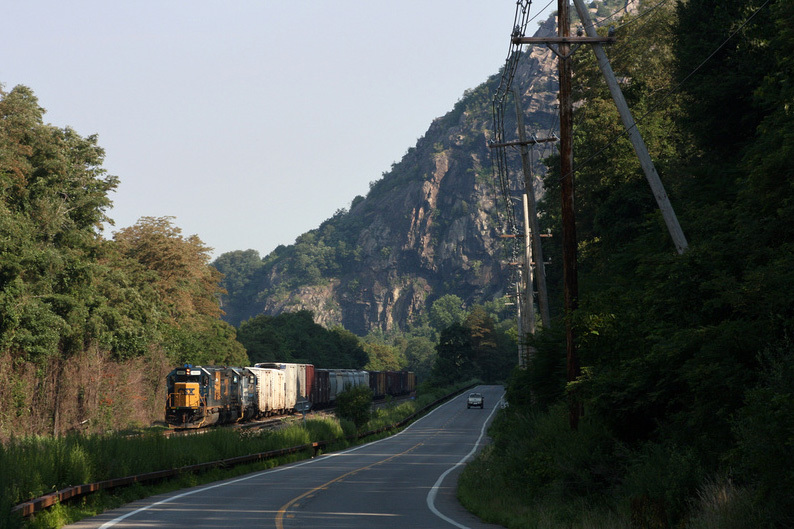 Views of the tracks and the Hudson Highlands near Cold Spring. 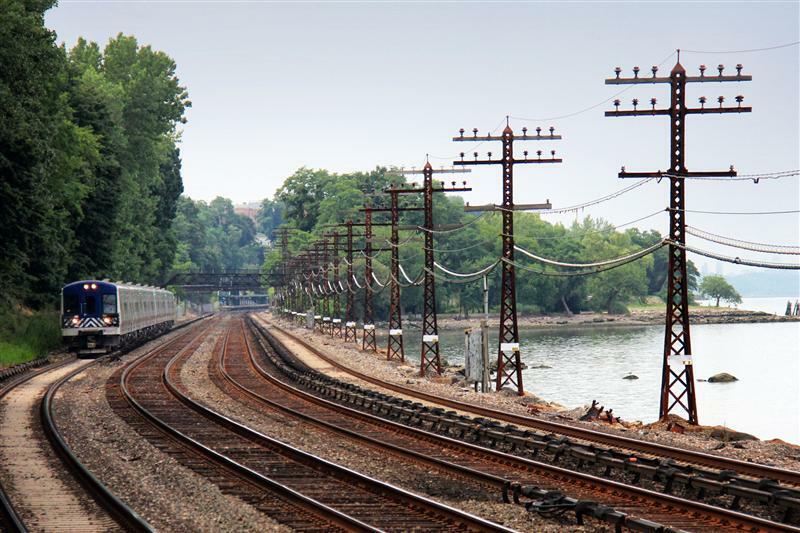 While beautiful views can be found along the entire Hudson Line, there’s something about the upper, un-electrified portion of the line that I find especially attractive. 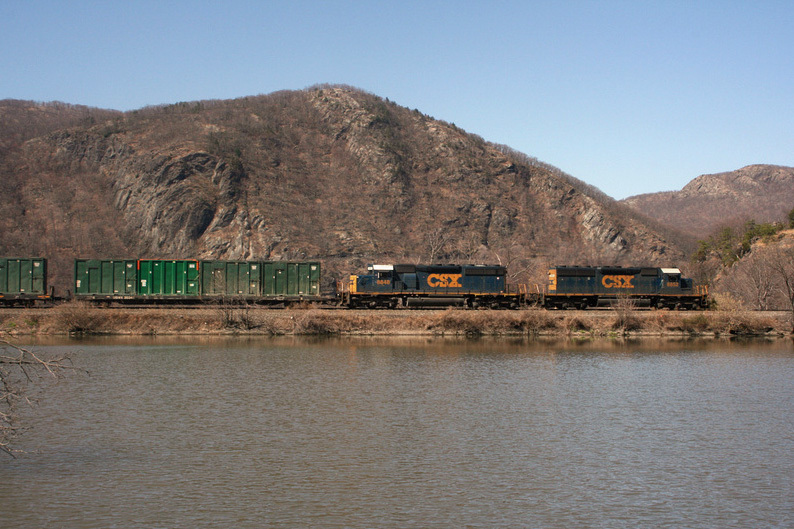 Nestled amongst the Hudson Highlands, many of the stations we’ve featured, like Breakneck Ridge and Manitou, offer hikes with wonderful views of both the mountains and the river. 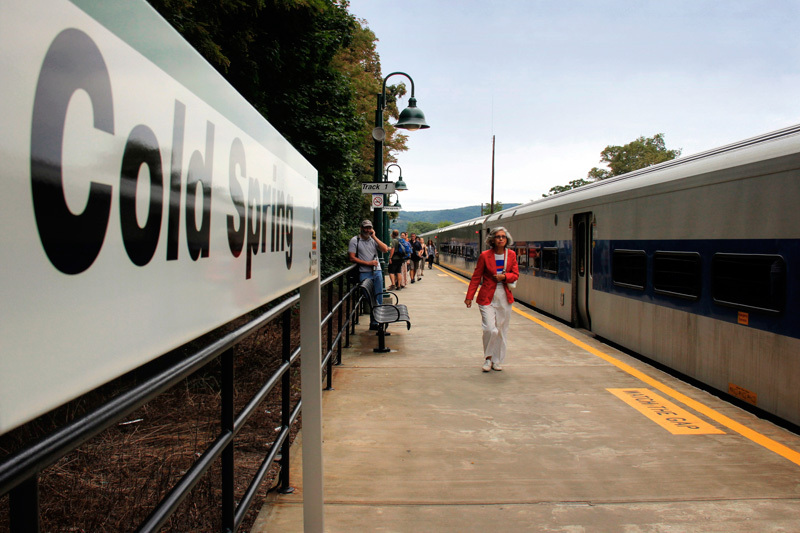 Today’s Tuesday Tour takes us to Cold Spring, just less than 53 miles from Grand Central. 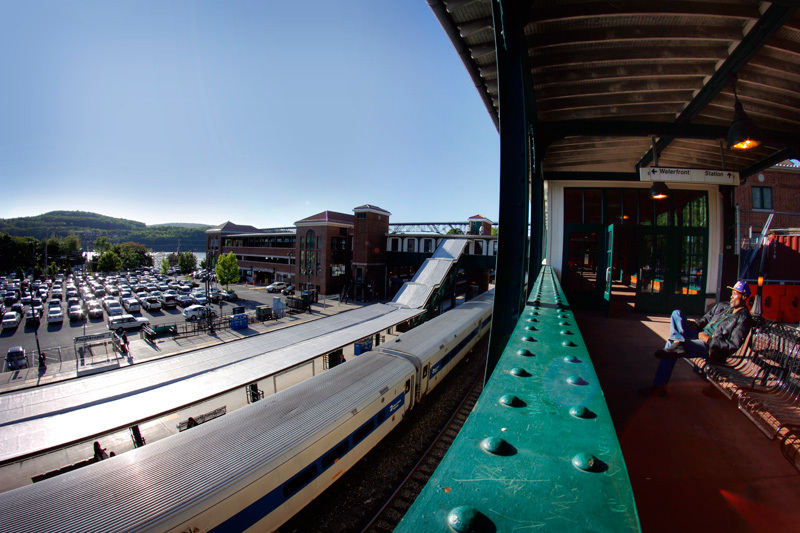 Unlike the aforementioned stations, Cold Spring is unique in that it offers both a charming downtown area with shops and restaurants, as well as hikes with beautiful views. 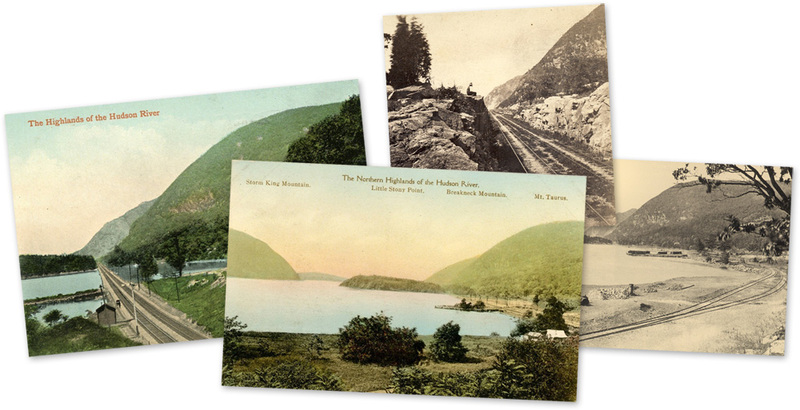 The trail to hike up Mount Taurus (visible in one of the postcards above) is less than a mile walk from the train station. 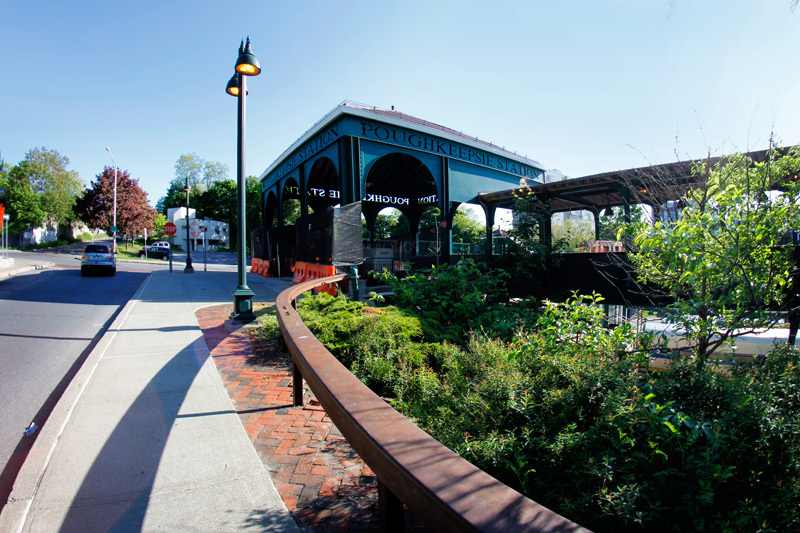 And if you’re not into the whole hiking thing, you could probably spend the day at the various Main Street shops, or the local Putnam History Museum. 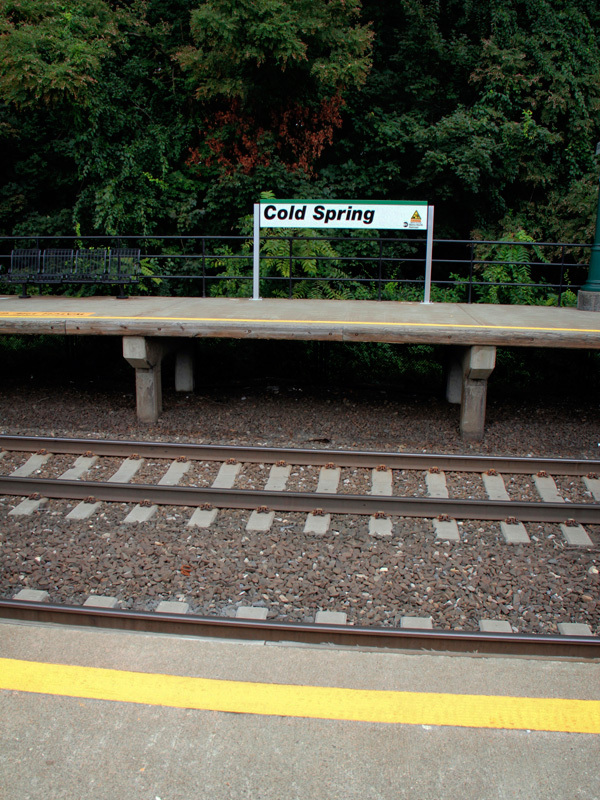 In other words, if you’re looking for a cool place accessible by Metro-North, Cold Spring would certainly be a nice pick. 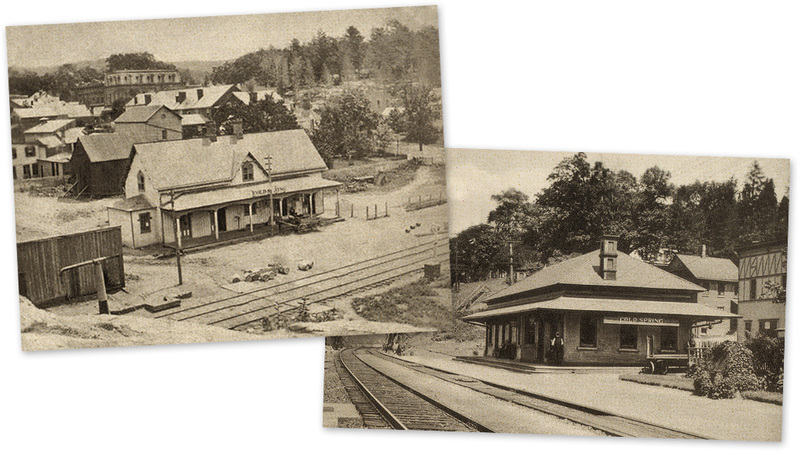 Civil war era station at Cold Spring, and the brick station it was replaced with in 1884. 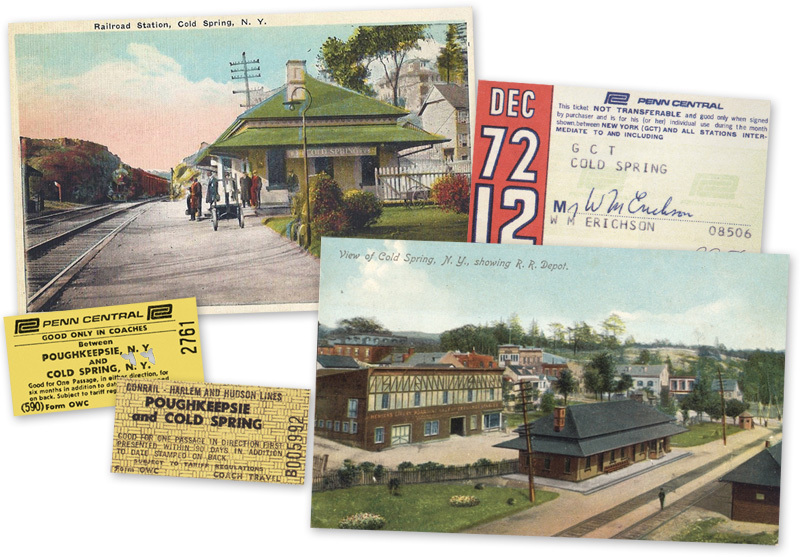 As one would expect from such a charming downtown area, the original Cold Spring station still stands, though it is not in use for any railroad purposes. 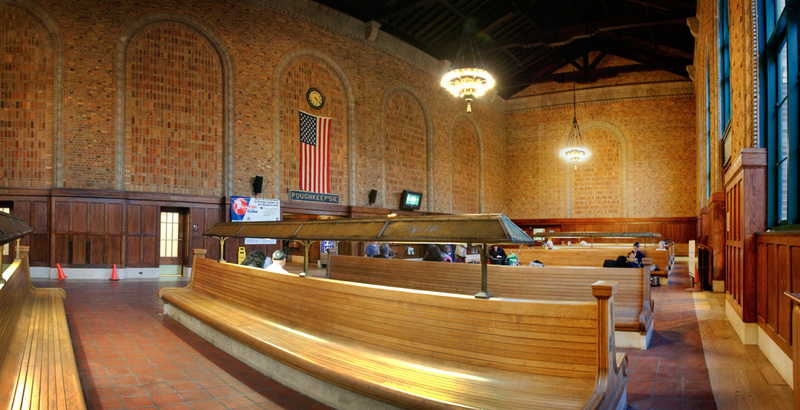 Instead the station is home to the aptly named Cold Spring Depot restaurant. 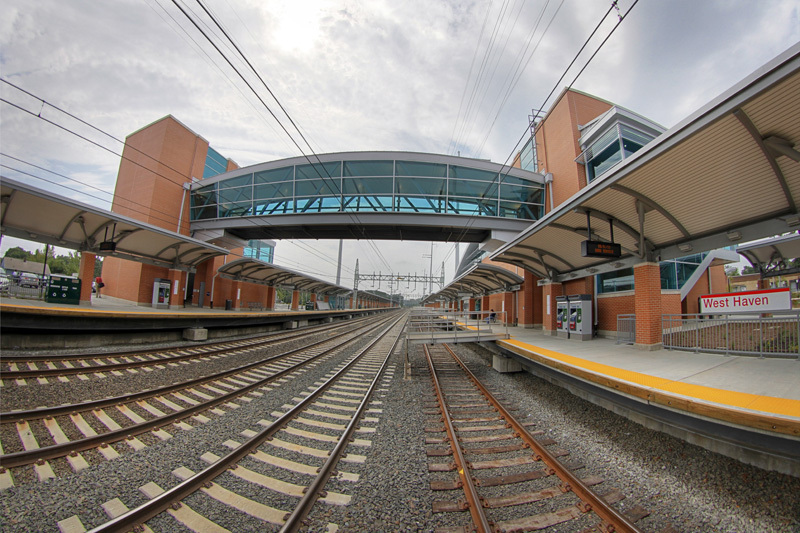 Built in 1884, the historic brick station replaced an earlier wooden one built at that site. 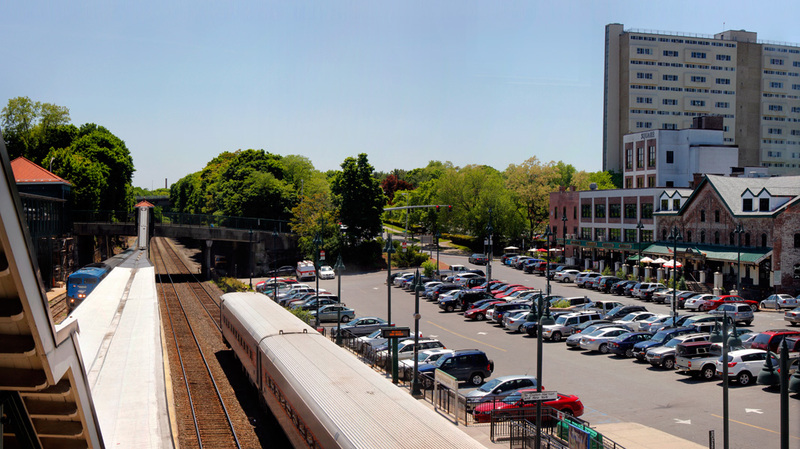 The station used by Metro-North is south of the historic station and village area, though the two are connected via pathways. 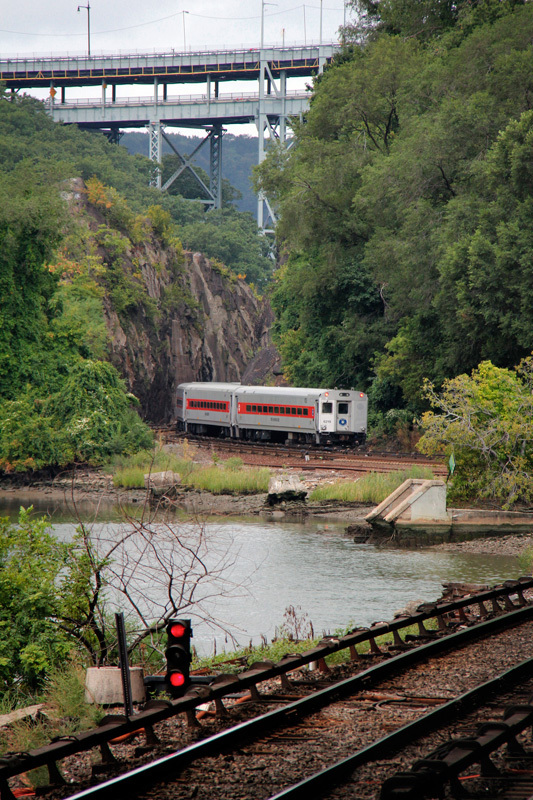 Some interesting shots near Cold Spring… When we featured Garrison, I failed to mention that both that station and the tracks around Cold Spring were used in the filming of the movie Hello Dolly. 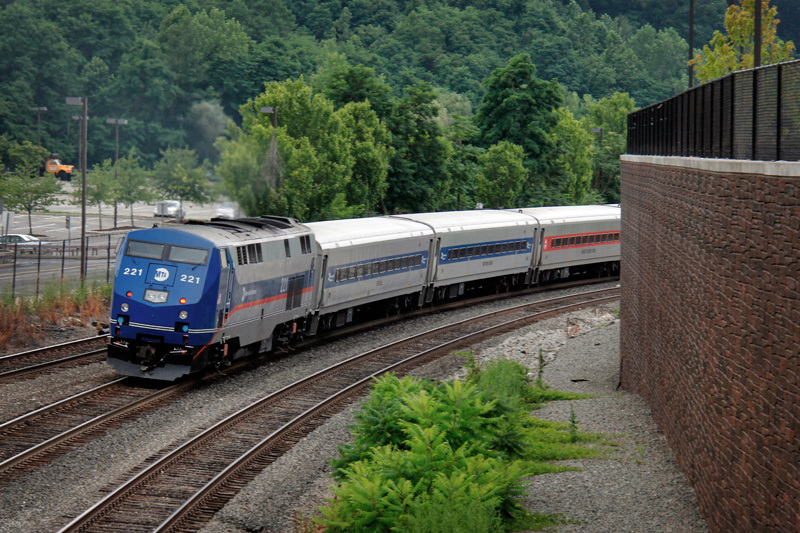 A little non-Metro-North action near Cold Spring. 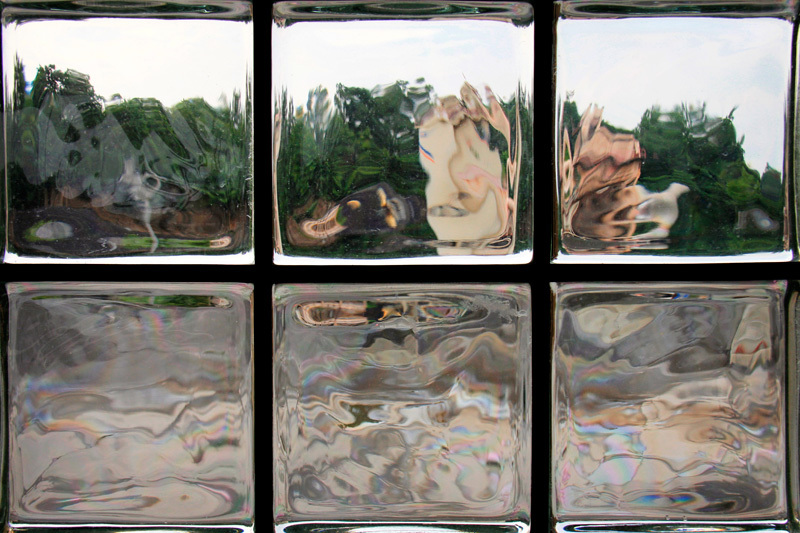 First three photos by Mike Foley, fourth by Chris Southwell. 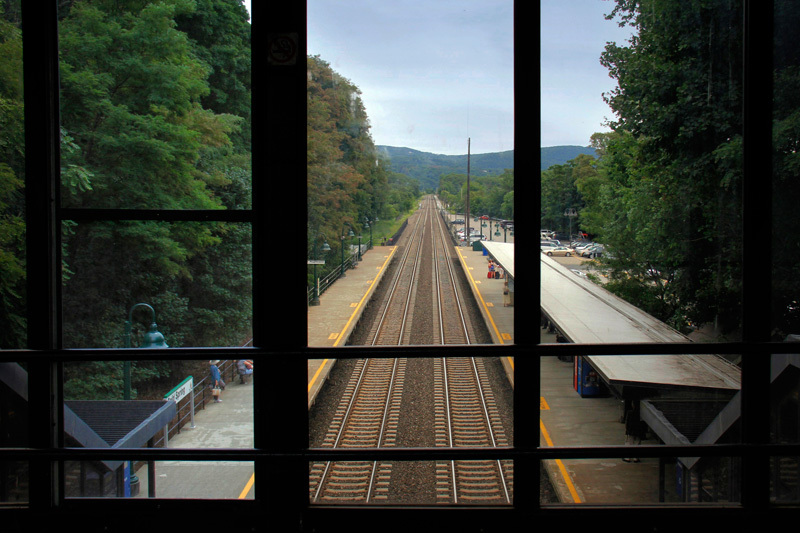 If you happen to make the journey all the way up to Cold Spring, the Metro-North station probably is the least interesting thing you’ll see along the way. 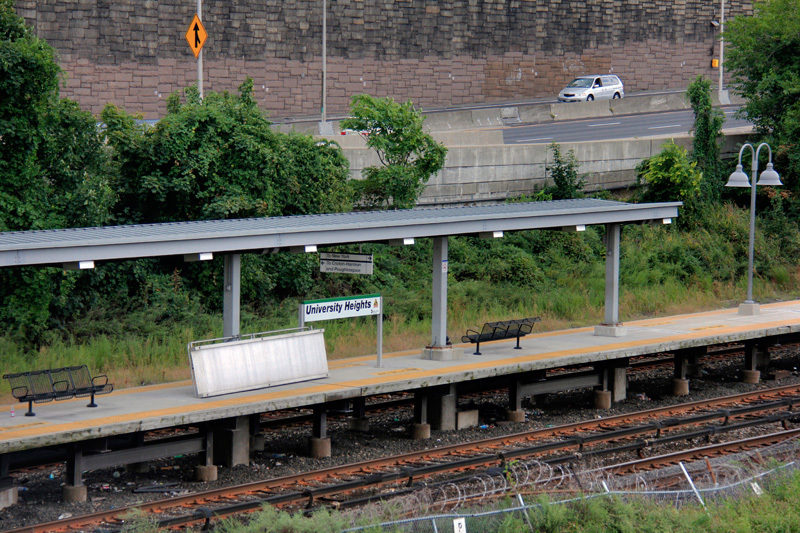 Typical of many Hudson Line stations, Cold Spring is composed of two side platforms, connected by an overpass. 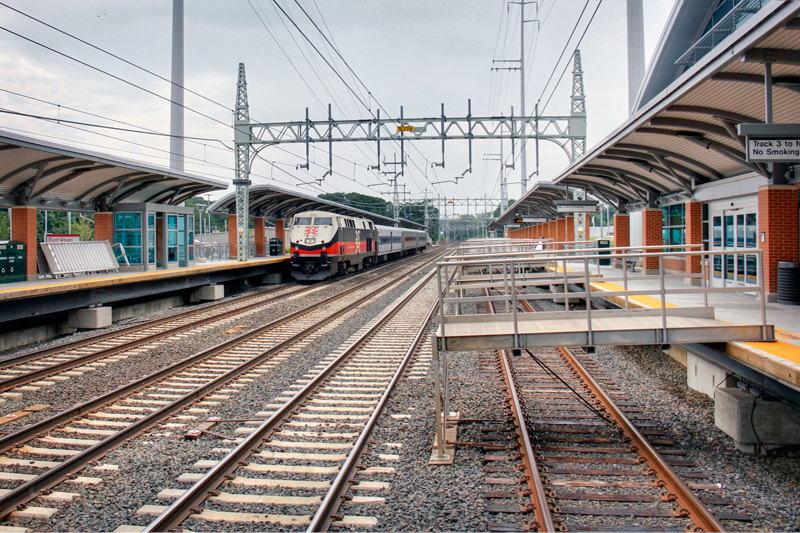 As previously mentioned, each platform is connected via a pathway to the old station and village area. 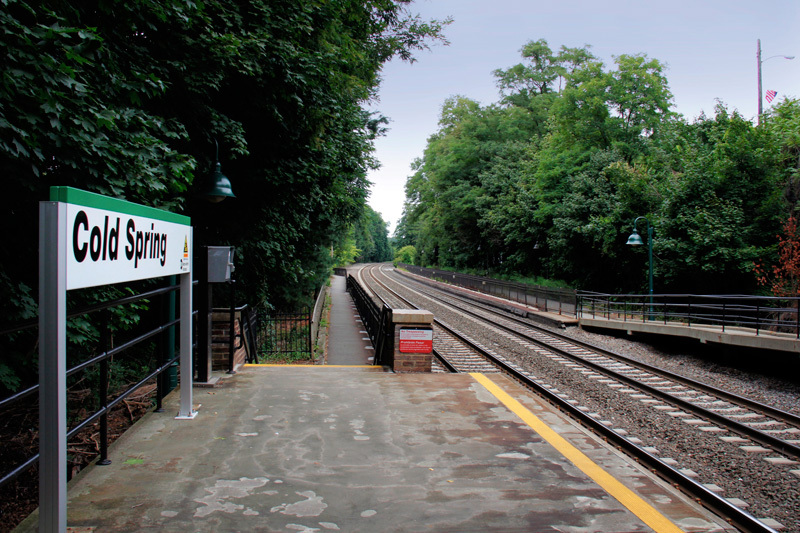 Besides the usual ticket vending machines, blue trash bins, and wire benches found at most Metro-North stations, there isn’t much else noteworthy here at Cold Spring. 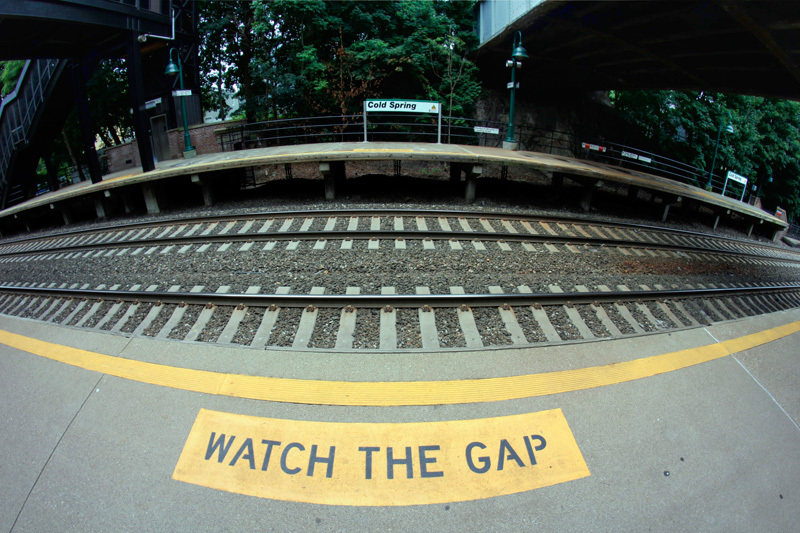 It is, however, the gateway to a pretty interesting place, certainly worth visiting, and under an hour and a half from Manhattan. 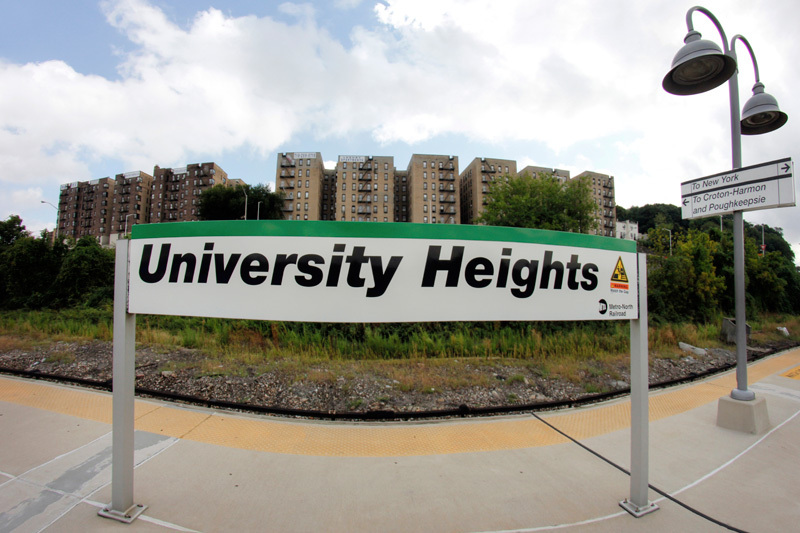 Today’s Hudson Line tour takes us back to the Bronx for a quick visit to University Heights station. 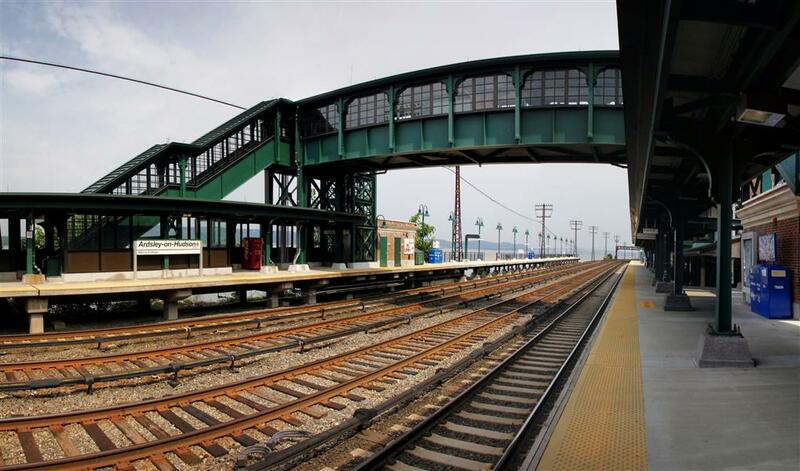 Located just less than 9 miles from Grand Central, the station is situated between Morris Heights and Marble Hill stations. 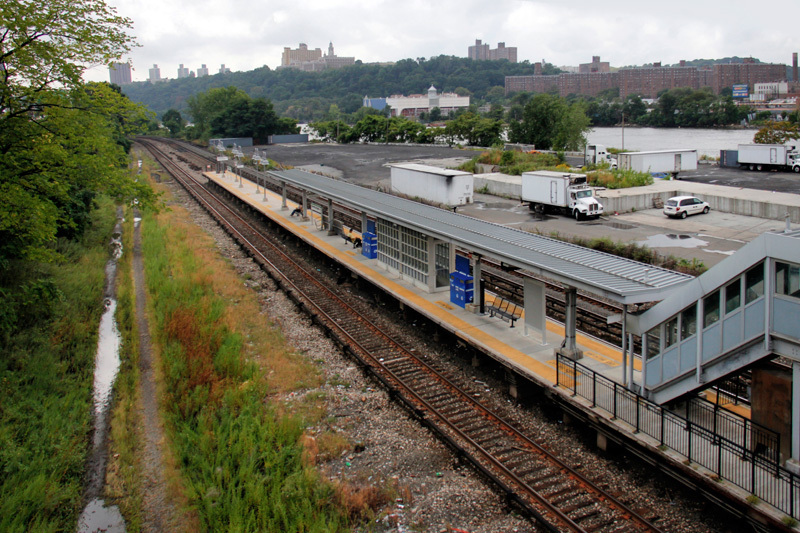 The station is named after the section of the Bronx in which it is located – a name that dates back to 1894 when New York University built its Bronx campus here. 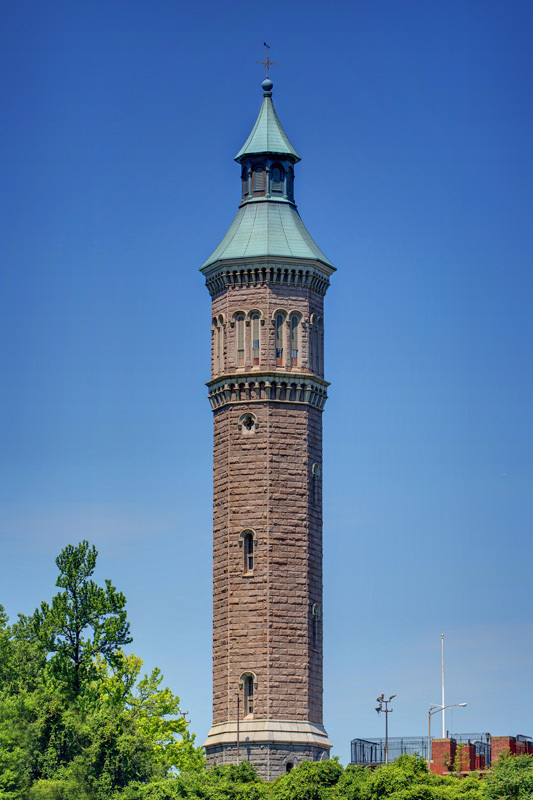 Though the university is now called the Bronx Community College, after having been sold in 1973, the name University Heights stuck. 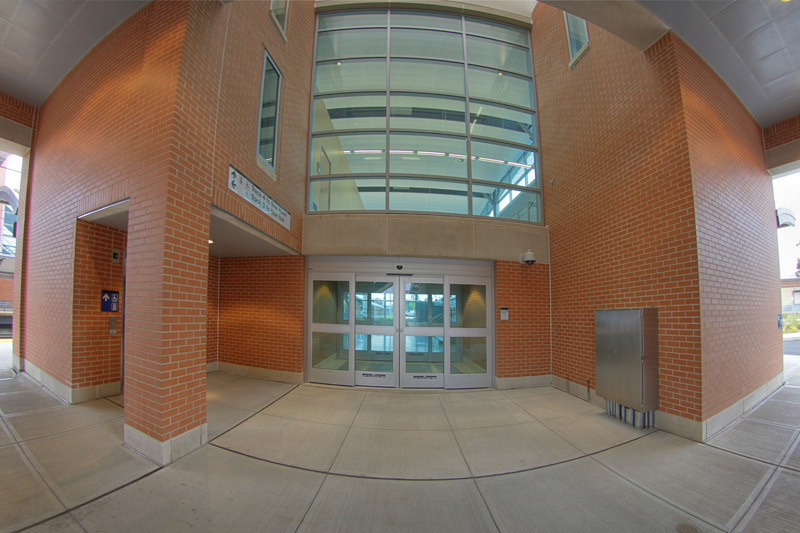 The attractive campus is just a short walk away from the station. 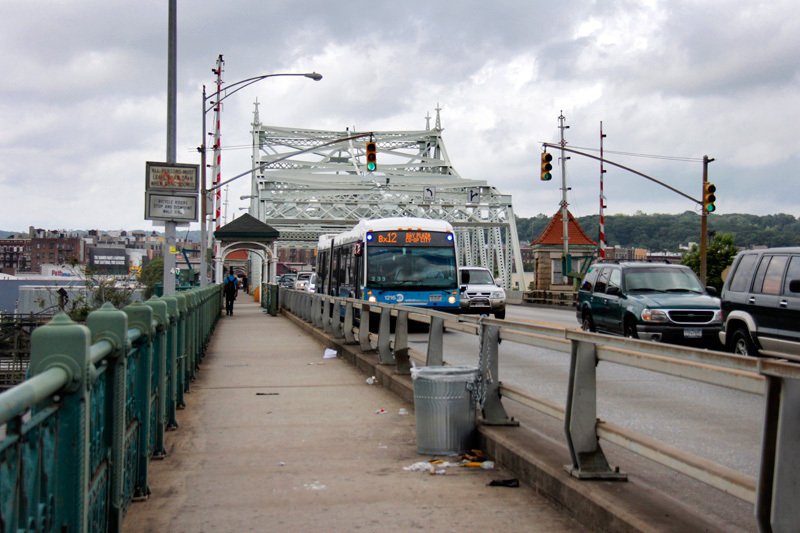 Local timetables for the West Bronx, which includes University Heights. 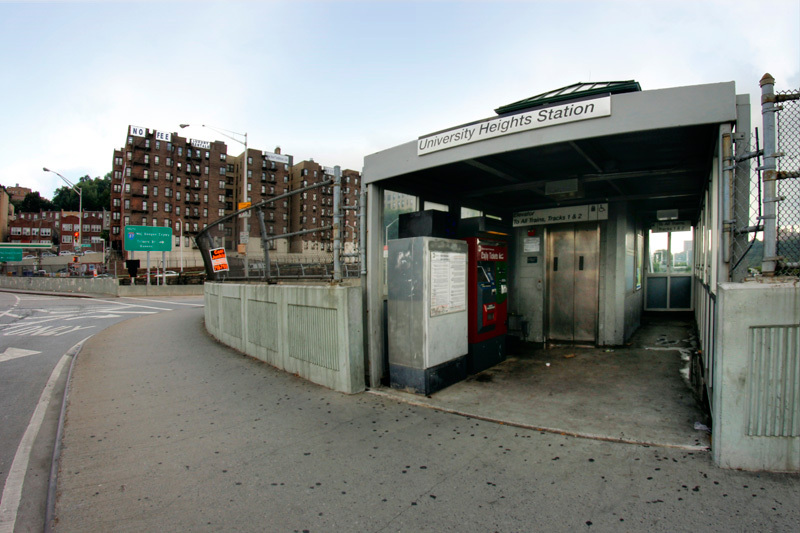 The station at University Heights consists of a small island platform, accessible via a stairwell or an elevator on West Fordham Road. 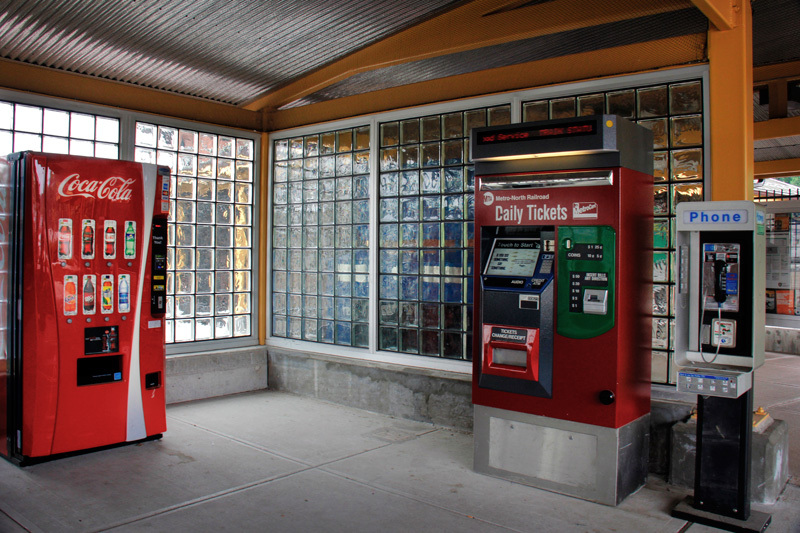 A ticket vending machine is located here at street level. 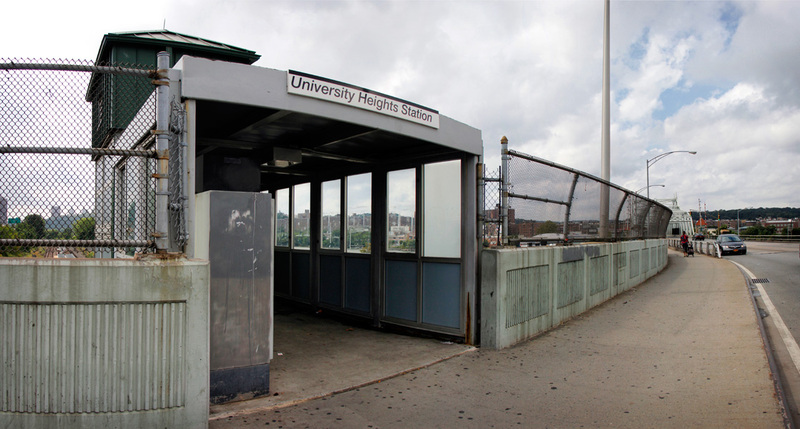 Similar to Morris Heights, University Heights is sandwiched between the Harlem River and the Major Deegan Expressway. 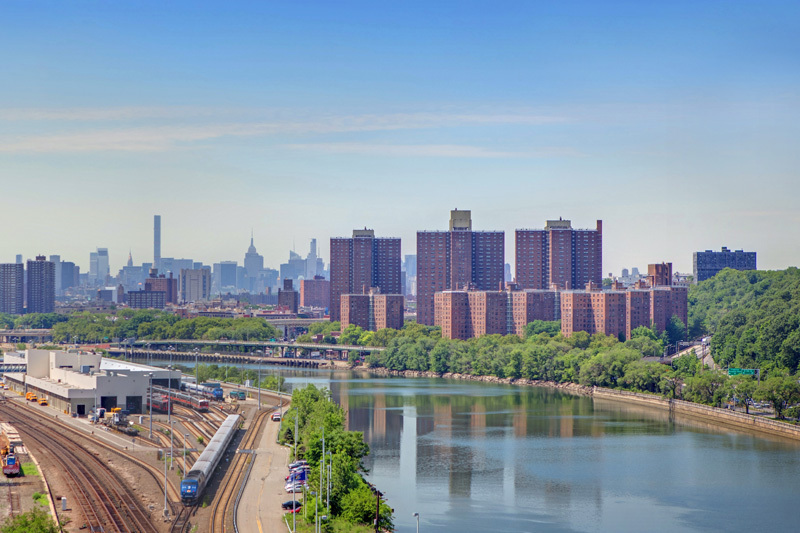 Unfortunately, the river view is not quite as great as the one near Morris Heights. 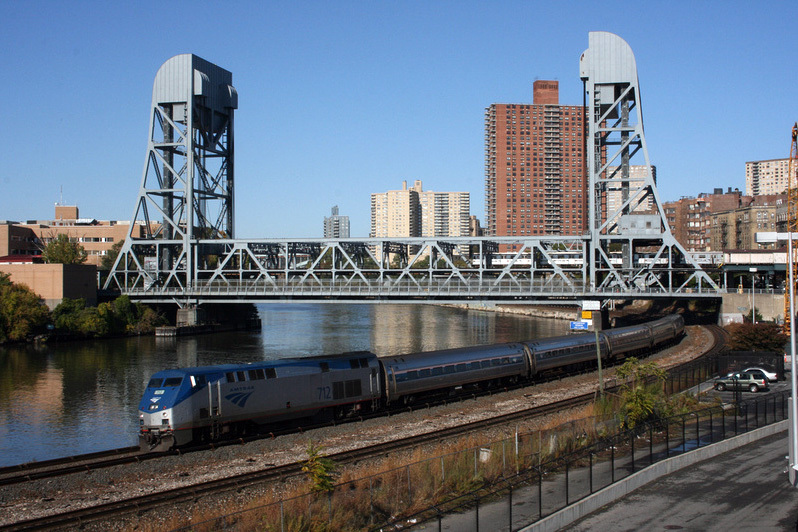 From the platform you can see the University Heights bridge, which crosses over the Harlem River, and the waterfront space is taken up by a few industrial looking facilities. 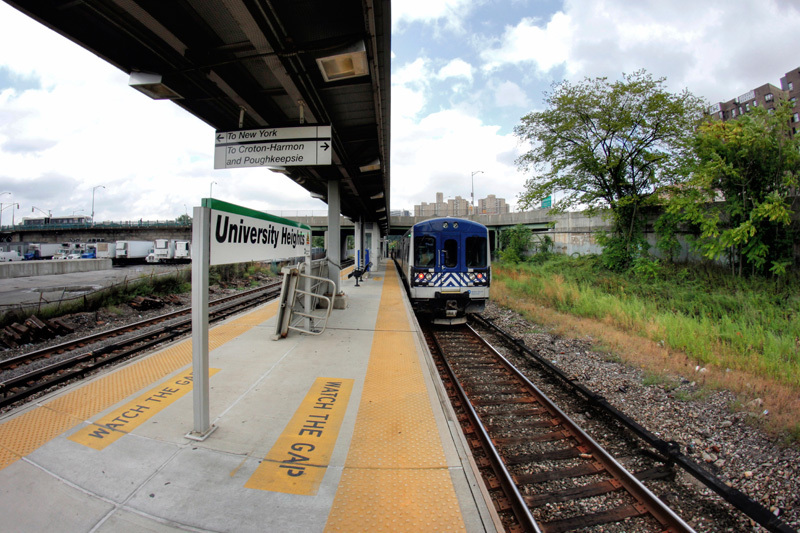 Though hardly one of the most interesting stations on the Hudson Line, it is at least worth mentioning that at one point in time University Heights was a joint station shared with the Putnam Division, at least until that line was shut down in 1958. 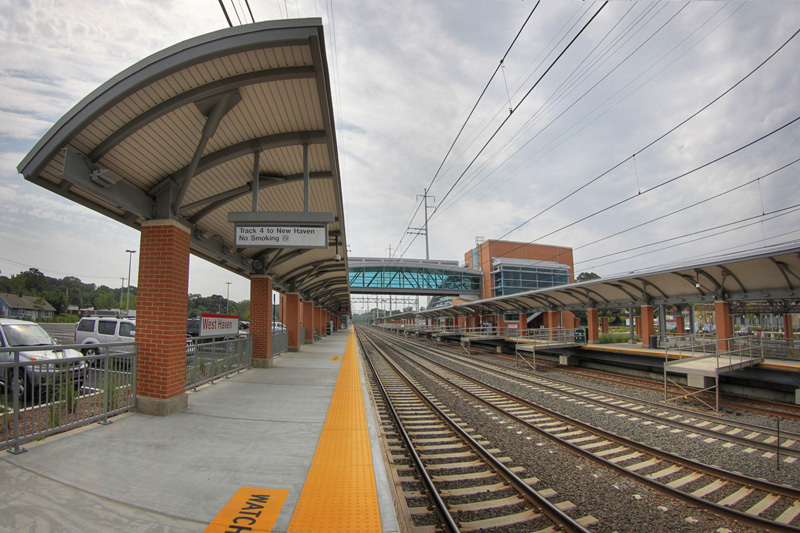 Crugers and Montrose stations. 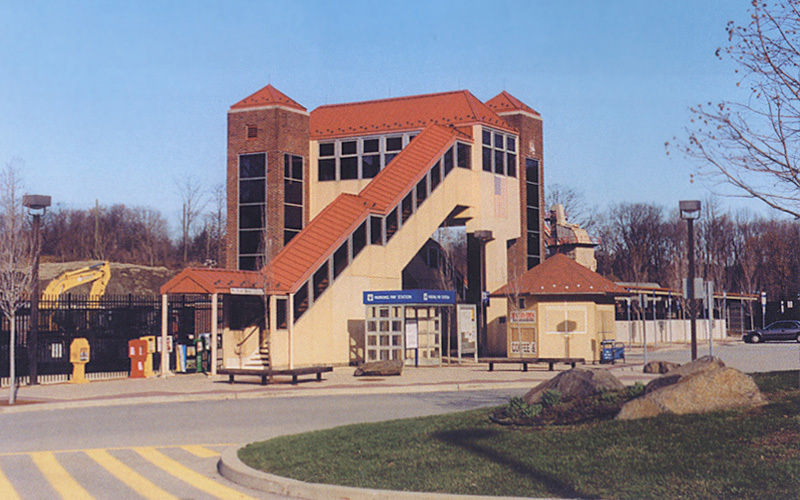 Both stations were closed in 1996 and replaced with the new Cortlandt station. 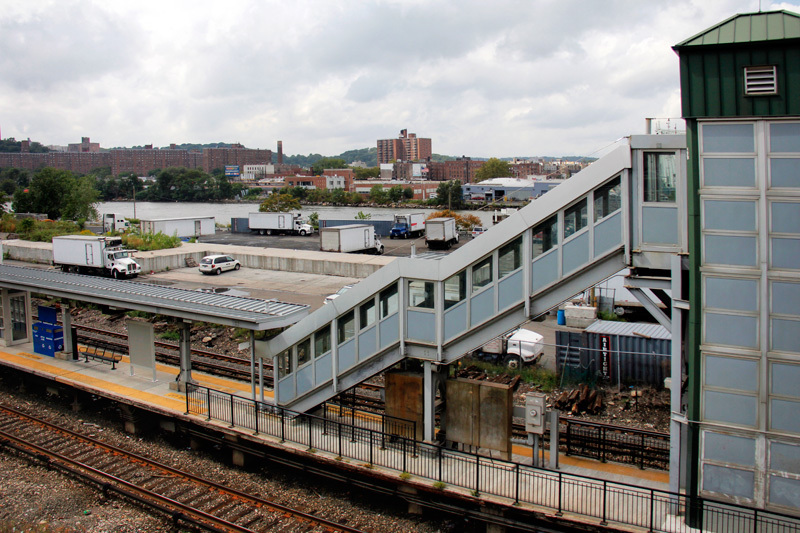 Today’s tour of the Hudson Line takes us to one of Metro-North’s newer stations – the second newest on the line after Yankees-E 153rd Street, Cortlandt. 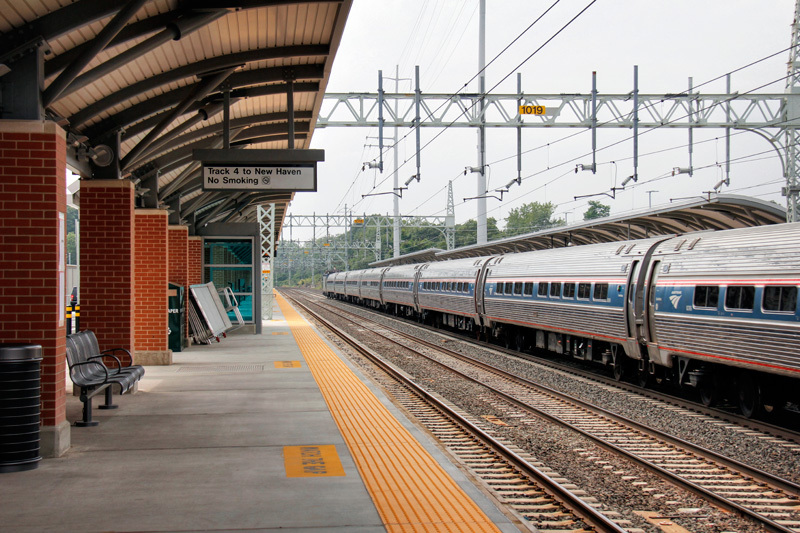 Located a little over 38 miles from Grand Central, Cortlandt is in the upper, unelectrified portion of Metro-North’s Hudson Line, and situated between Croton-Harmon and Peekskill. 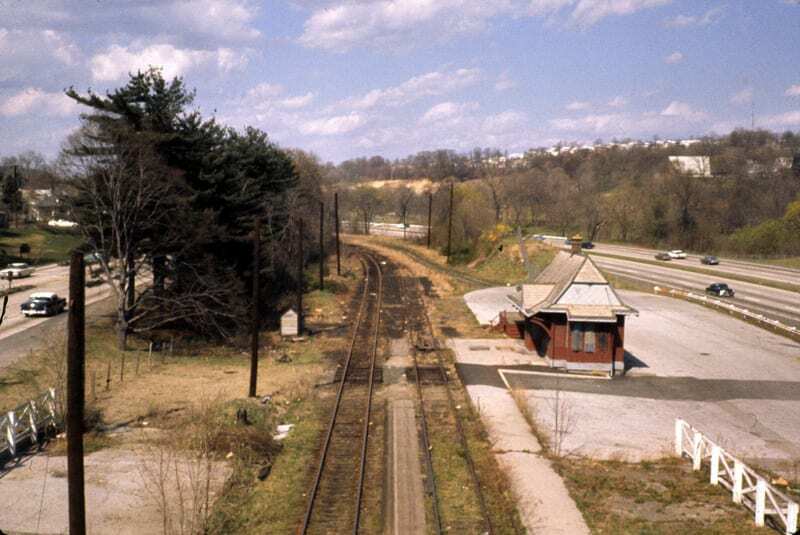 Historically, there were two stations in this area – Crugers and Montrose – both of which were closed in favor of the new Cortlandt station. 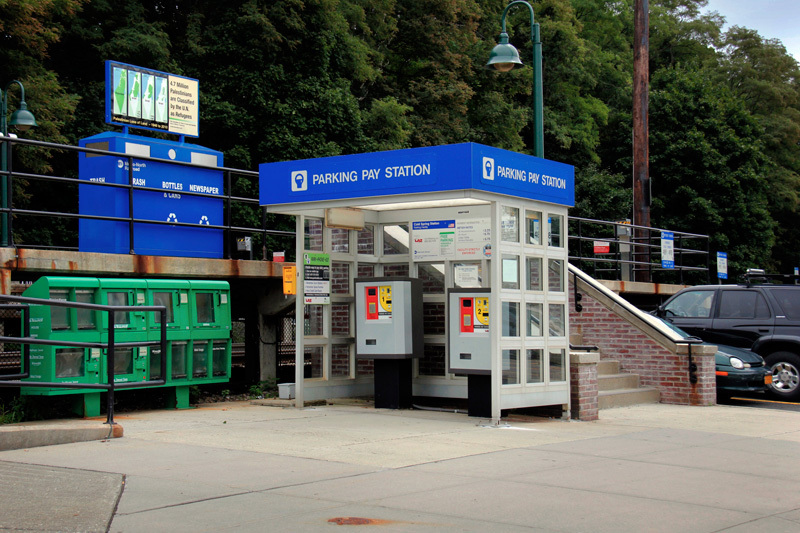 Space is always a critical issue at many Metro-North stations, especially when it comes to parking. 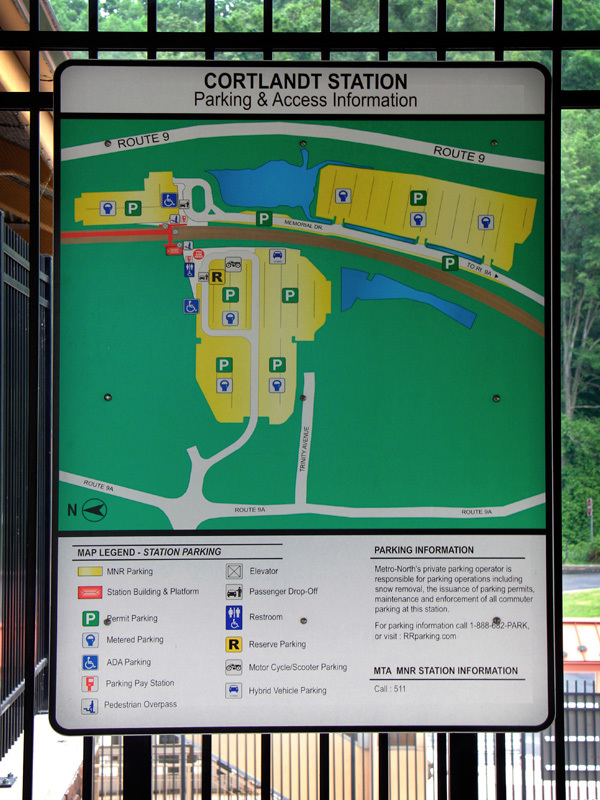 Many stations have almost endless waiting lists for a parking permit. 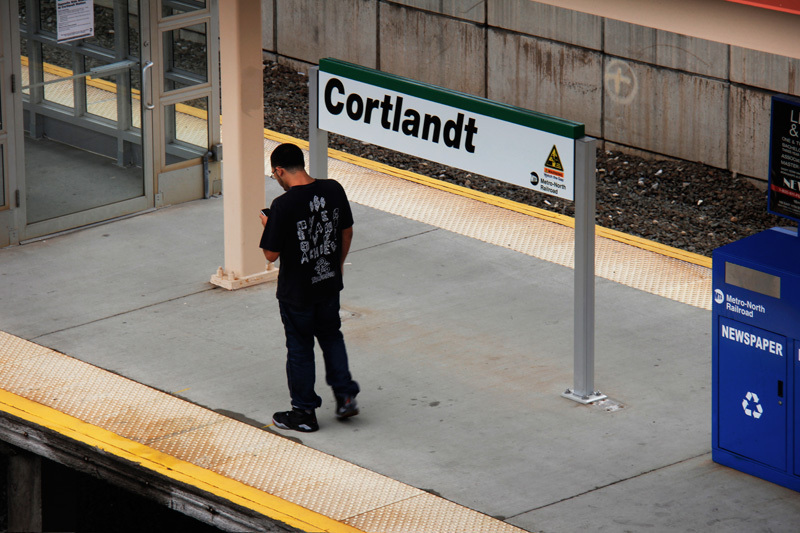 Cortlandt was one of the few places on the upper Hudson Line where there was room for expansion, and more room for parking. 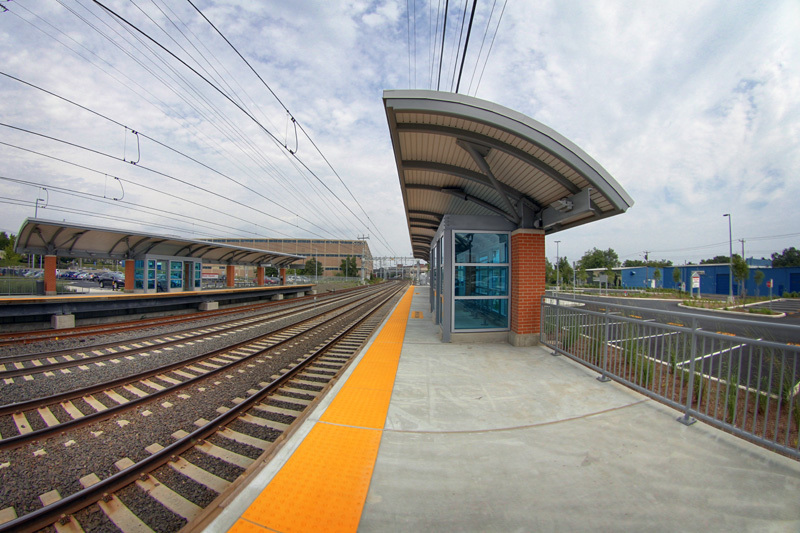 Especially built to replace Montrose and Crugers, the new station was opened in June of 1996. 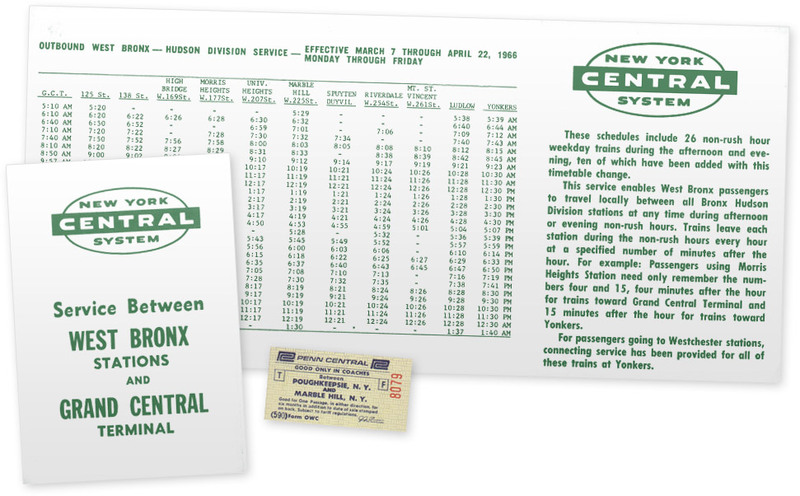 Local timetables to Montrose and Crugers, and Hudson Line timetables from 1996. 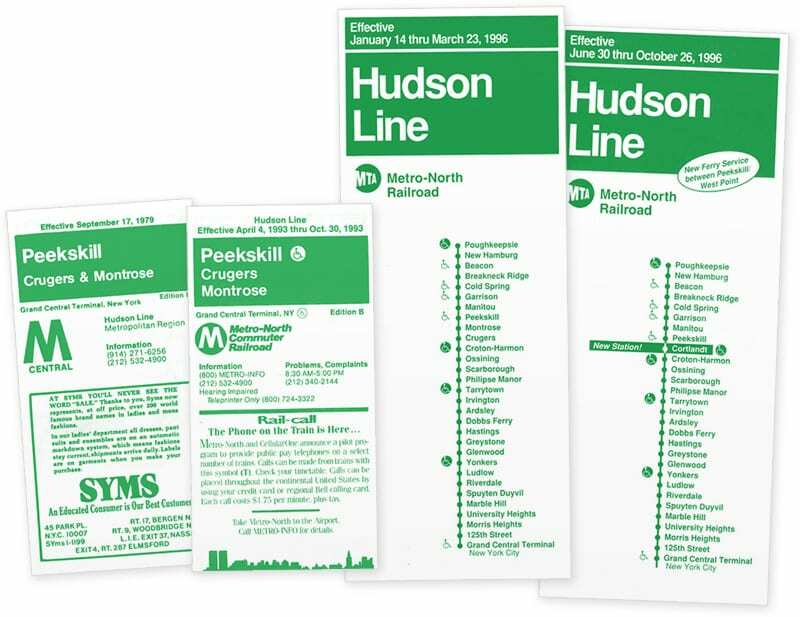 Note that Montrose and Crugers were there at the beginning of the year, but by midyear were replaced with Cortlandt. 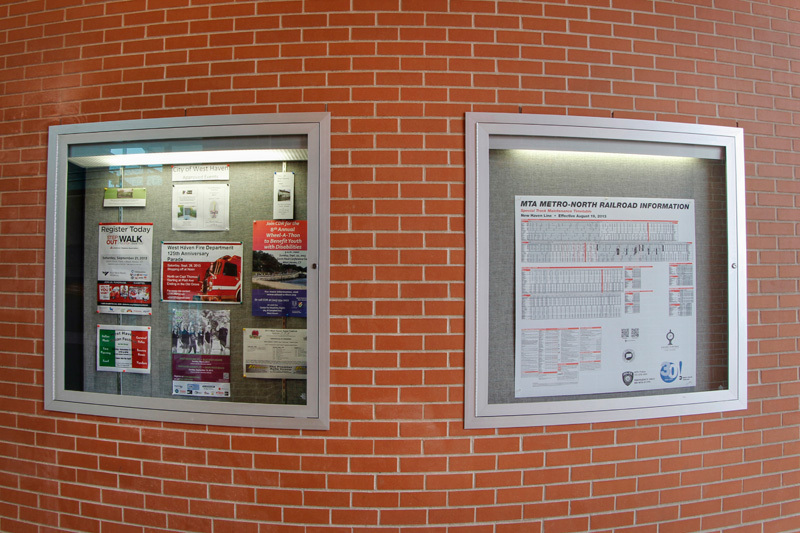 Thanks to Doug Dray, Otto Vondrak, and Bob Mortell for these timetables. 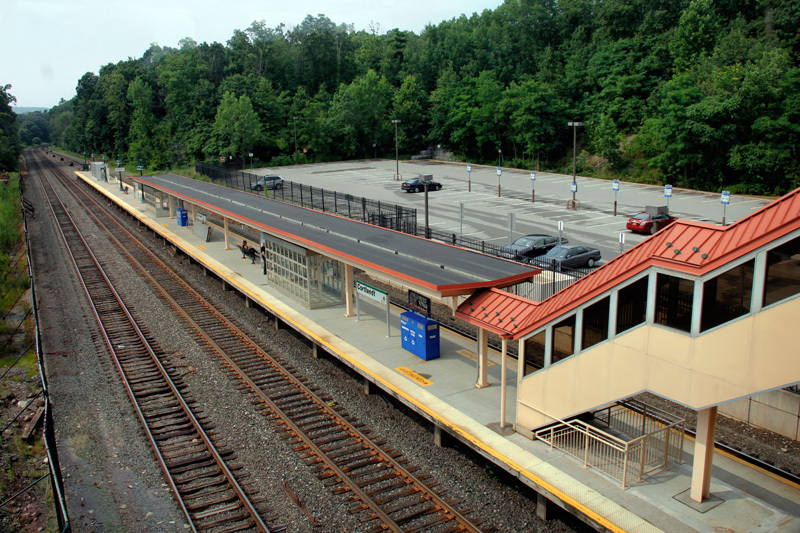 Although the parking situation was much improved at Cortlandt, Metro-North looked to expand even more, and in 2009 began a massive improvement project to the station. 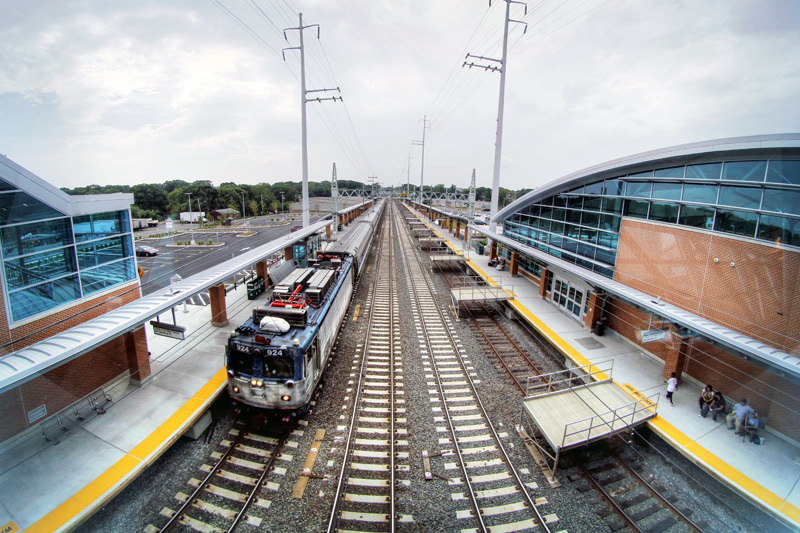 A new 720 car parking lot was built on the west side of the tracks, almost doubling parking capacity. 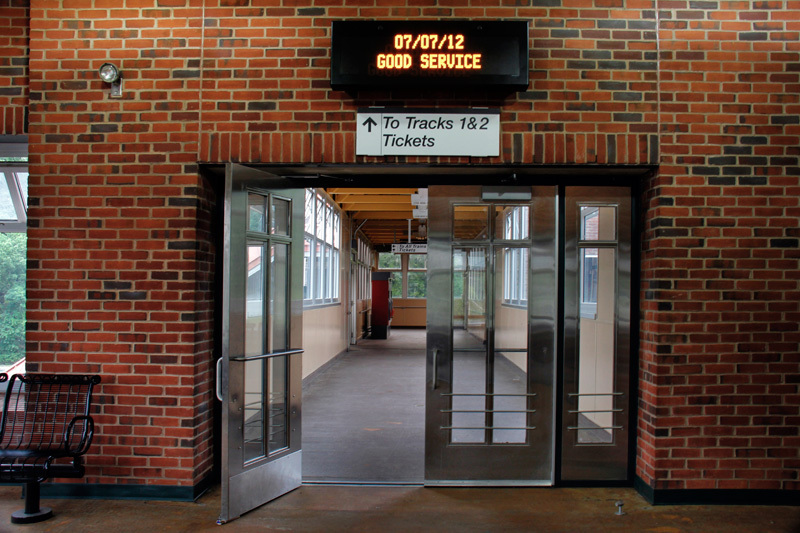 Other improvements included a heated waiting room including a concession area, new canopies, and a new elevator. 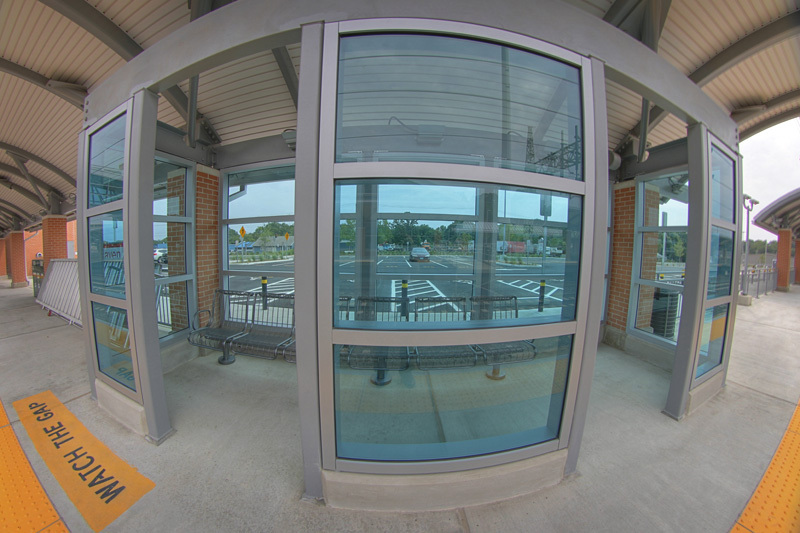 The New York State Department of Transportation improved the intersection between the station and Route 9A, which was also considered part of the project. 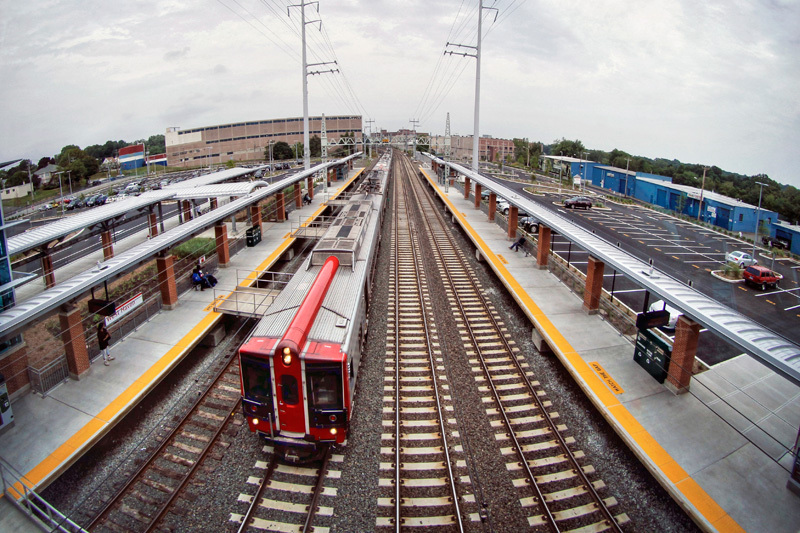 The new road had lighted sidewalks built especially for those using the train to get to the nearby Veterans Hospital. 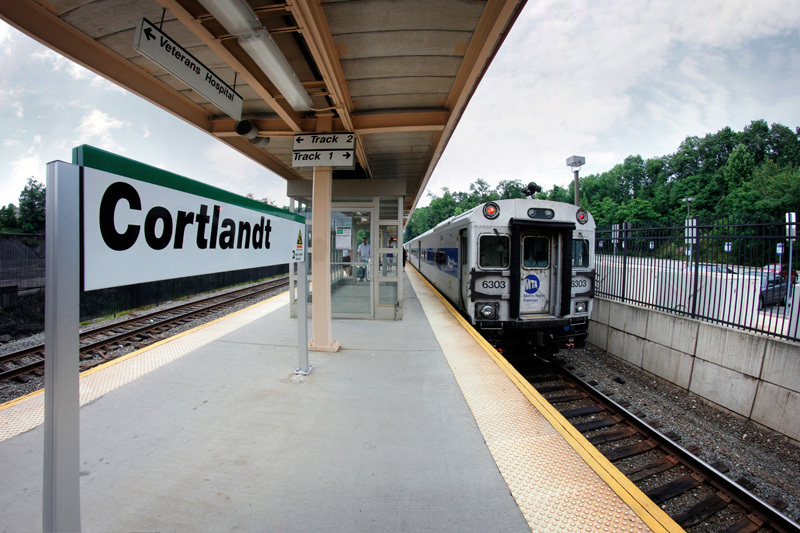 Cortlandt before and during construction. 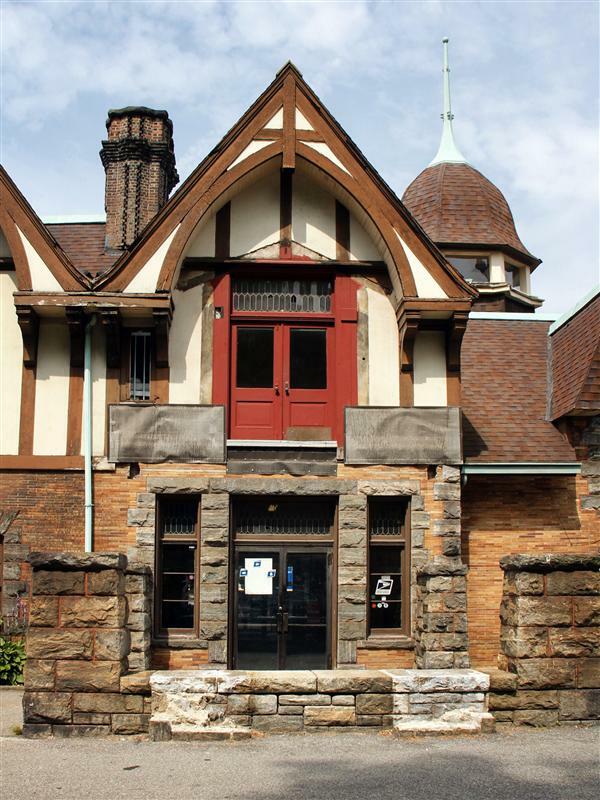 Before photo by Tom Panettiere, construction photo by George Kimmerling. 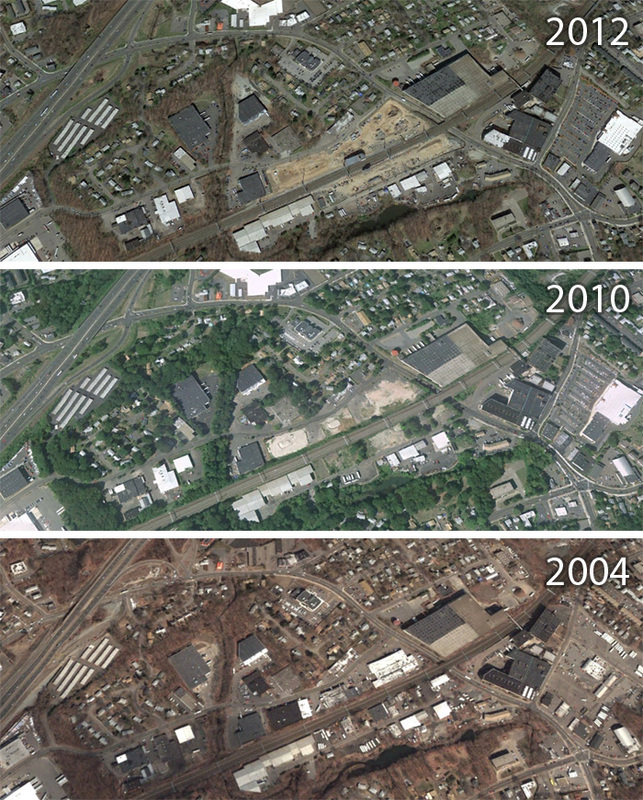 Aerial views of Cortlandt station, before and after the expansion. 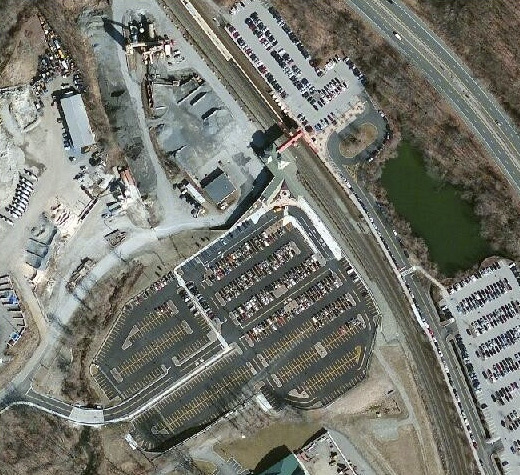 Note the new, larger station building, and the massive new parking lot on the west side of the tracks. 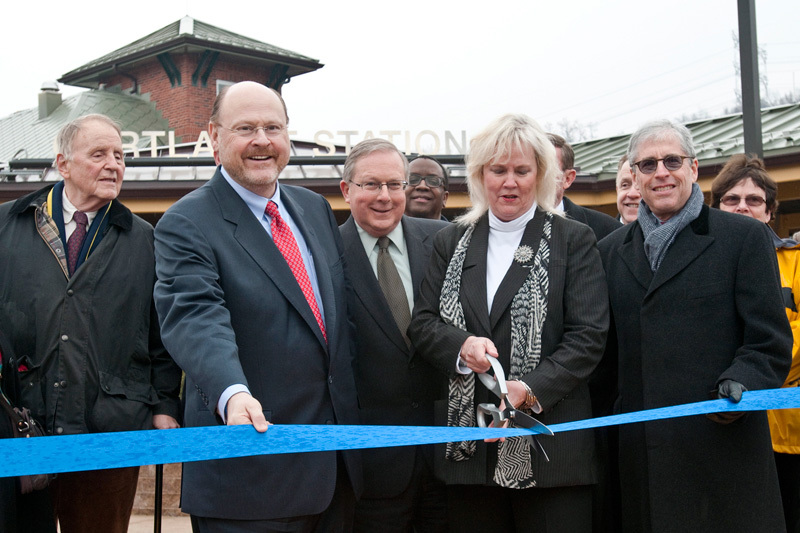 The MTA had a formal ribbon-cutting ceremony after the renovations to Cortlandt station were complete back in February, attended by both Metro-North president Howard Permut and MTA Chairman Joe Lhota. 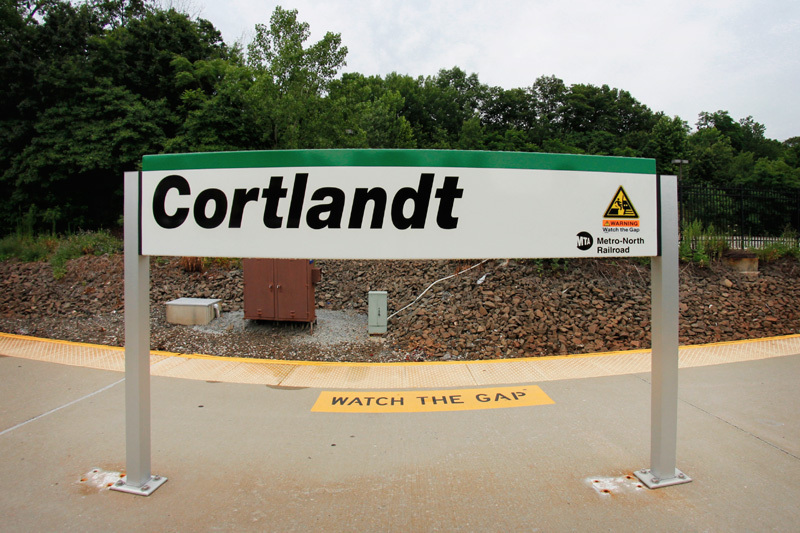 In his statements at the ceremony, Permut said “[Cortlandt] will address current and future needs of the railroad and the communities it serves,” which is actually quite true – especially the future part. 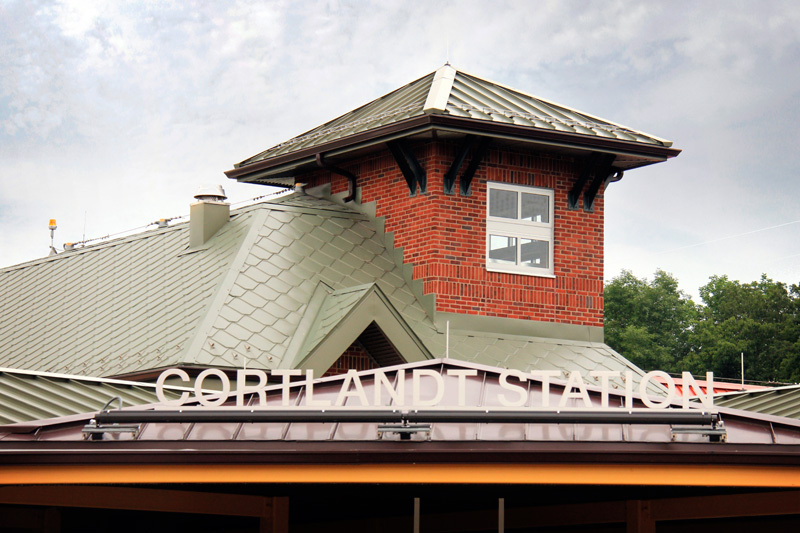 Though most don’t attribute foresight as a quality generously abound in the MTA, whoever came up with the upgrades for Cortlandt was certainly thinking about future expansion. 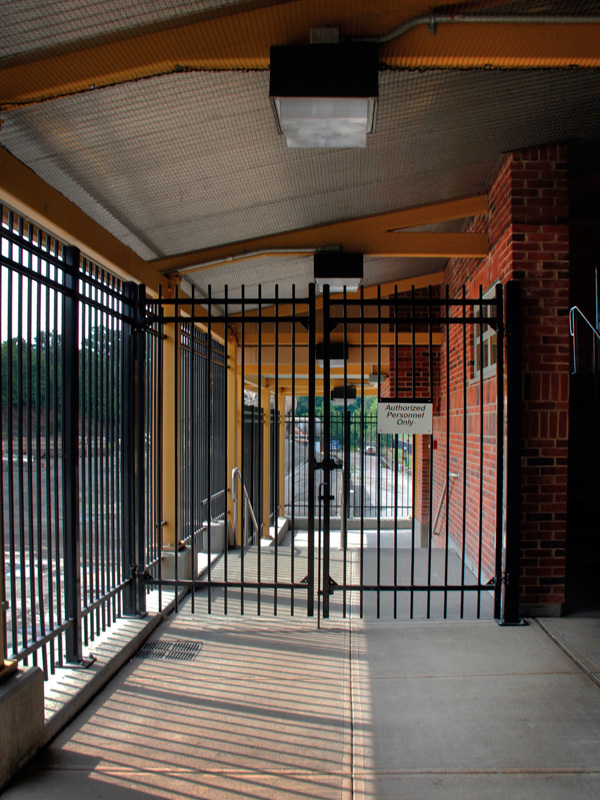 A blocked off stairwell to nowhere, gated off with a sign that says “Authorized Personnel Only” looks like a perfect spot for a third platform to be constructed – at some point in the future if ever needed (if electrification further north ever happens?). 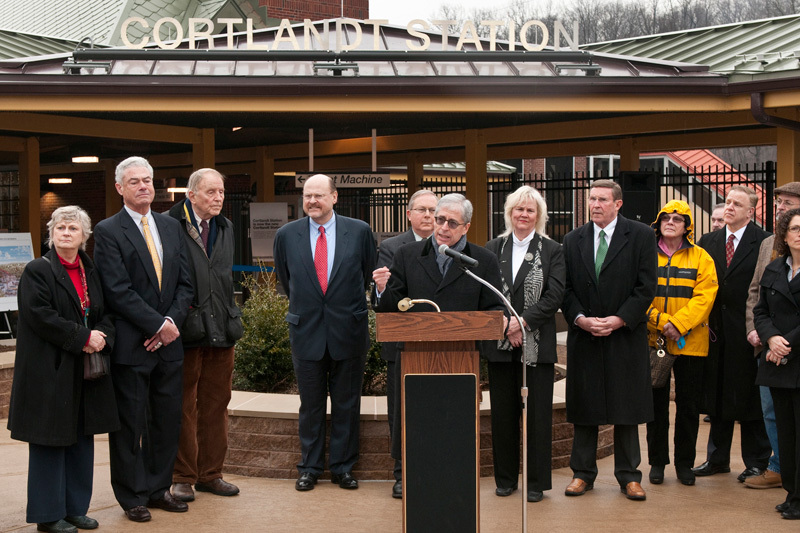 Ribbon cutting ceremony at Cortlandt station. 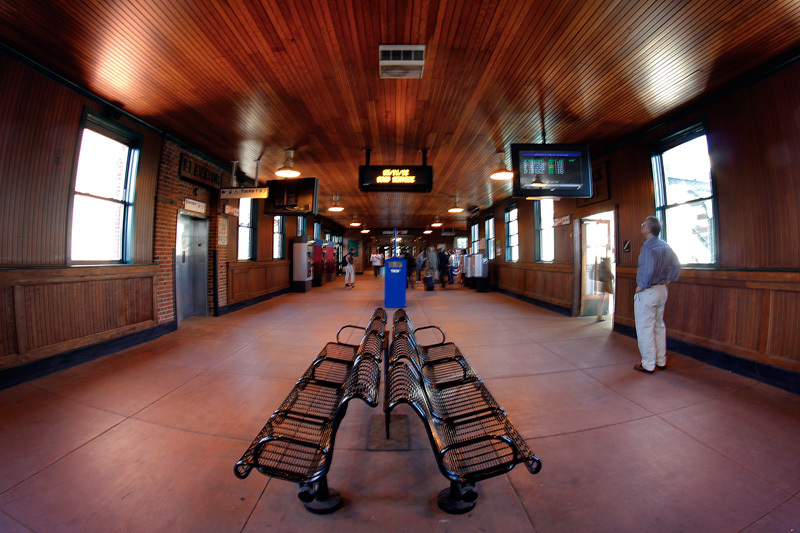 Included in the original construction of the station was an Arts for Transit piece titled Three Statues (A Short History of the Lower Hudson Valley), by Robert Taplin. 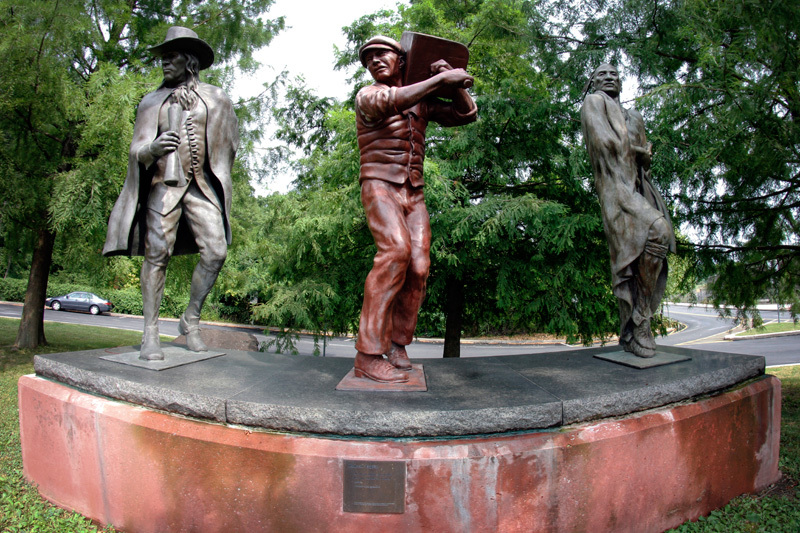 Three seven-foot tall statues stand beside the station, each representative of a historical group of people that were common in this area. 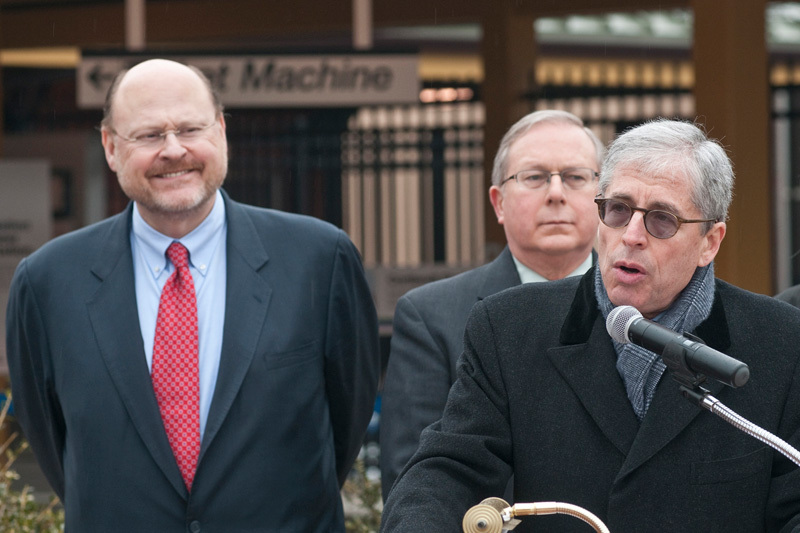 On the left, a wealthy Dutch landowner. 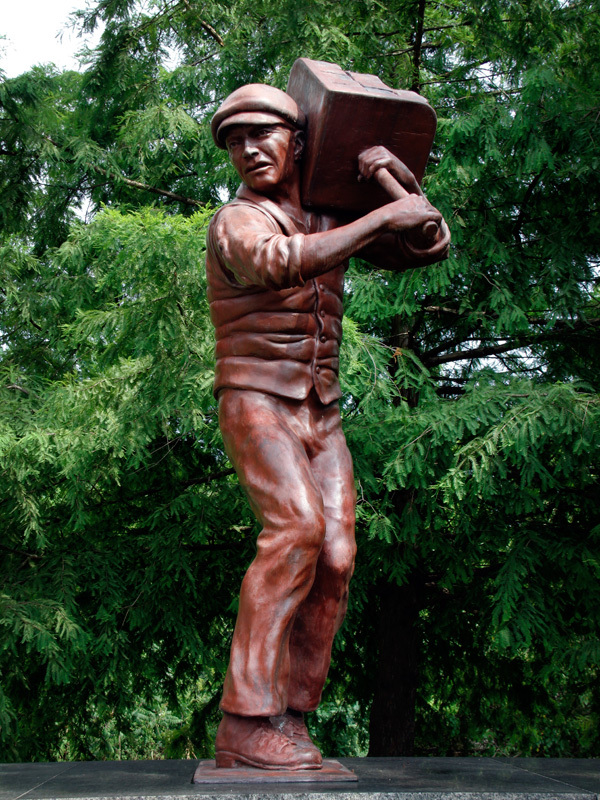 In the middle, a laborer from the early nineteenth century. 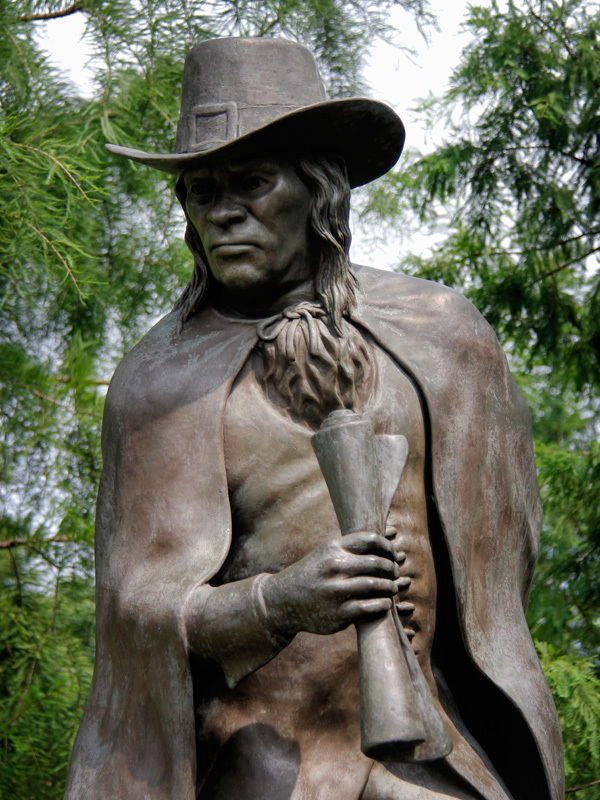 And on the right, a Native American figure. 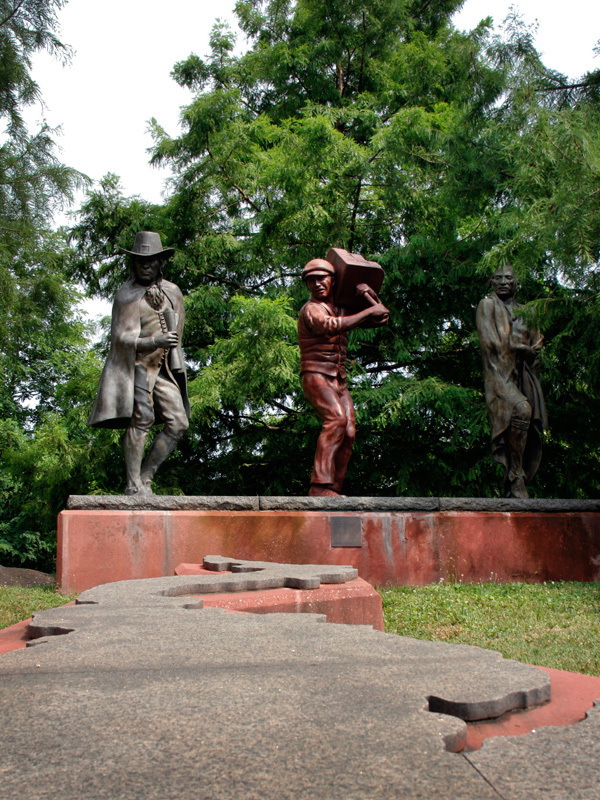 The figures look out over the long shape of the Hudson River, rendered in stone. 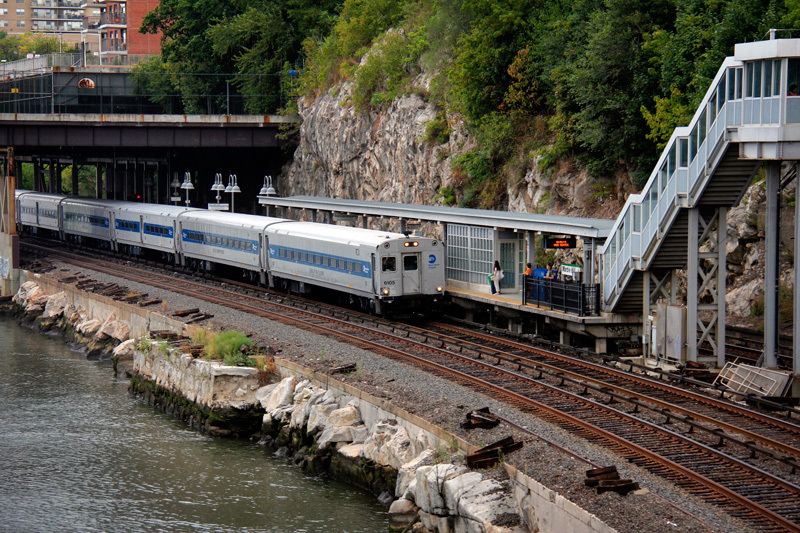 That’s about it for today’s tour – next week we’ll head back south on the Hudson Line to another station in the Bronx. 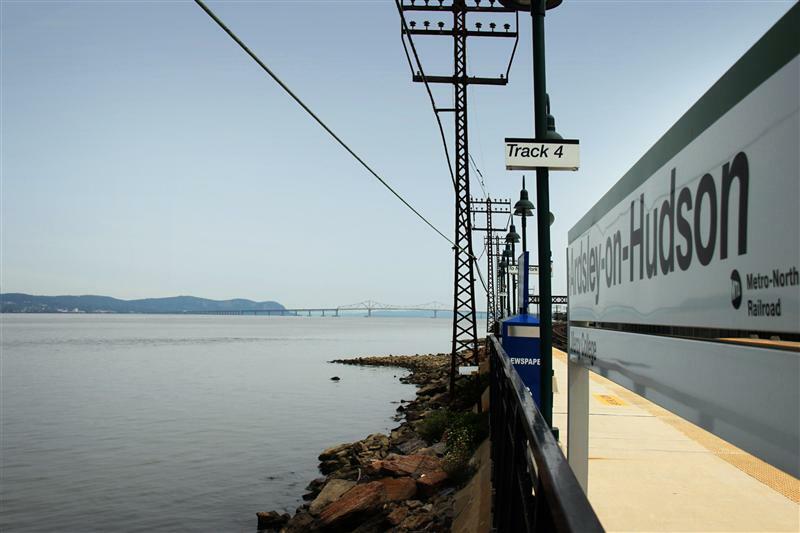 There are only four more stations left to be featured on the Hudson Line, after which my camera may go hibernate for the winter (except for the part where I go ride Alaska Railroad’s winter train)! 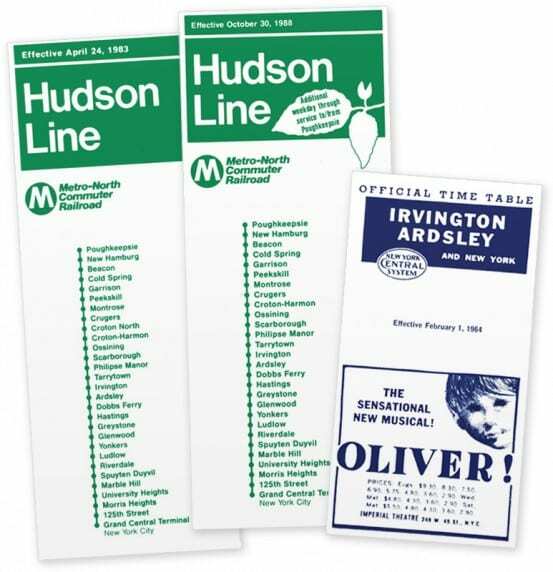 Two early Metro-North Hudson Line timetables, and a local New York Central timetable listing the station as Ardsley – just to confuse you. 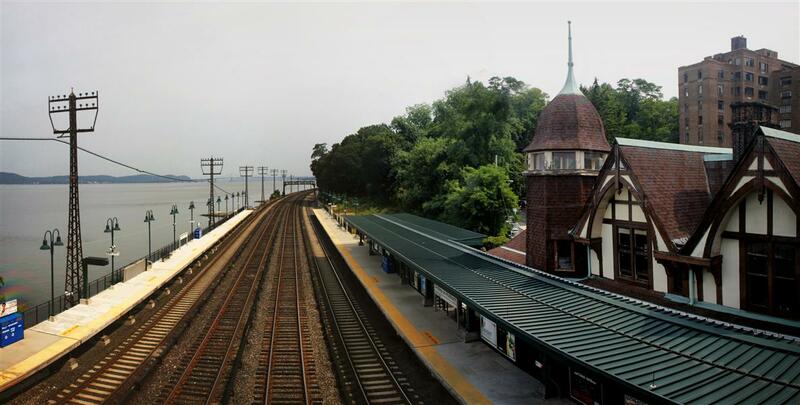 Today’s tour of the Hudson Line takes us just about 22 miles north of Grand Central to Ardsley-on-Hudson station, a place of a bit of confusion. 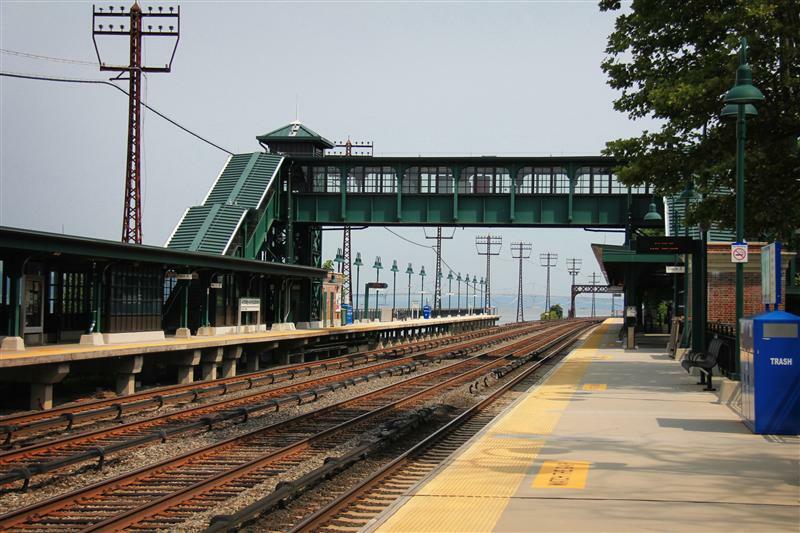 Ardsley-on-Hudson, located in Irvington, should not be confused with actual village of Ardsley, which is located a few miles east and had its own station on the long-gone Putnam Division. As you can see above, many Ardsley-on-Hudson timetables were printed with just “Ardsley” which doesn’t really help much with the confusion. 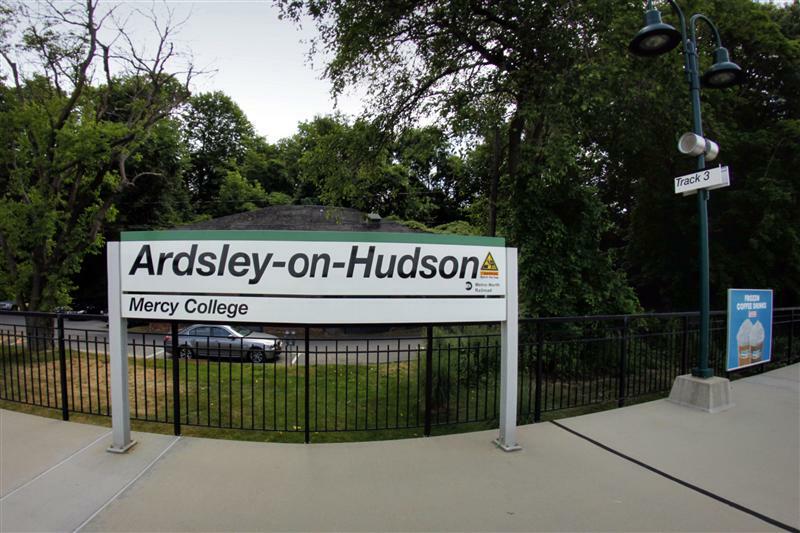 Thankfully, Metro-North has been fairly consistent with printing the full “Ardsley-on-Hudson” on station signs and in timetables for the past few years. Above: 1896 drawing of the Ardsley Casino clubhouse. 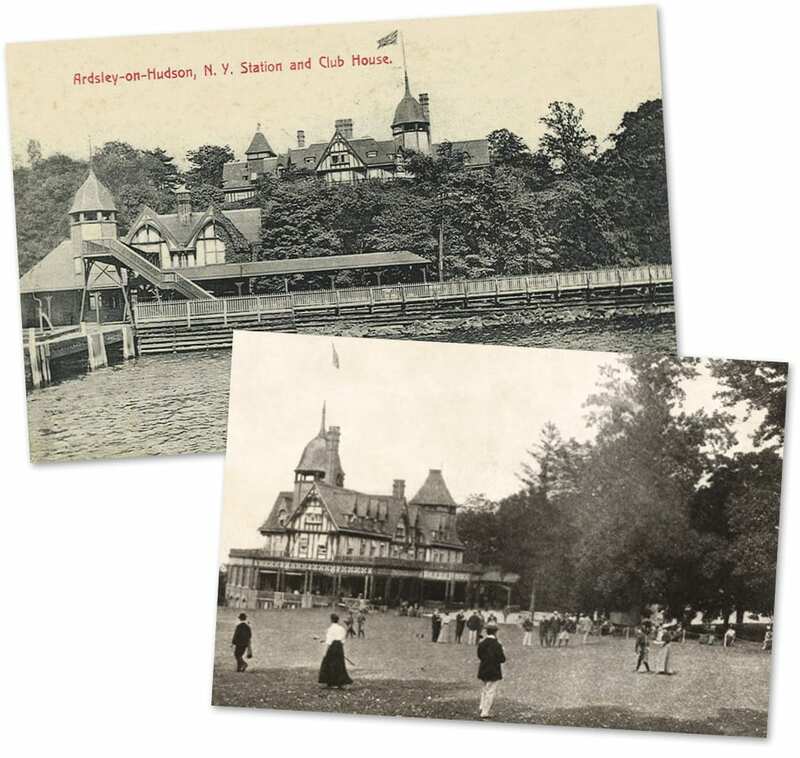 Below: 1899 photo of the clubhouse grounds, and a postcard showing the yacht landing, train station, and clubhouse. 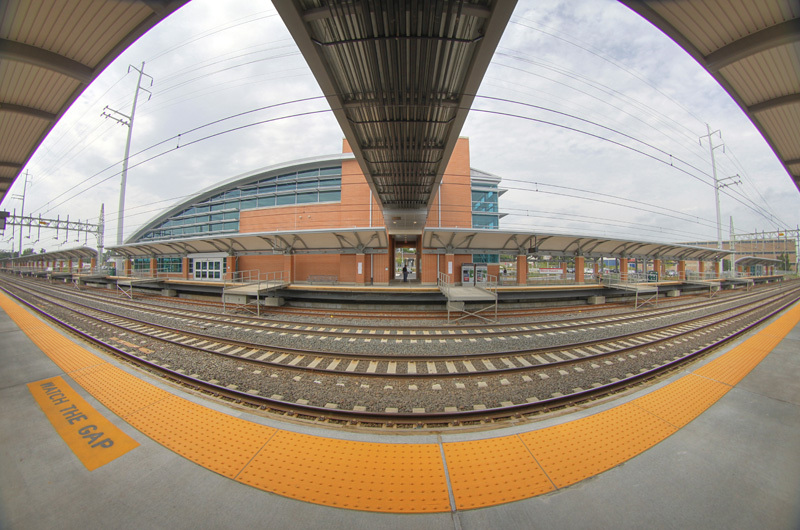 The aesthetic of the train station matches the buildings for the Casino. 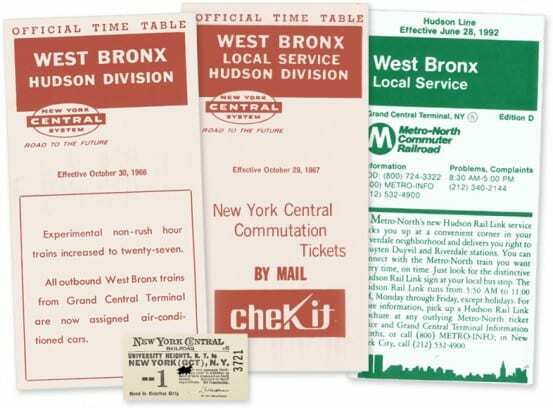 Postcard from the collection of Steve Swirsky. 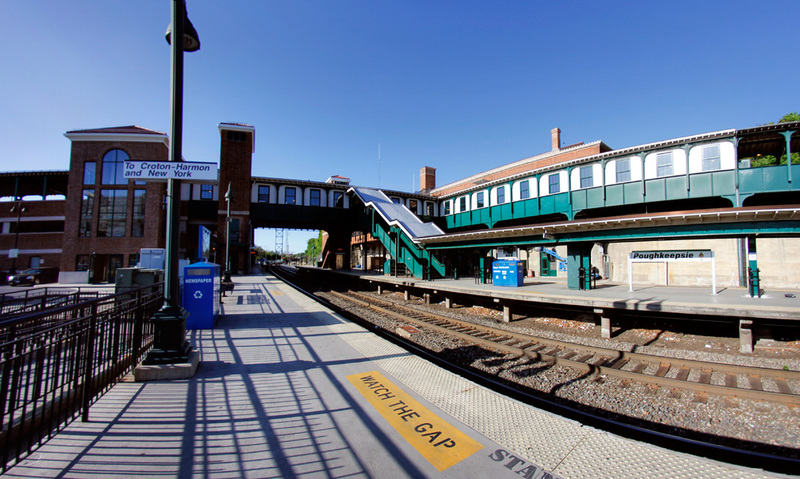 In regards to the train station, the name Ardsley derives from the Ardsley Casino, which opened at this location in 1896. 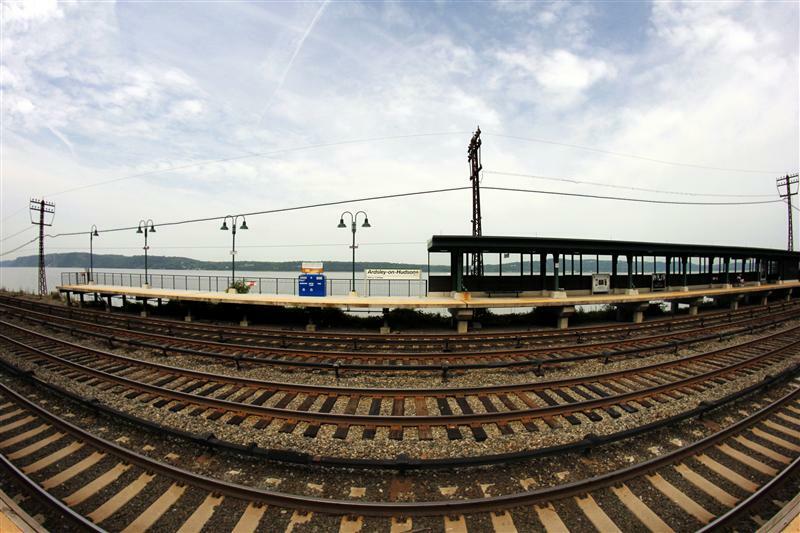 The “on-Hudson” portion was tacked on because of its geographic location on the river, and to differentiate it from the village of Ardsley. 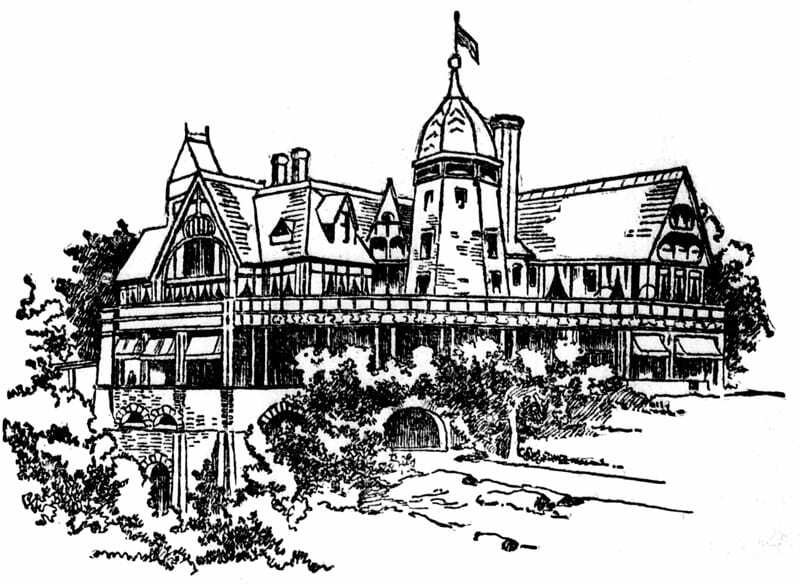 To confuse you more, the Casino wasn’t a casino, but more of a club for the rich to play golf. 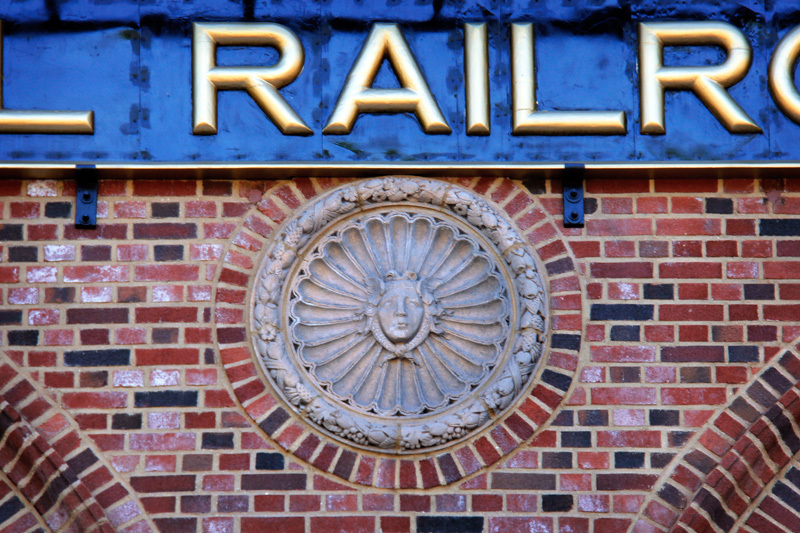 While the Casino built a dock for their rich members to sail up to in their yachts, not all of the membership was quite as fortunate to own one – thus a train station was constructed. 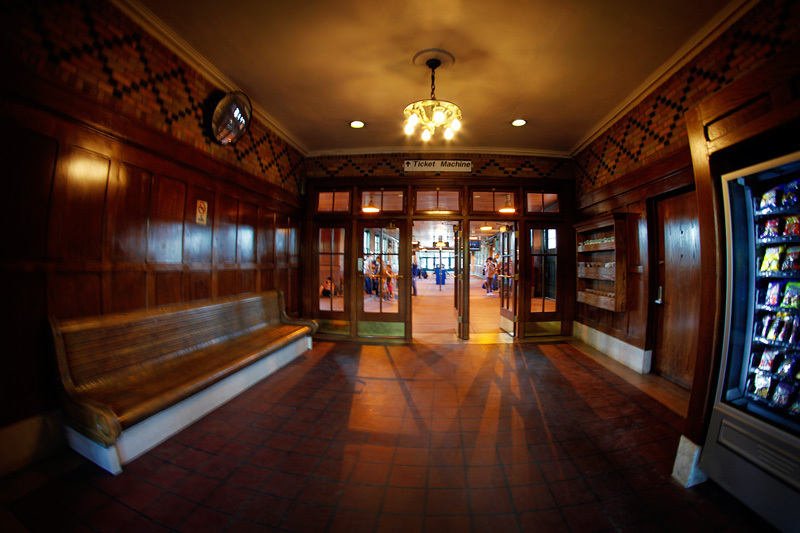 The train station building mirrored the Tudor revival architecture style of the Casino’s nearby clubhouse. 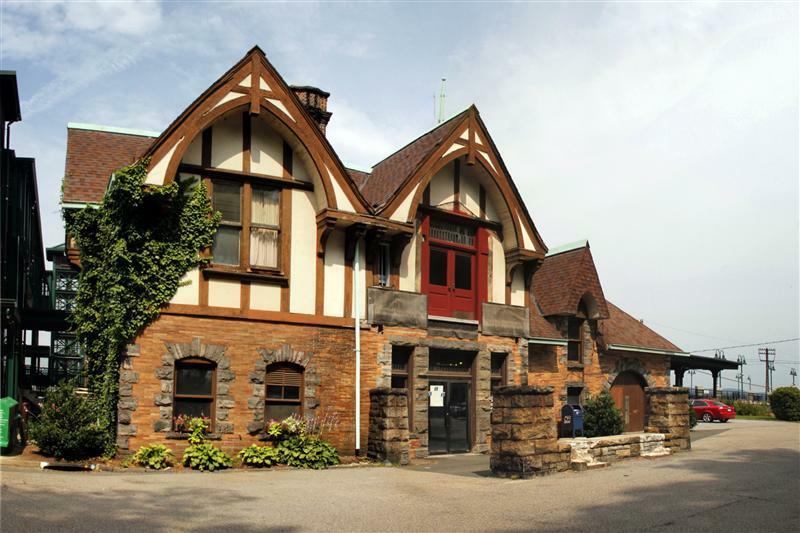 The two buildings stood in close proximity until 1936 when the clubhouse was torn down. As the only surviving remnant of the club that once stood here, the station building does look a little bit out of place aesthetically, and has a unique look compared to other Hudson Line stations. 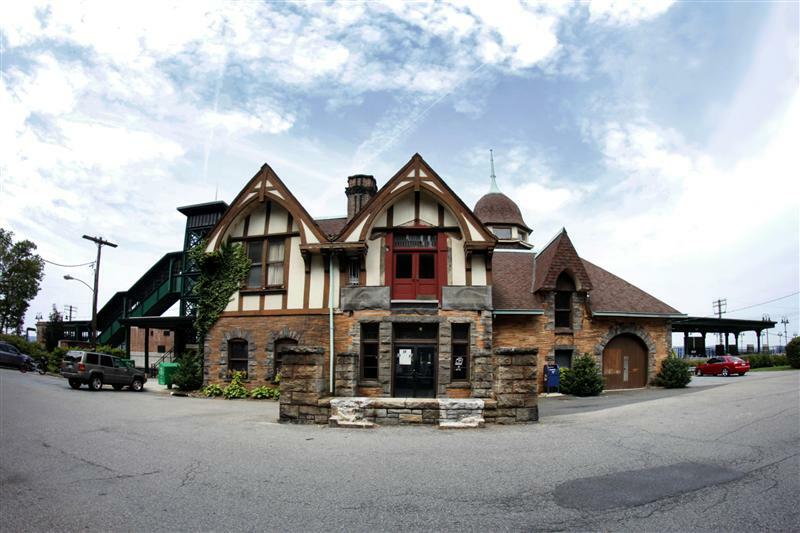 Though the Ardsley Casino no longer exists, the more informal Ardsley Country Club, can be named as its sucessor. 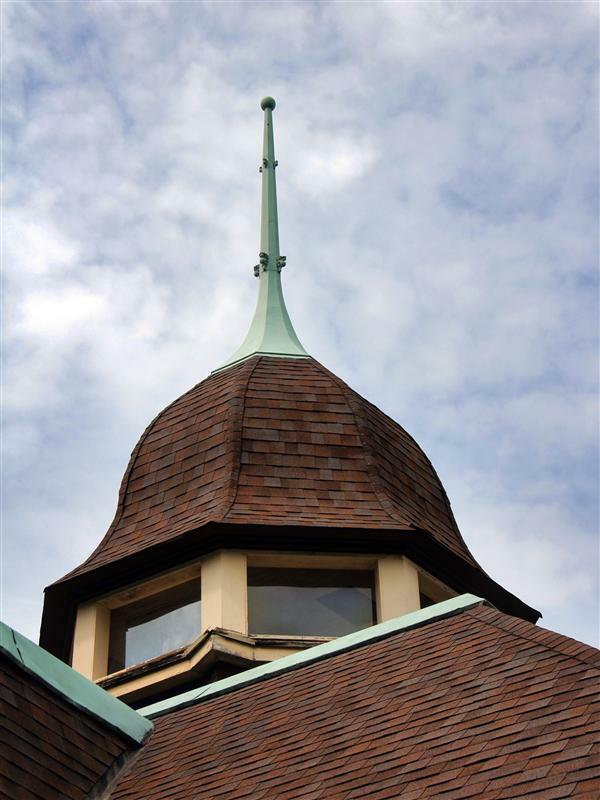 The Casino merged with the nearby Racquet and Swimming Club in 1935, shortly before the old clubhouse was torn down and took that name. 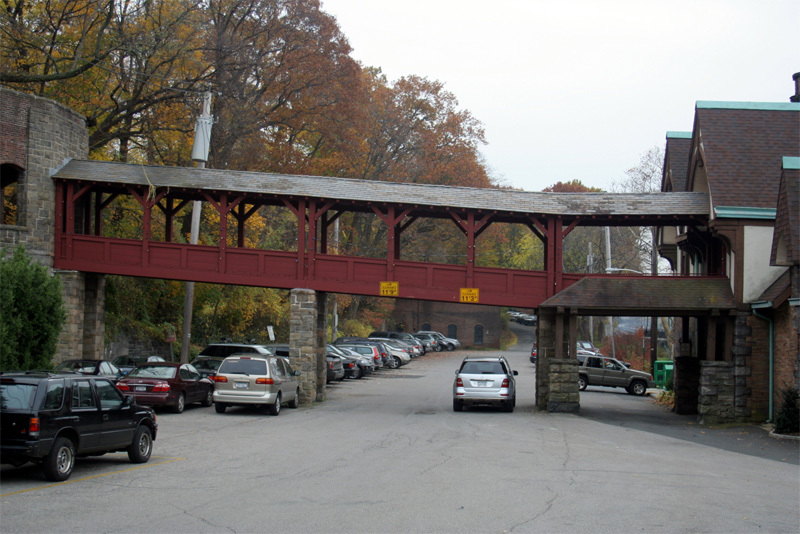 Pedestrian bridge that connected the Hudson House apartments to the train station, which was destroyed in 2010. 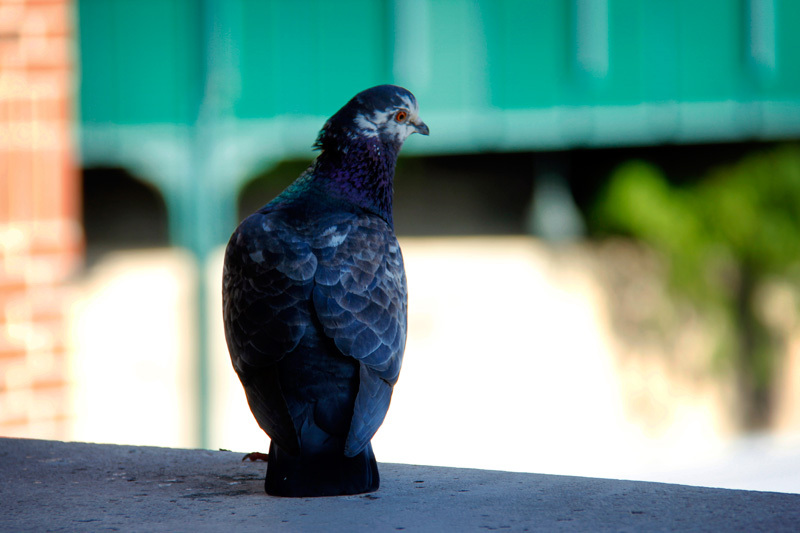 Photo by John Reidy. 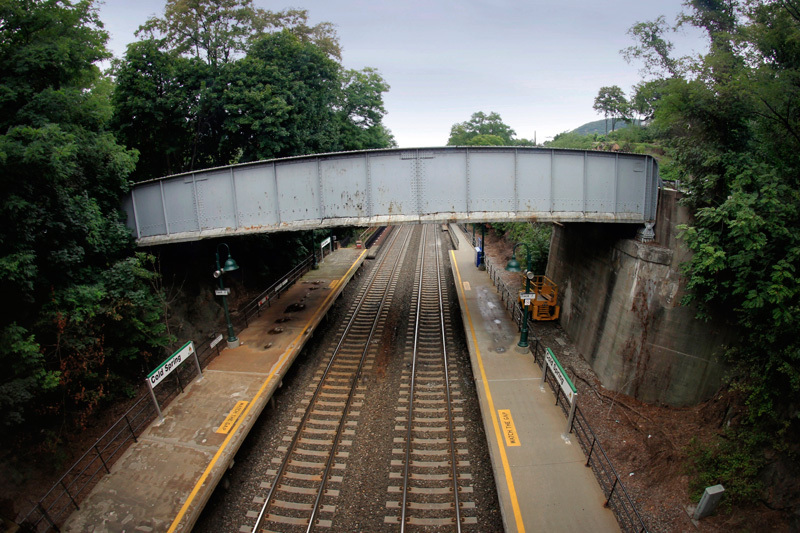 Aerial views of Ardsley-on-Hudson. 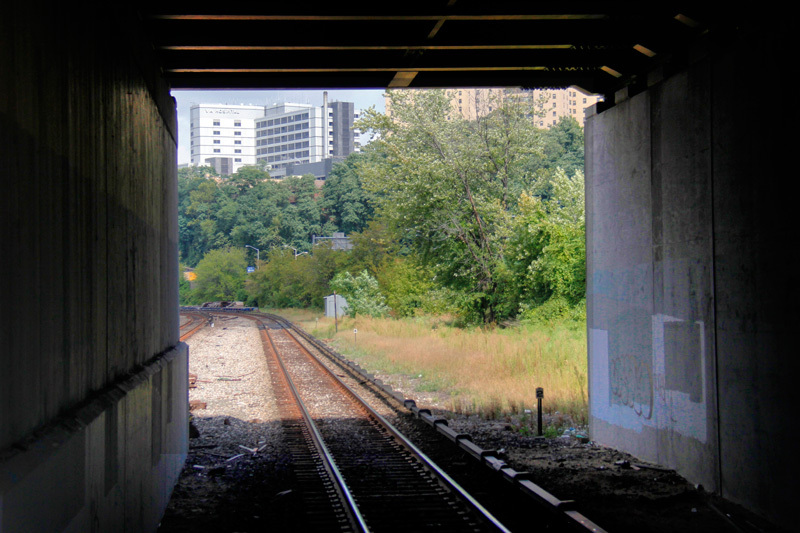 The one on the left is from 2004, the one on the right from 2010, shortly after the pedestrian bridge was destroyed. 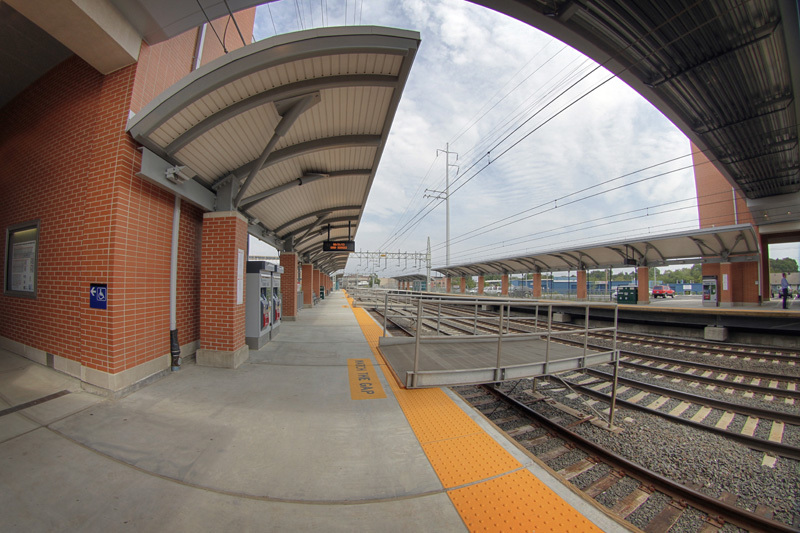 Note the differences in the station itself – the station was upgraded in the time between both photos. 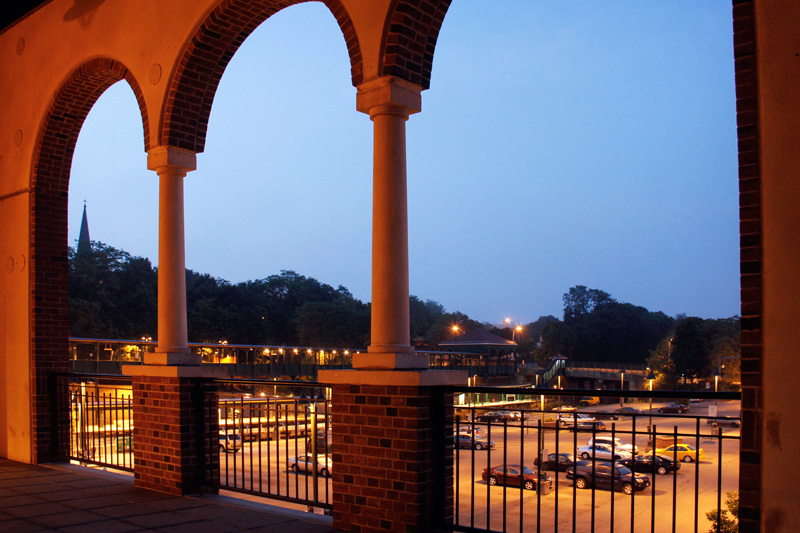 After the Casino was torn down, it was replaced with the Hudson House Apartments. 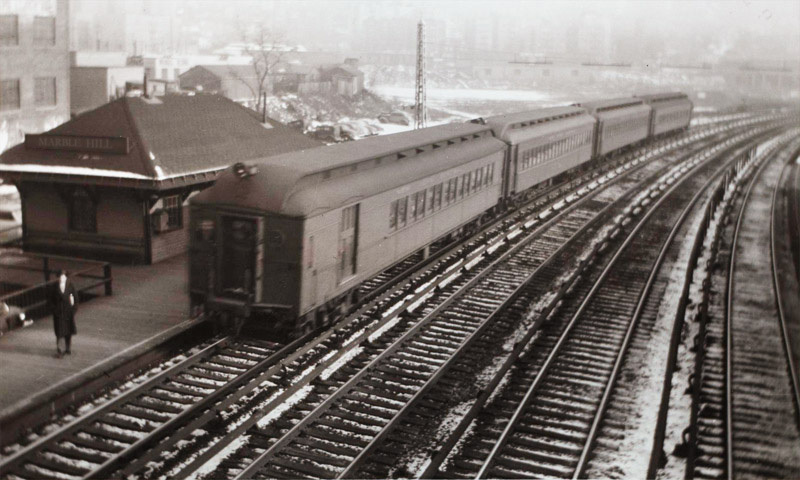 At one time there was a pedestrian bridge that connected the apartments directly to the train station. 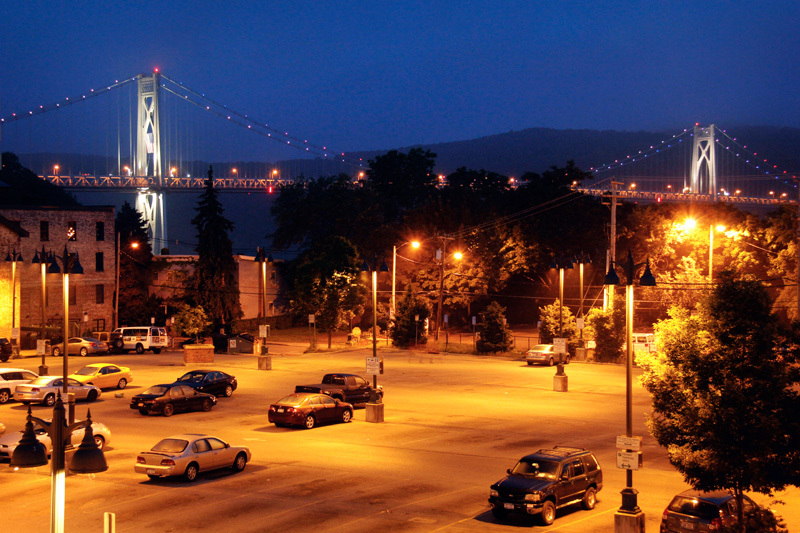 Unfortunately, the bridge was destroyed in 2010 when a sanitation driver crashed his dump truck into it. 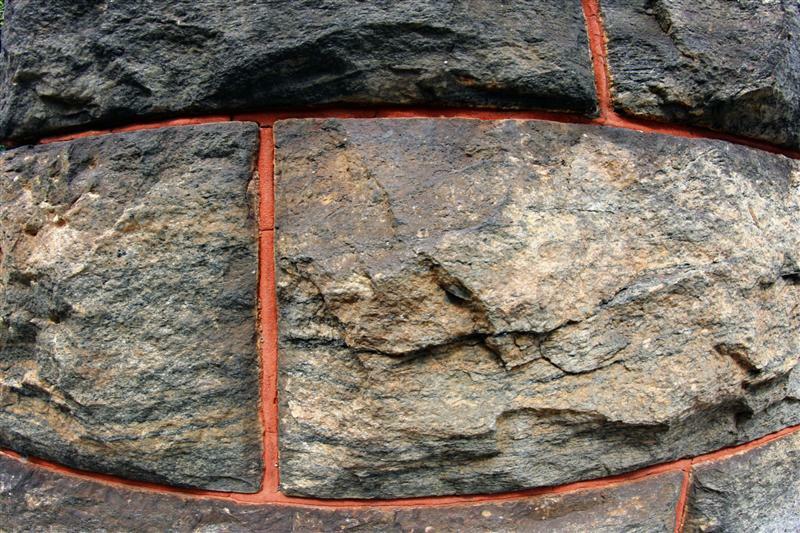 The historical bridge was never rebuilt. 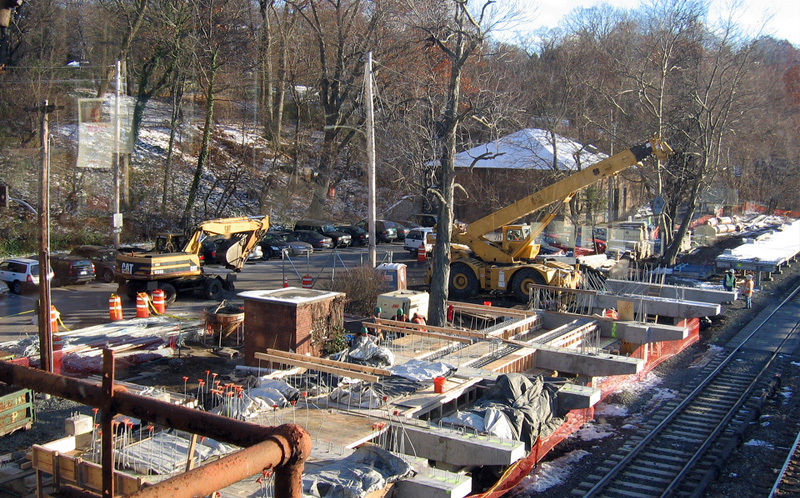 Construction at Ardsley-on-Hudson station in 2005 and 2006. 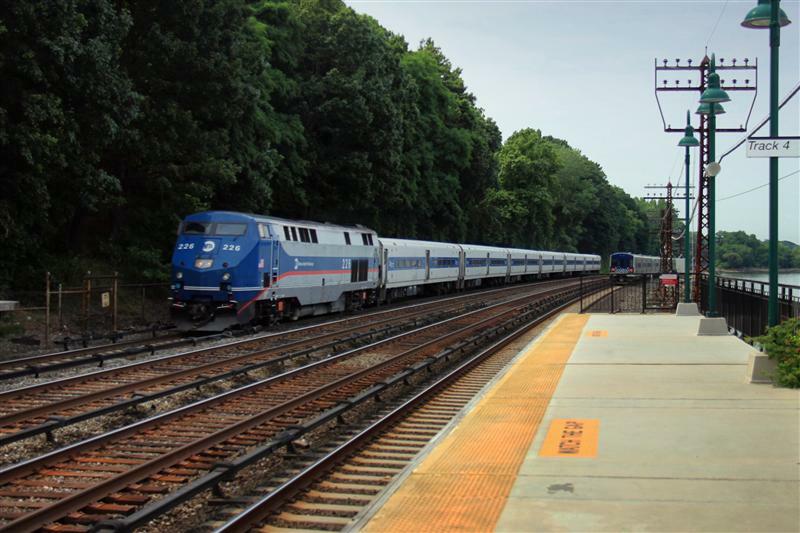 Photos by Henry C.
CSX at Ardsley-on-Hudson. 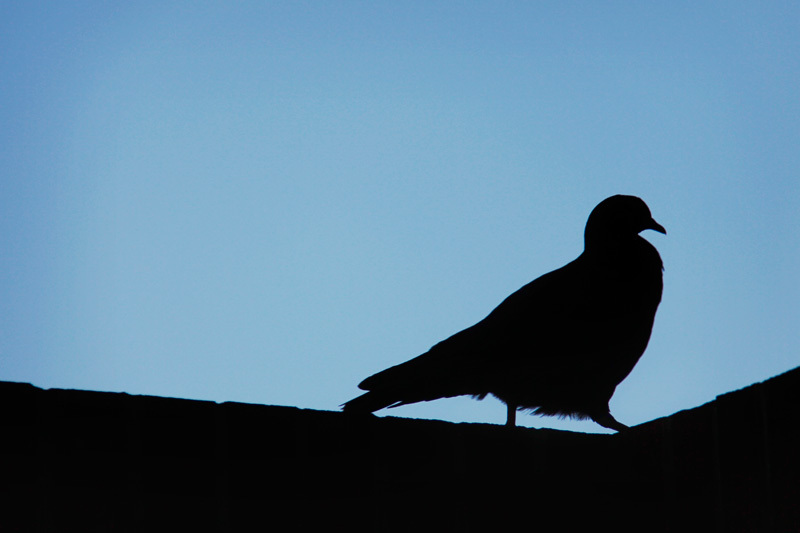 Photo by Michael Foley. 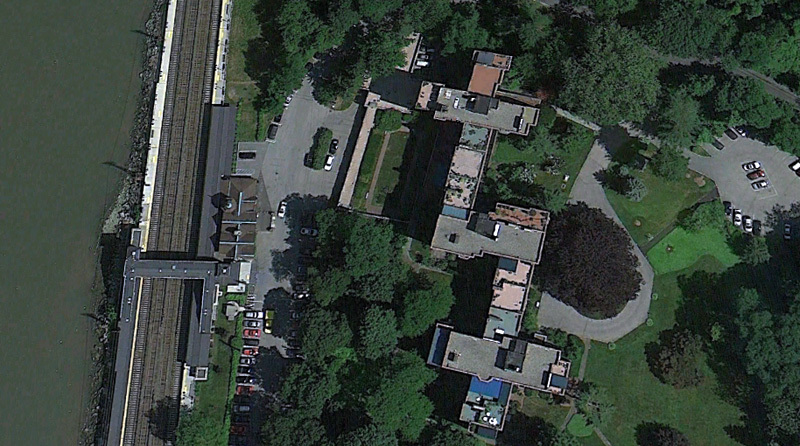 Though the original station building still exists, it is not used for any railroad functions. 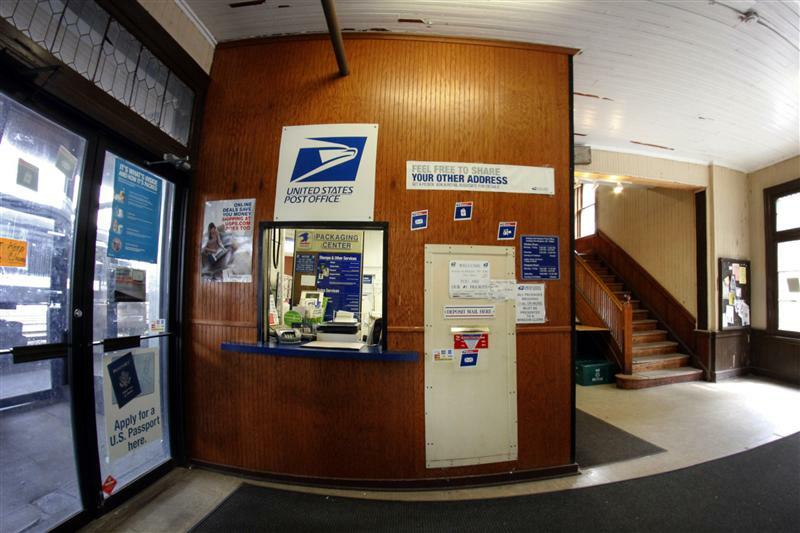 It is now the home of the Ardsley-on-Hudson post office, and contains rows of post office boxes. 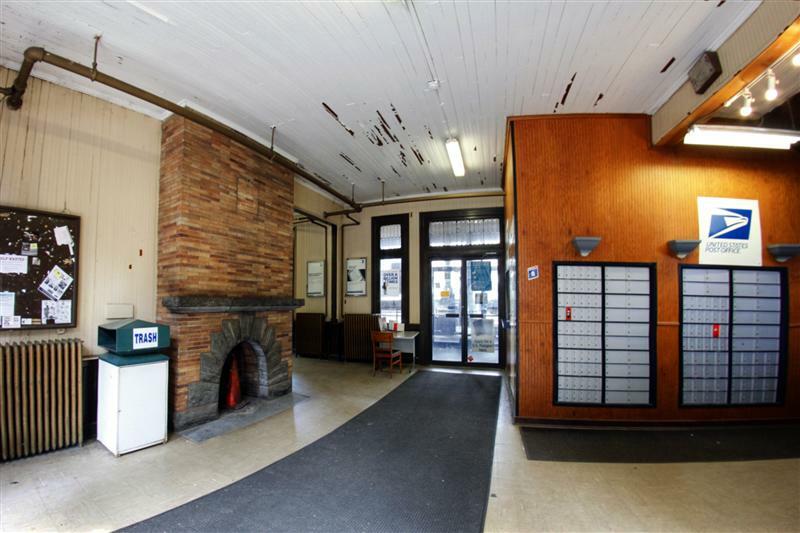 The original fireplaces built in the station are still there, but not used. You may not be able to buy your ticket here, but there still is a small area that one could probably use to wait for a train, and some bathrooms. 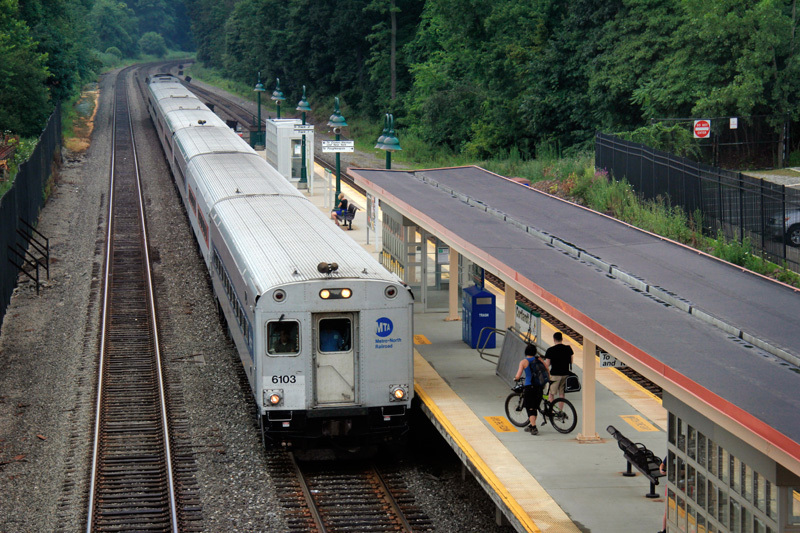 Like many of Metro-North’s Hudson Line stations, Ardsley-on-Hudson underwent considerable improvements in the past few years. 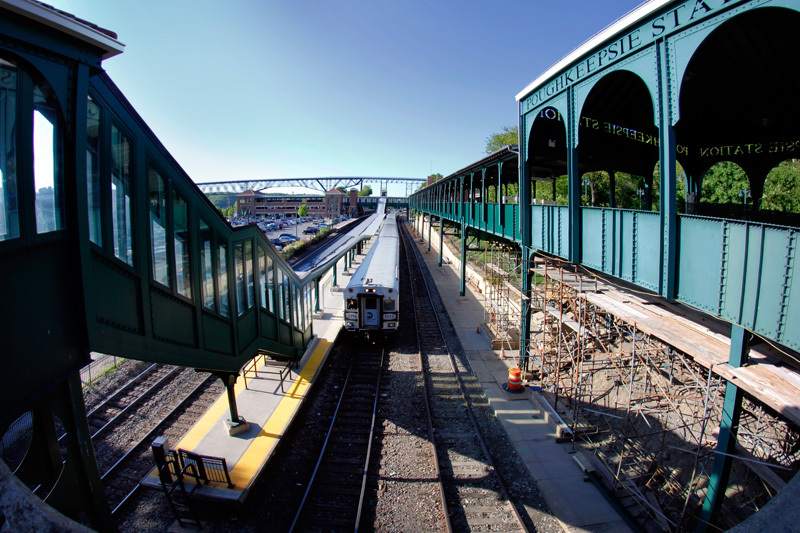 Ardsley-on-Hudson had its turn in 2005 and 2006, when a new overpass was built, as well as new platforms. 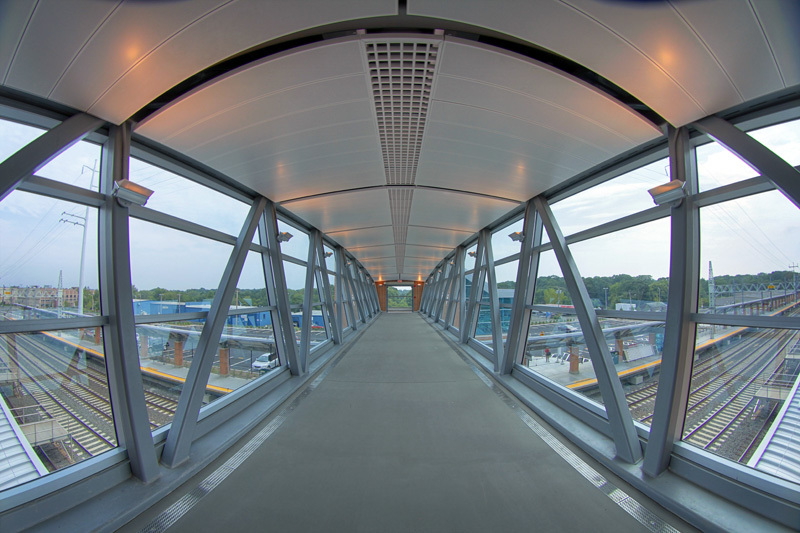 Canopies were added to much of the platform to protect riders from the elements, which are visible in the aerial shot above. 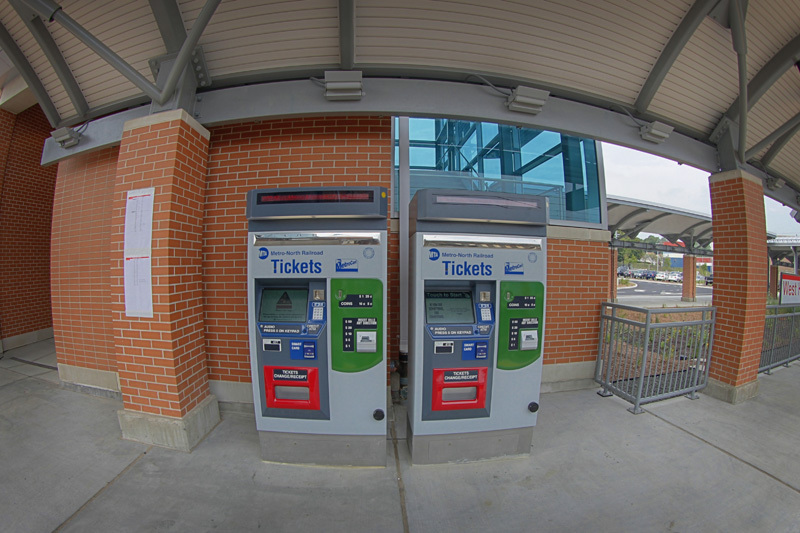 Ticket Vending Machines were installed in the new overpass. 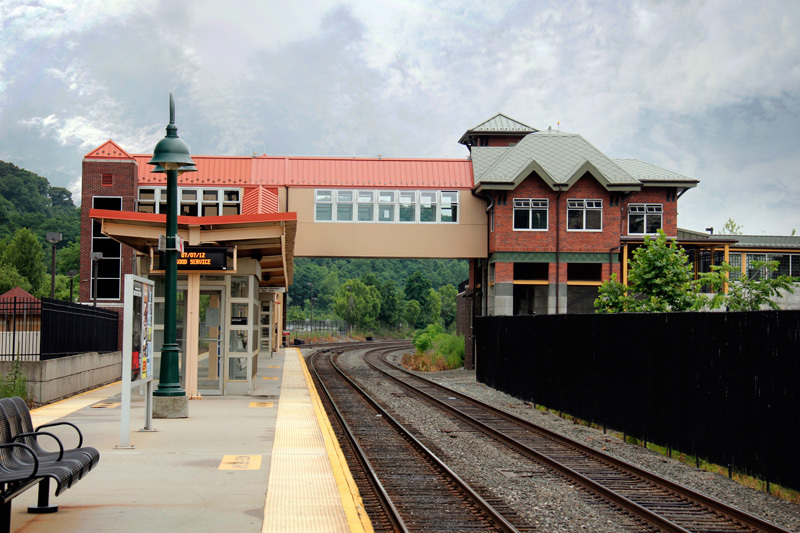 All in all, Ardsley-on-Hudson is a pretty nice station. 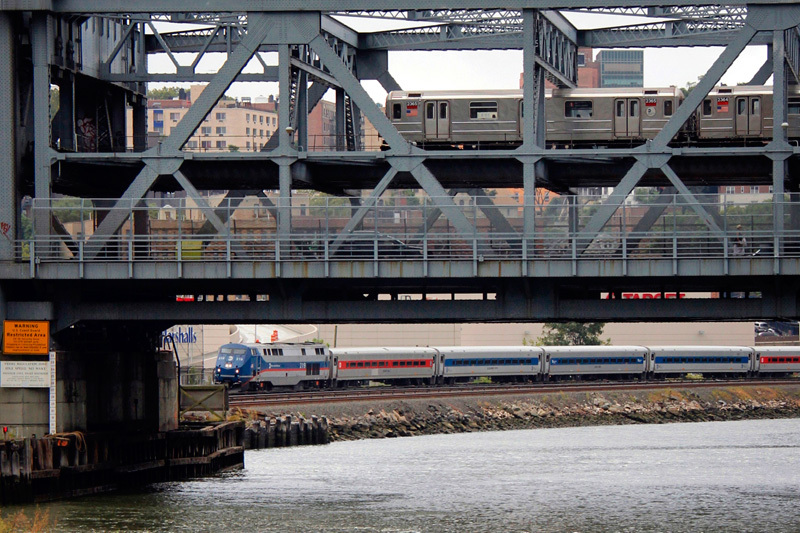 It has a bit of history, and being right on the Hudson River always looks nice. 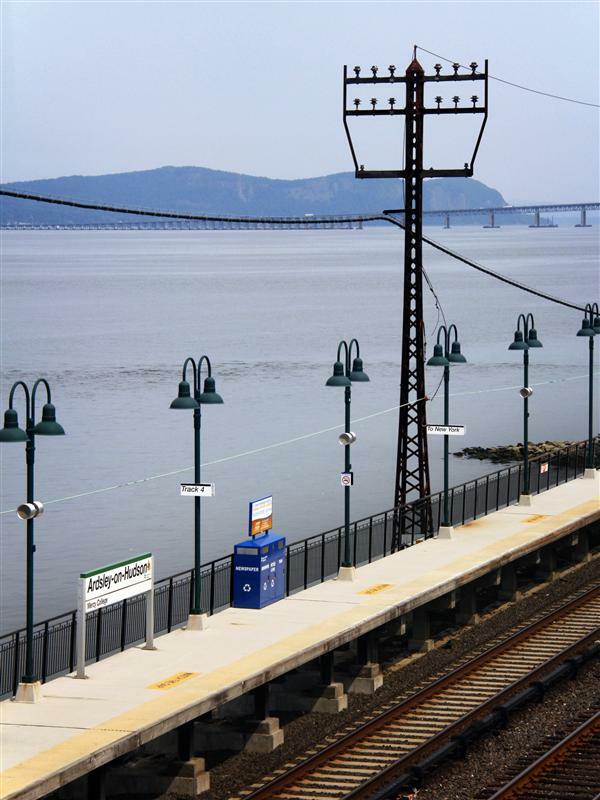 From the station you can see the Tappan Zee Bridge to the north, and just barely make out the George Washington Bridge in the far south on a clear day. 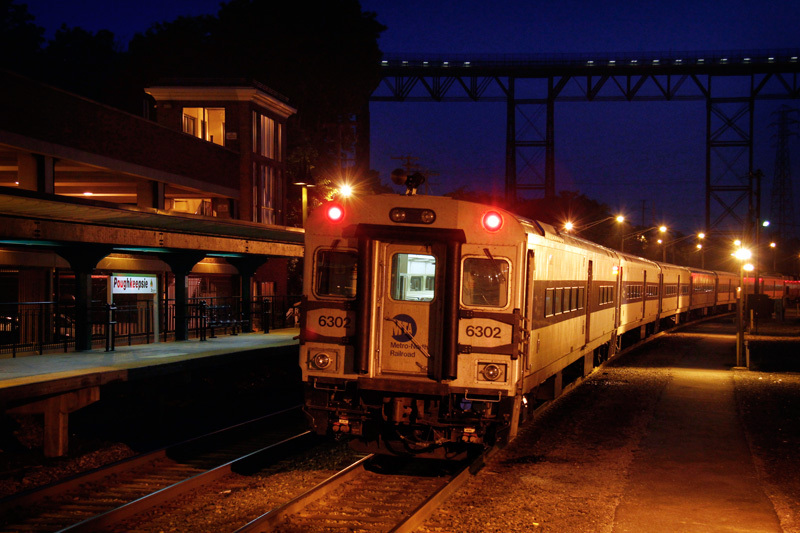 If you ever find yourself on the Hudson Line, Ardsley-on-Hudson would always be an interesting station to check out!